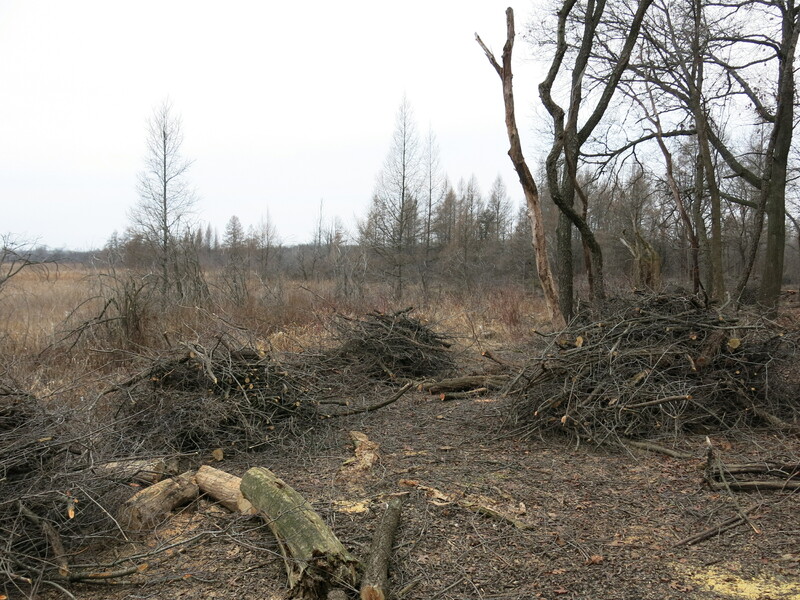 I would never ask for money on my own, but The Buckthorn Man, on the other hand, thinks you might feel an obligation, and he asked me to help call in his chits. 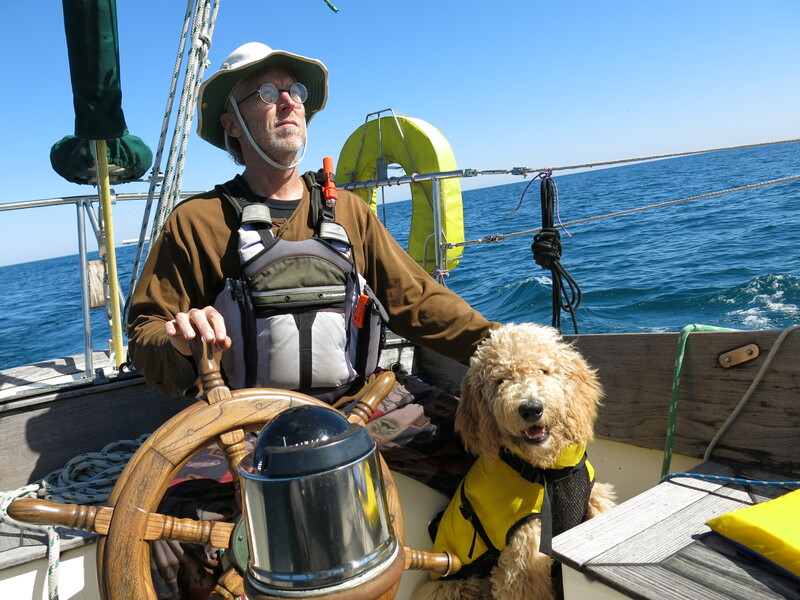 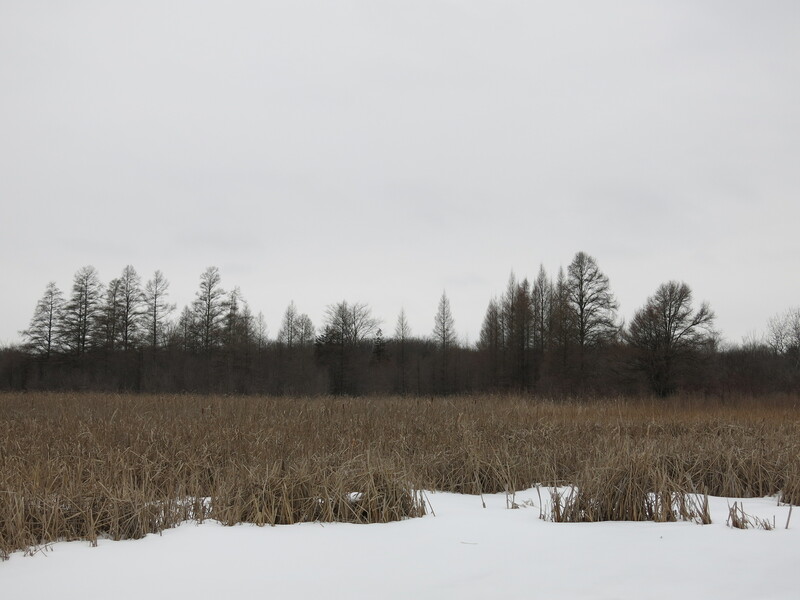 Please participate in his fund raising campaign for the Wisconsin Wetlands Association Inc. by clicking here and making a donation to support this worthy organization’s efforts. 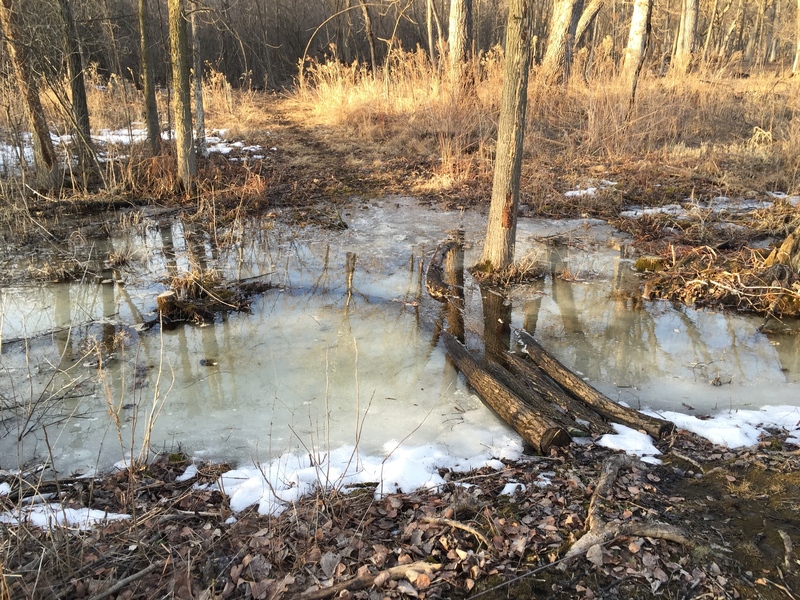 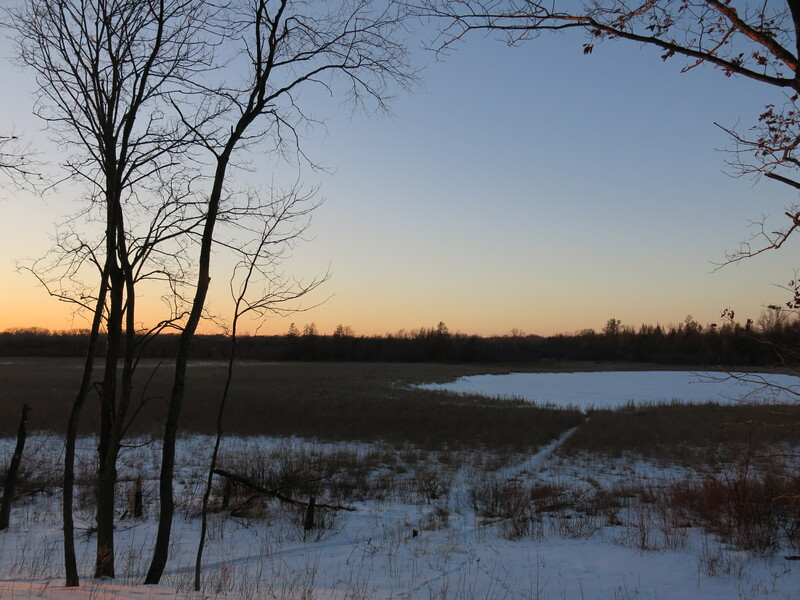 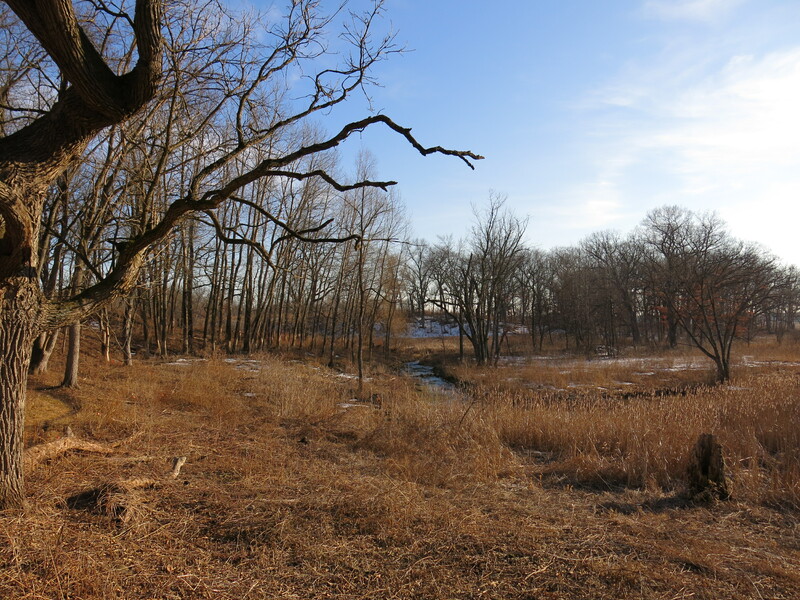 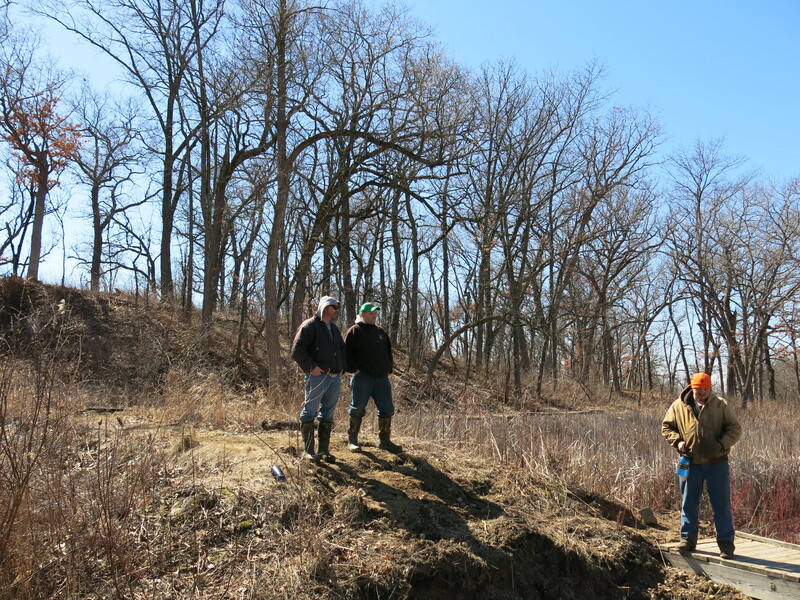 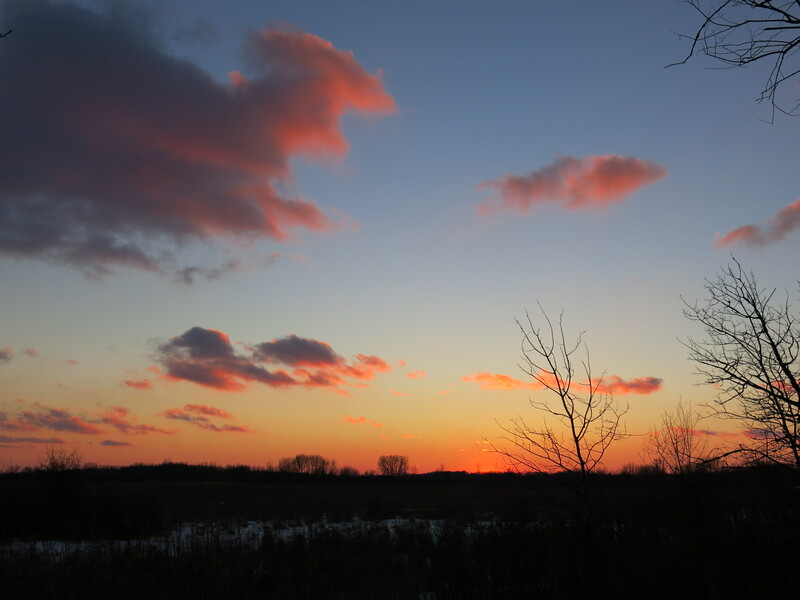 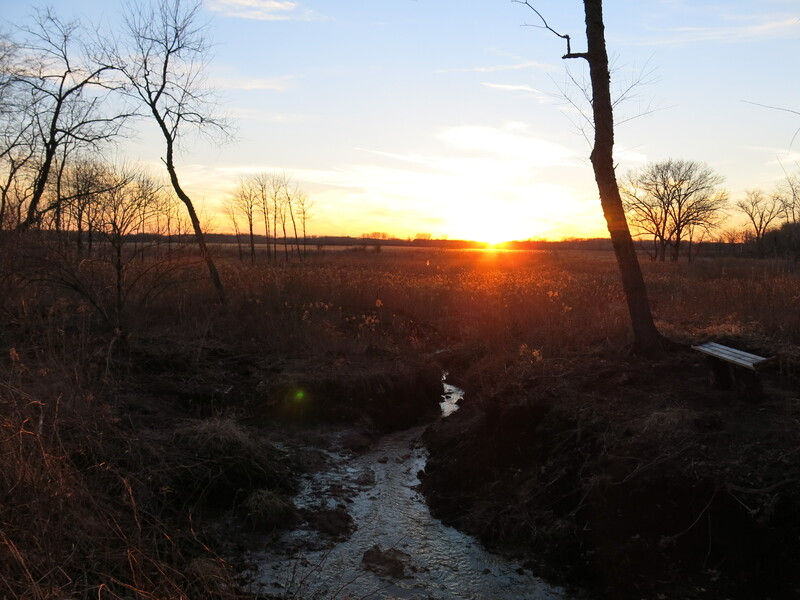 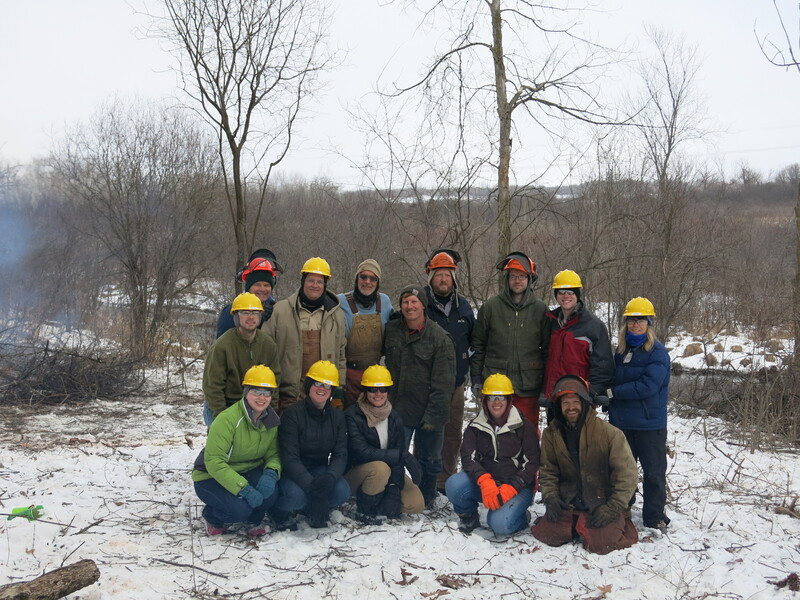 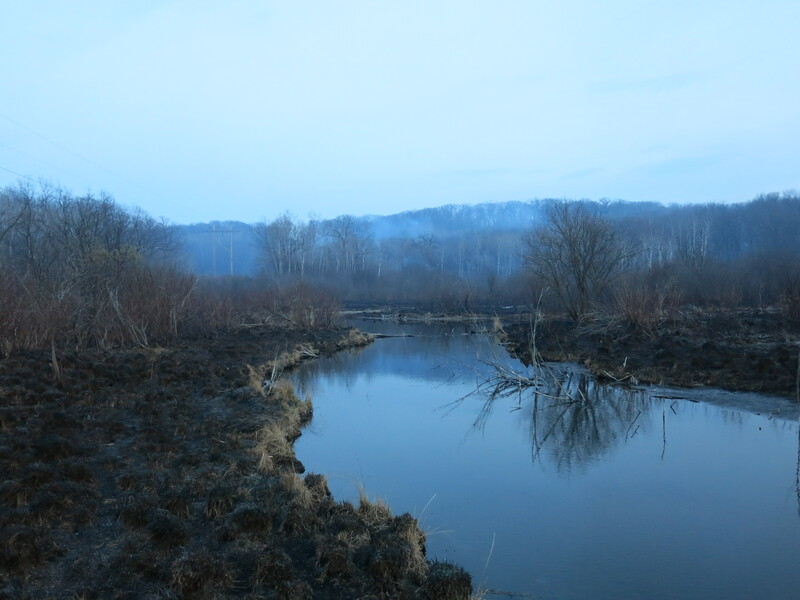 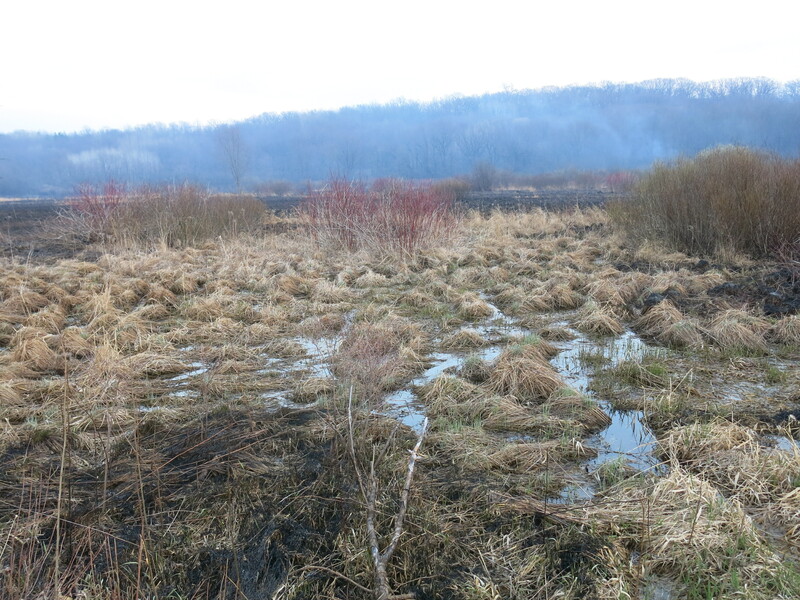 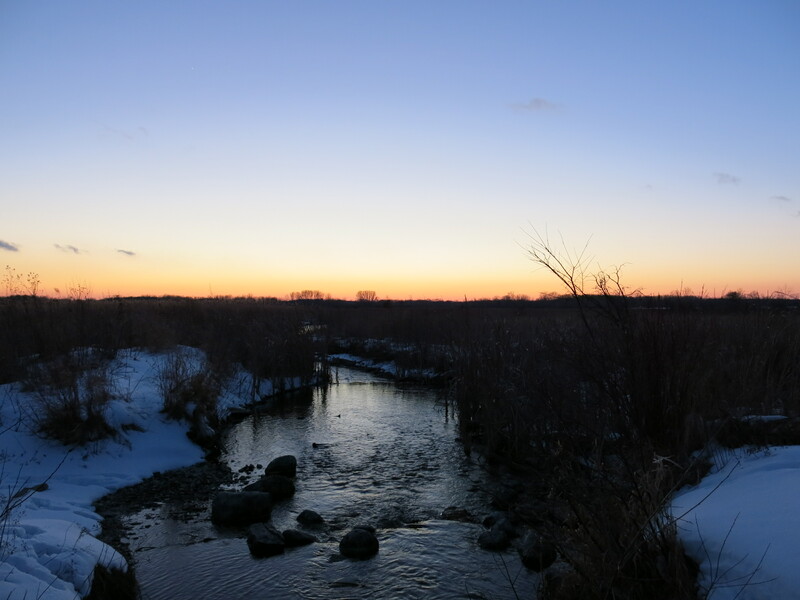 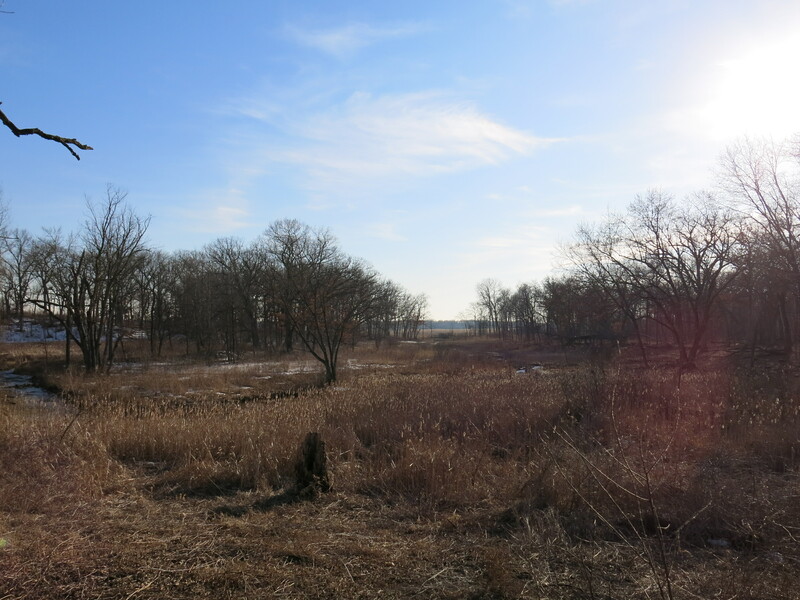 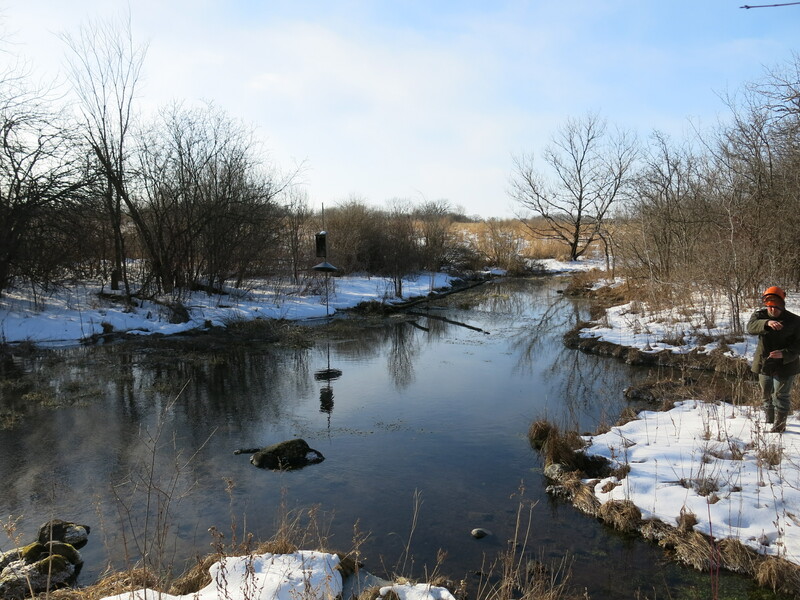 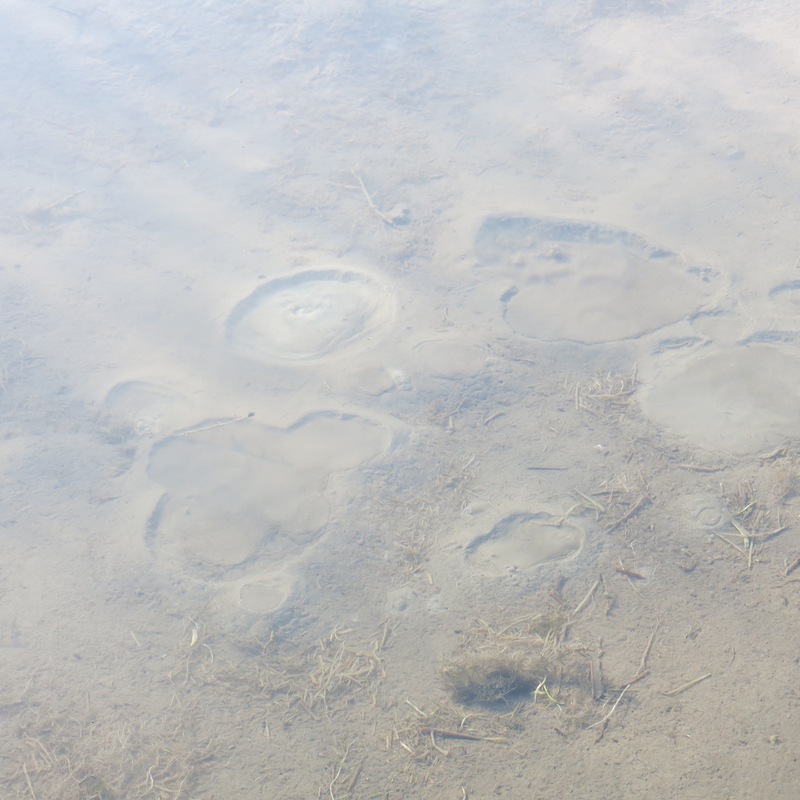 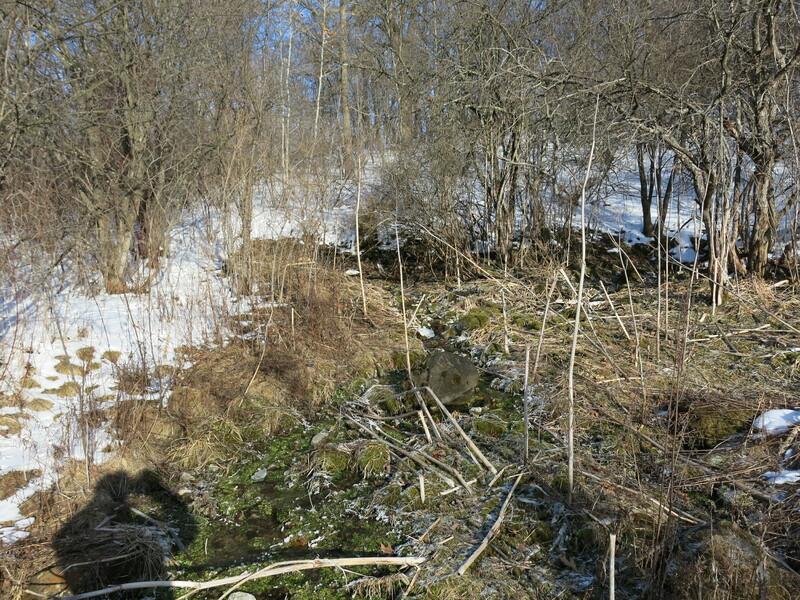 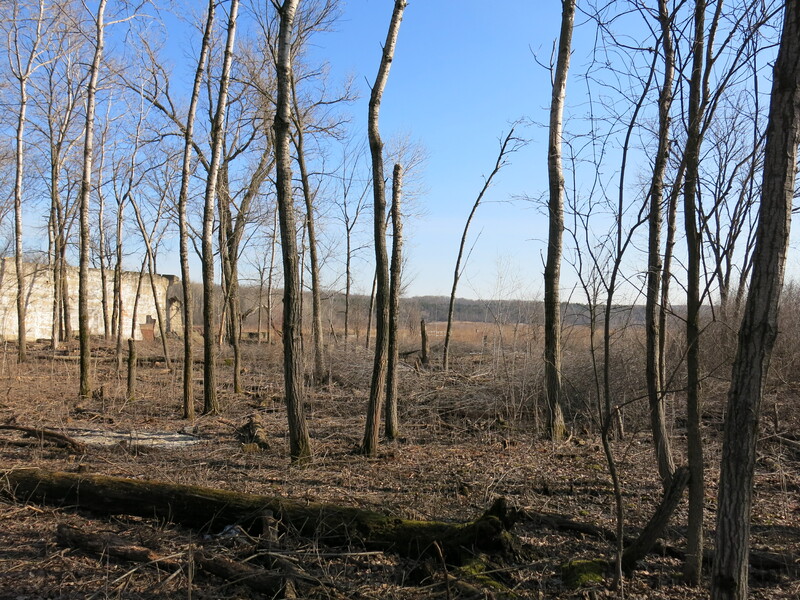 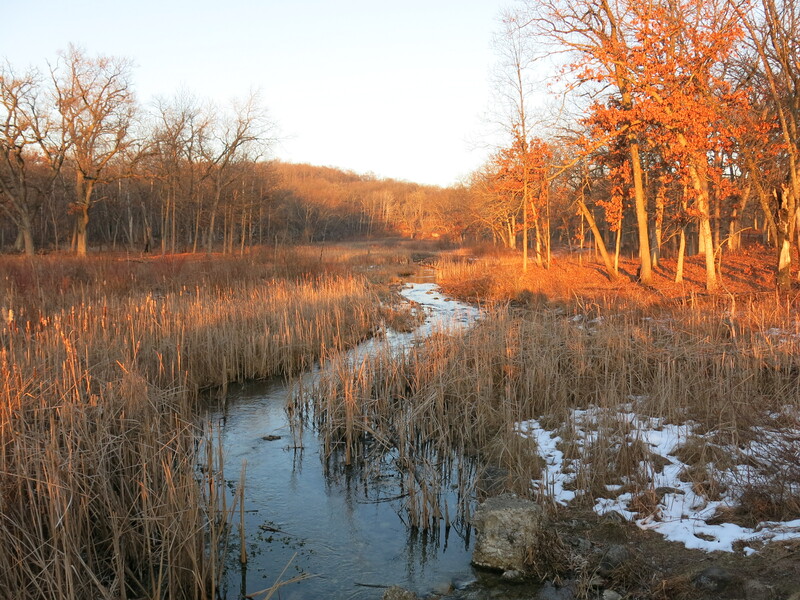 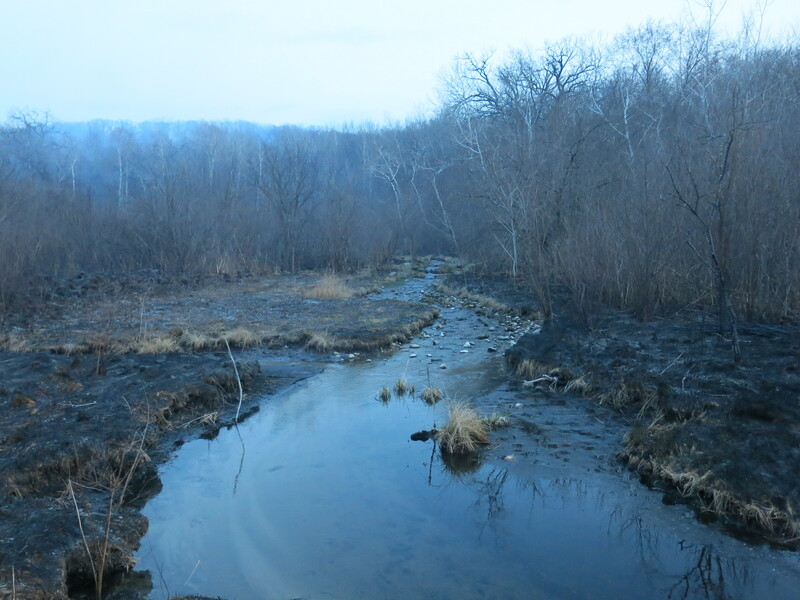 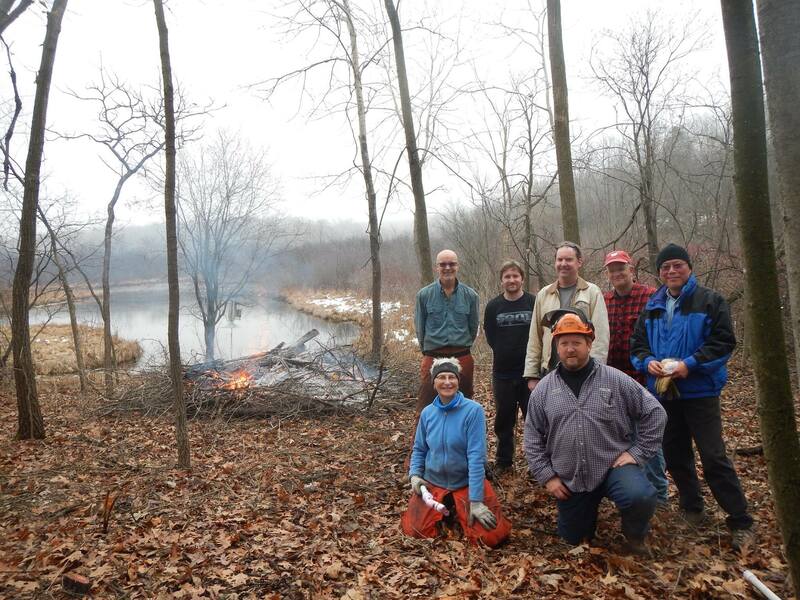 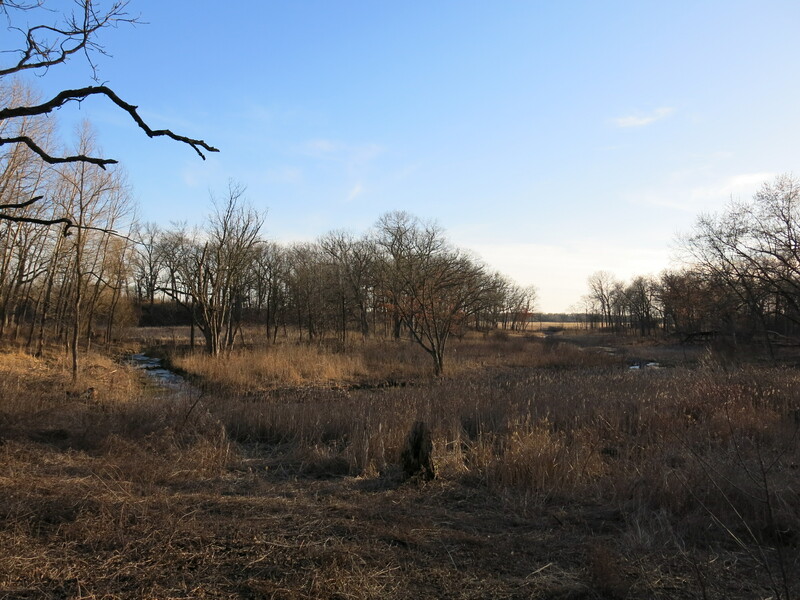 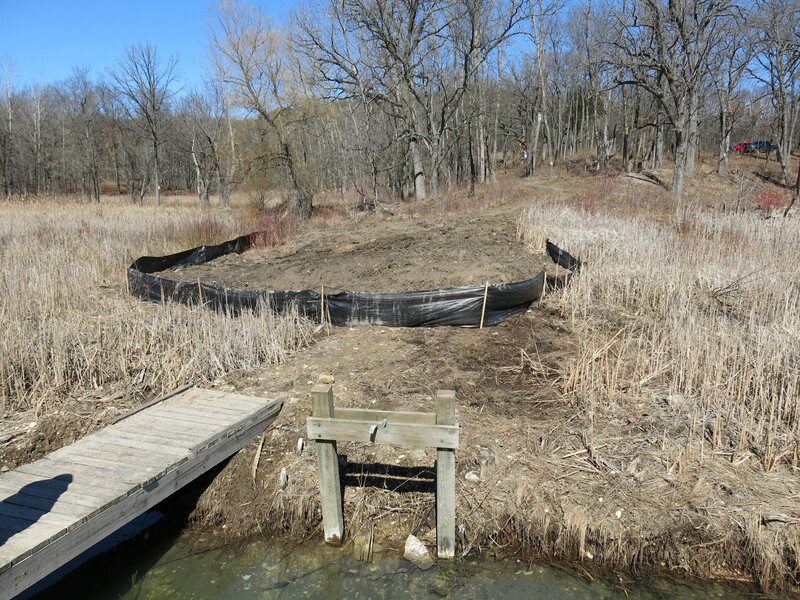 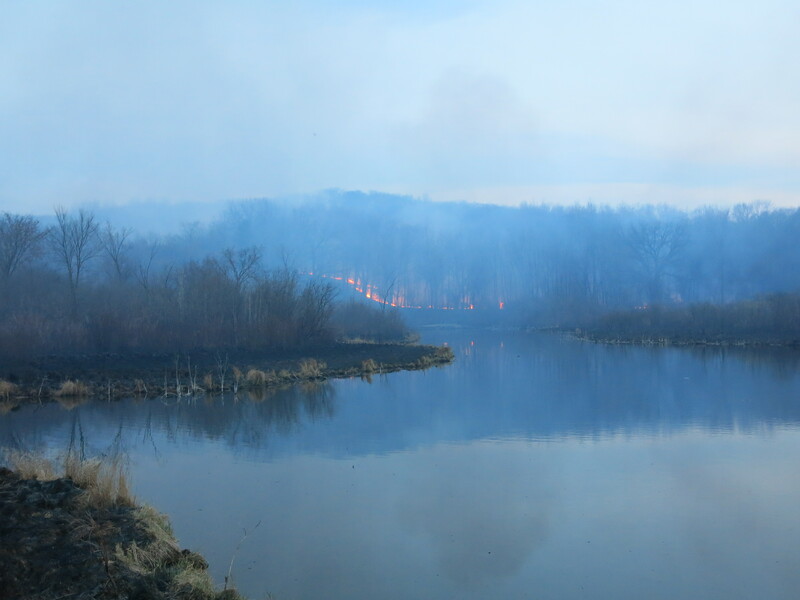 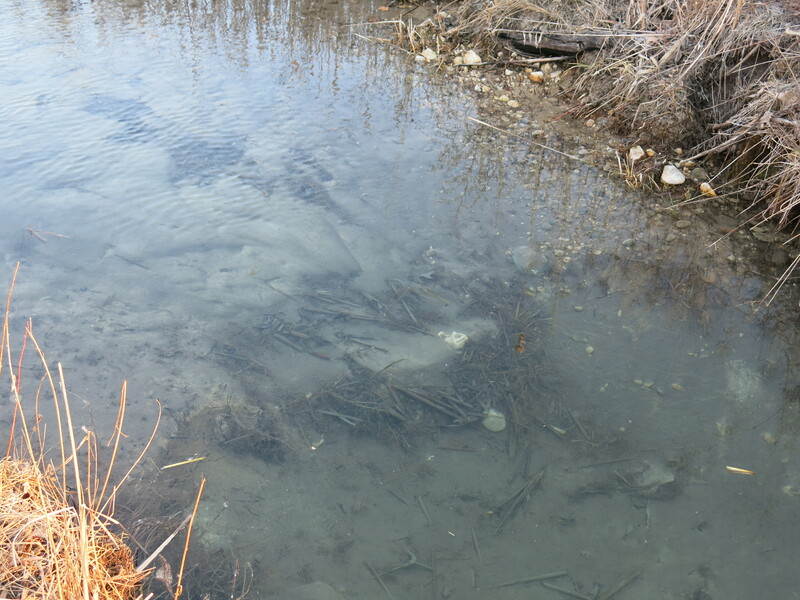 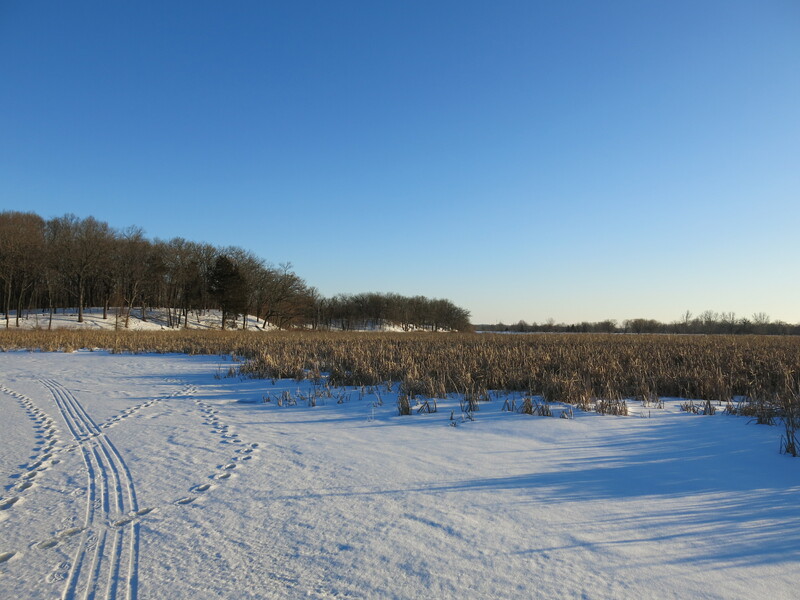 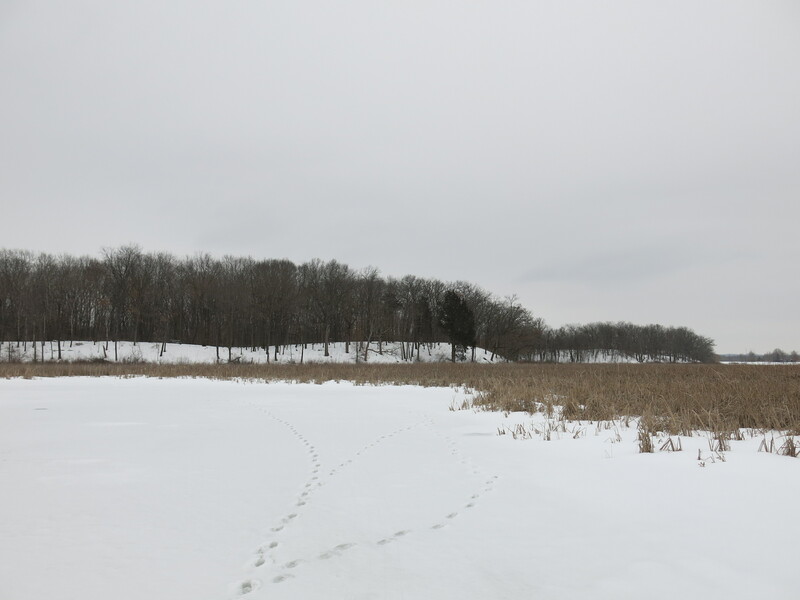 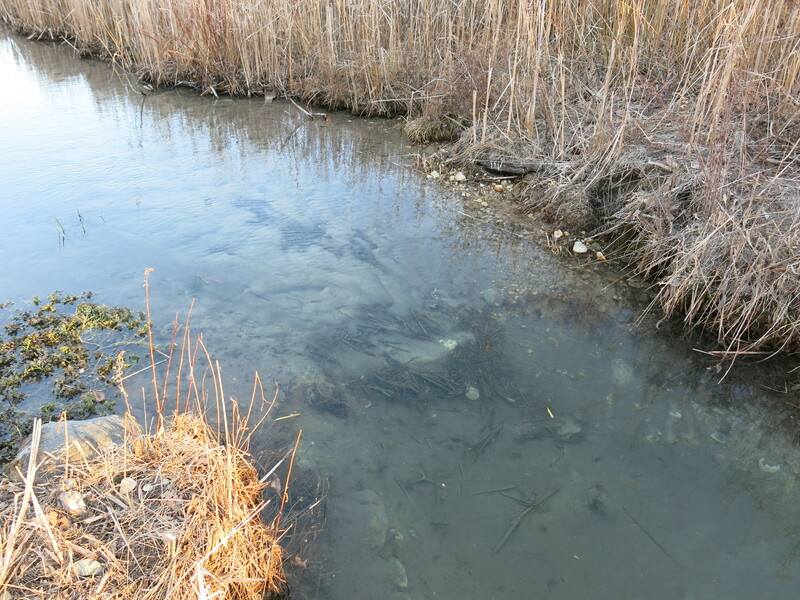 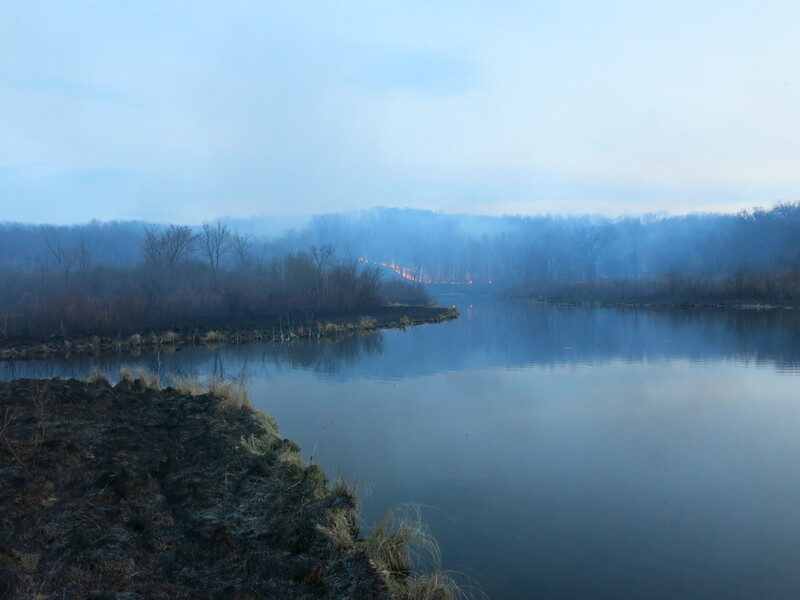 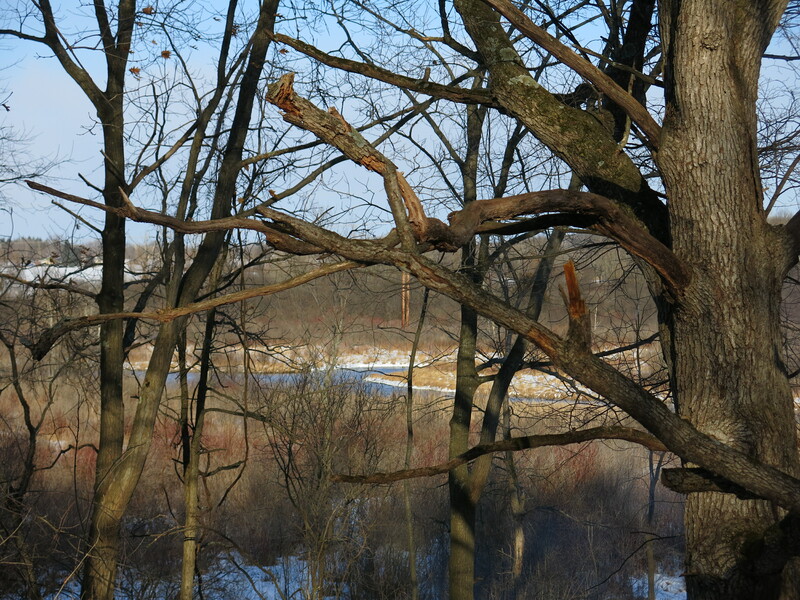 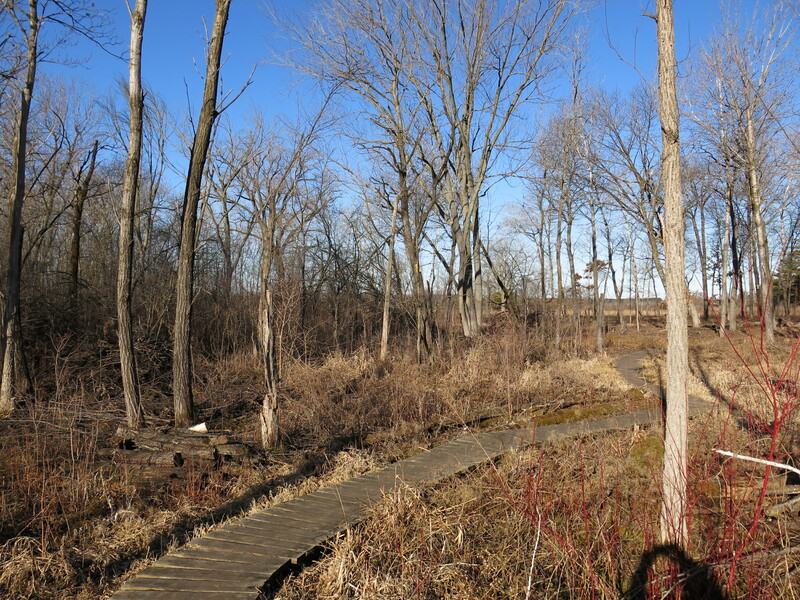 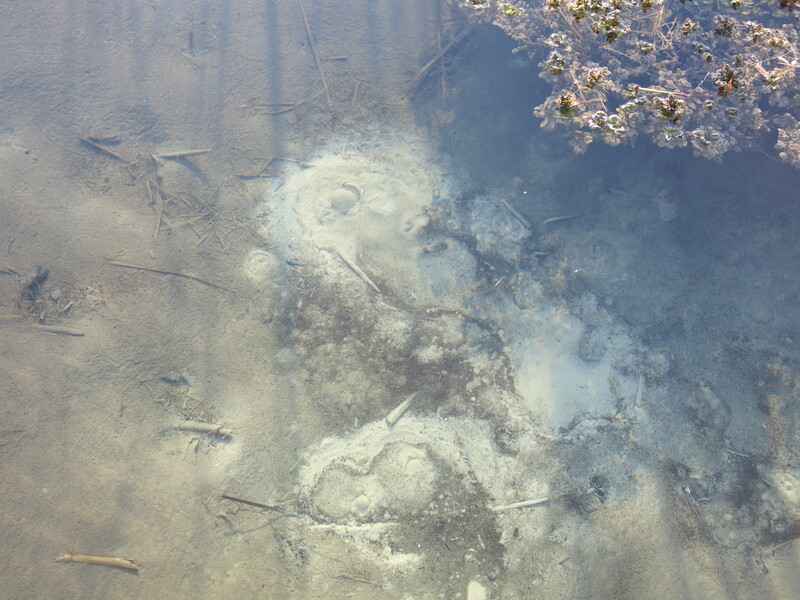 We have featured the Wisconsin Wetlands Association here and here and they have been a real inspiration for our restoration efforts at The Springs. 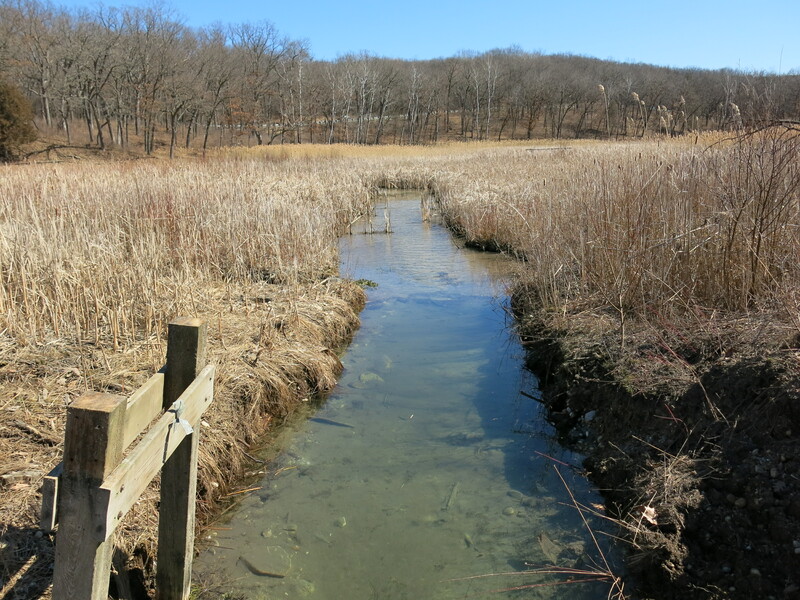 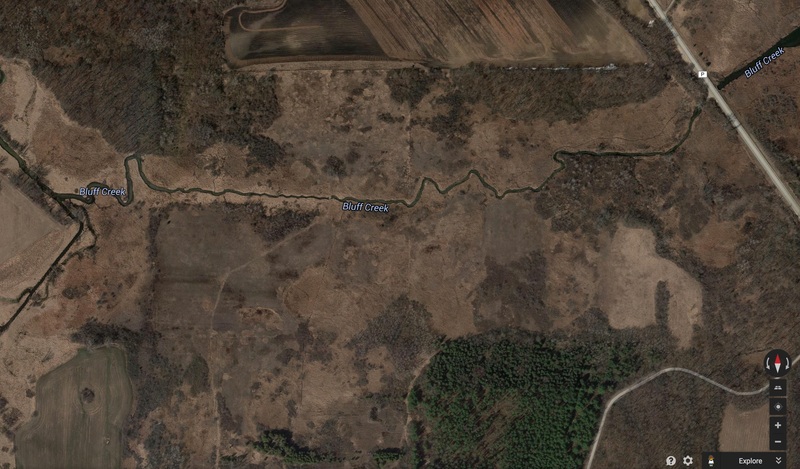 Zach Kastern and Ginny Coburn are leading another State Natural Areas Volunteer workday at the headwaters of Bluff Creek, near Lone Tree Bluff, this Saturday from 9-noon. 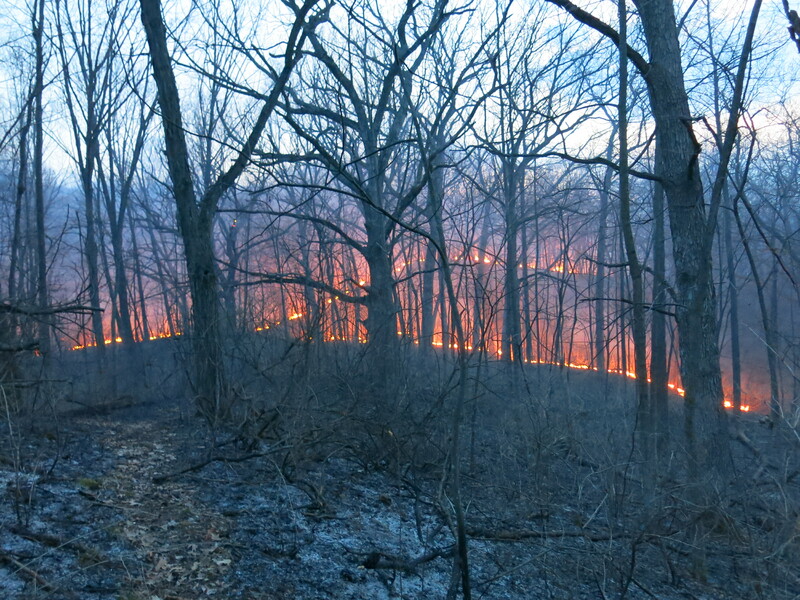 There will be Fire! 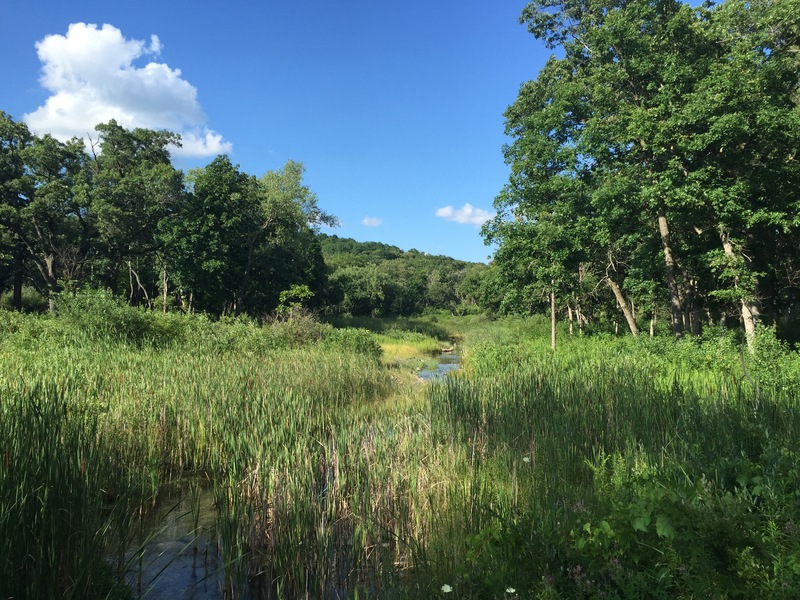 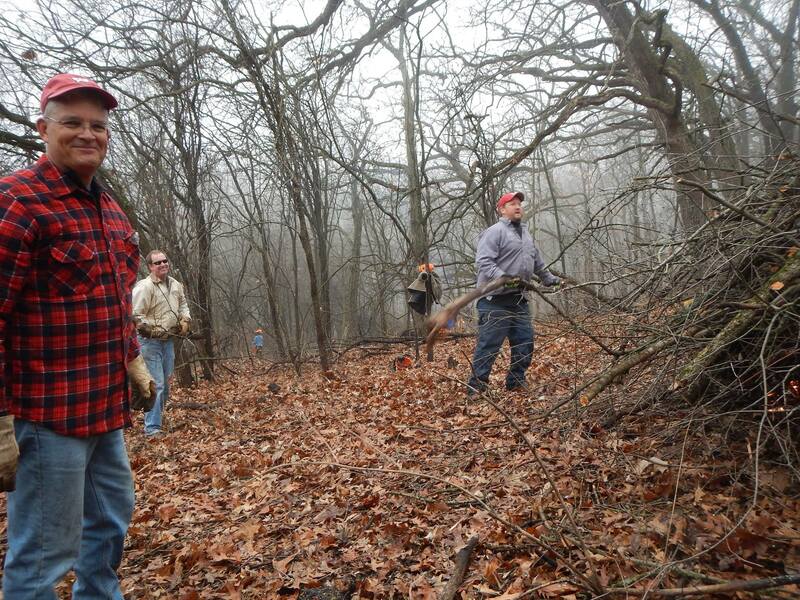 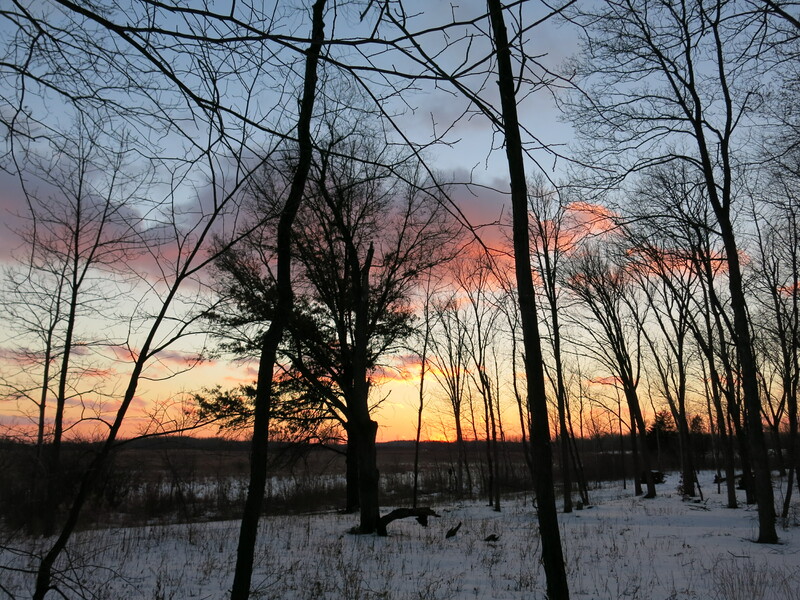 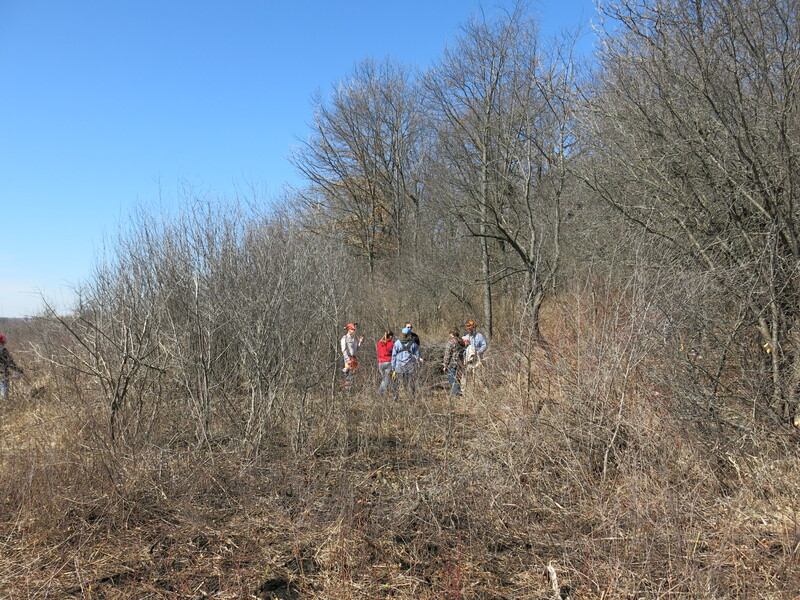 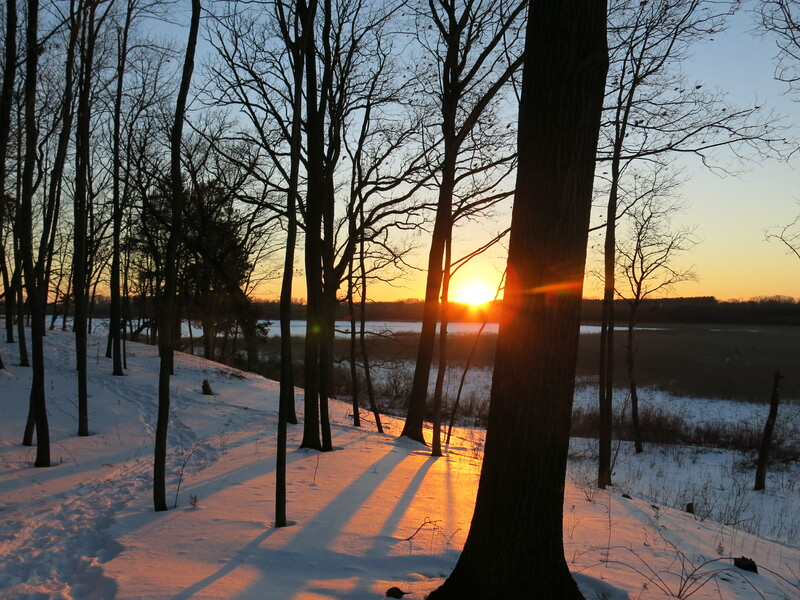 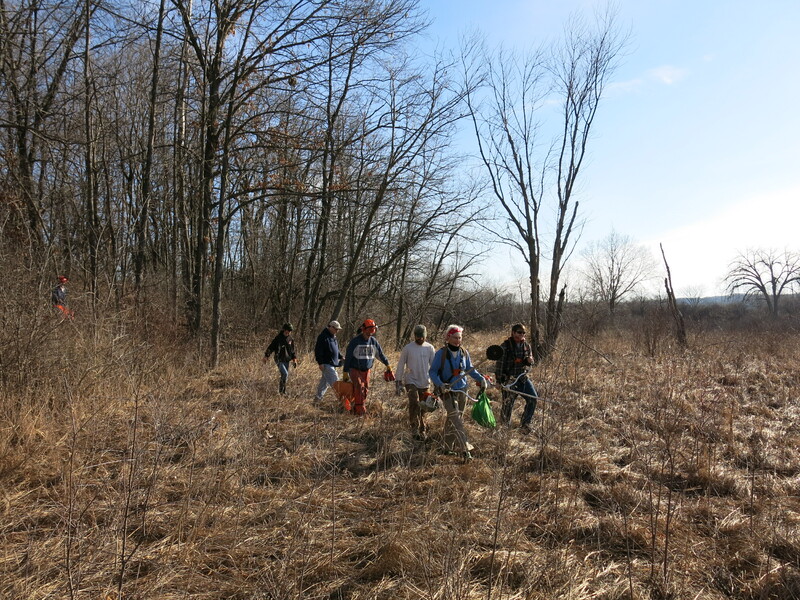 The Wisconsin DNR’s State Natural Areas Volunteer Program is a great way to become intimately familiar with some of Wisconsin’s most beautiful places. 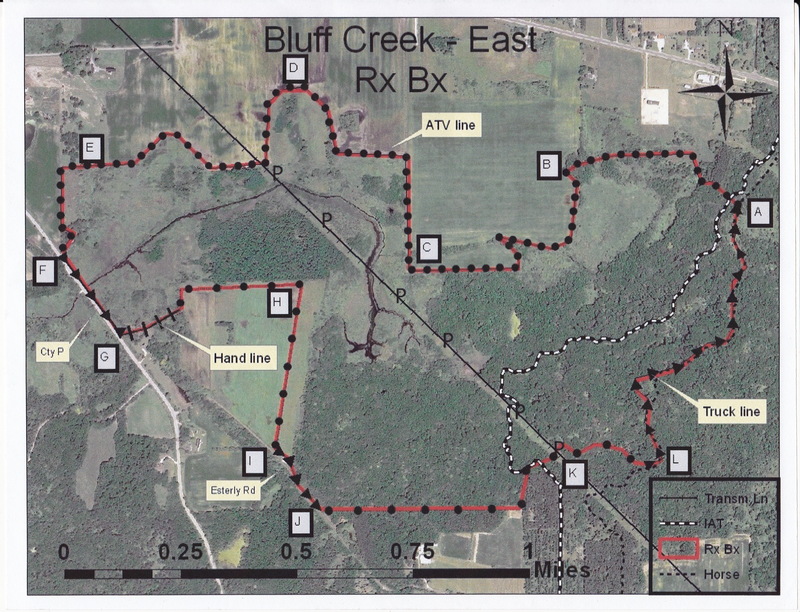 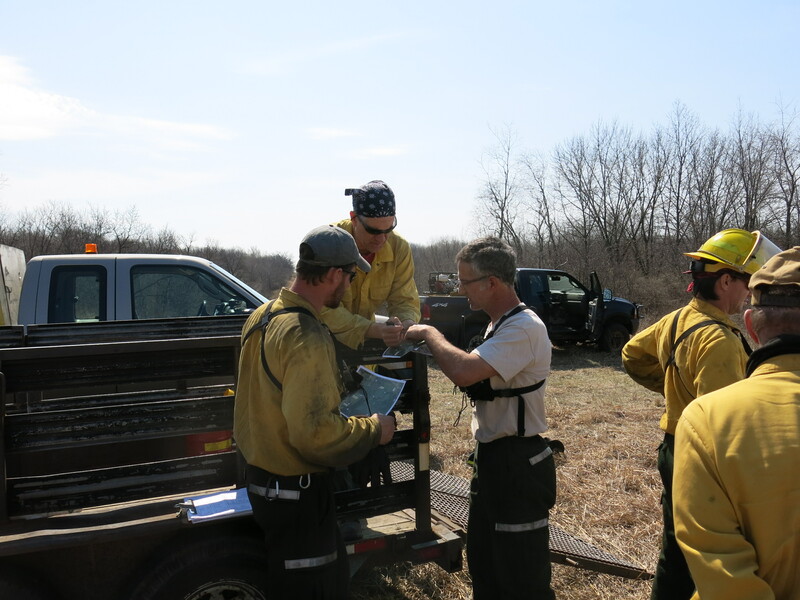 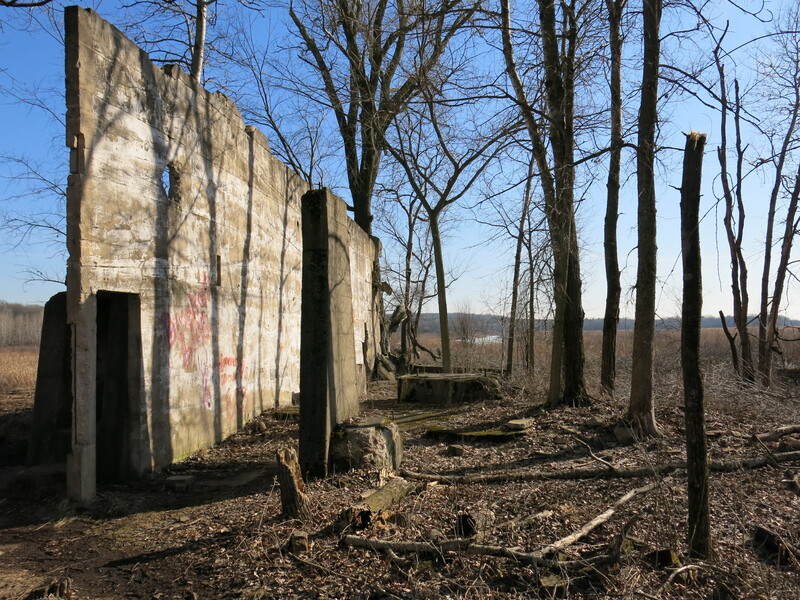 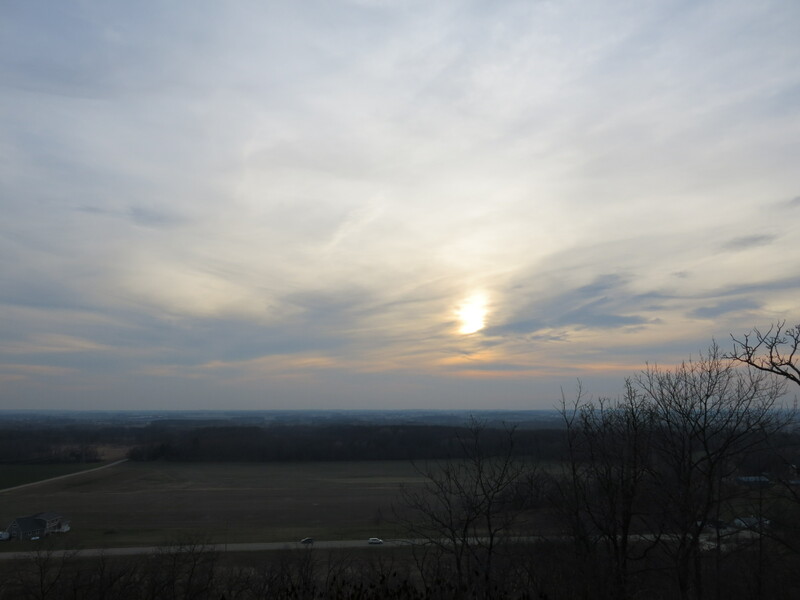 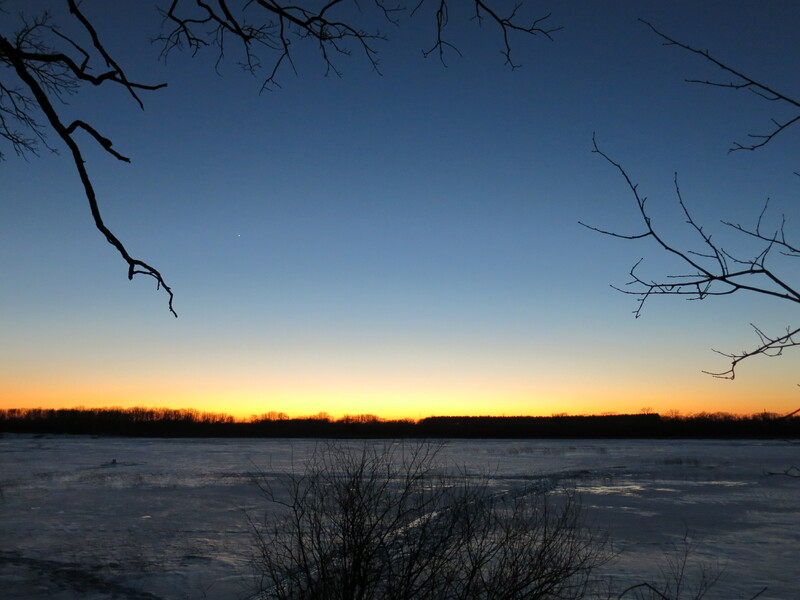 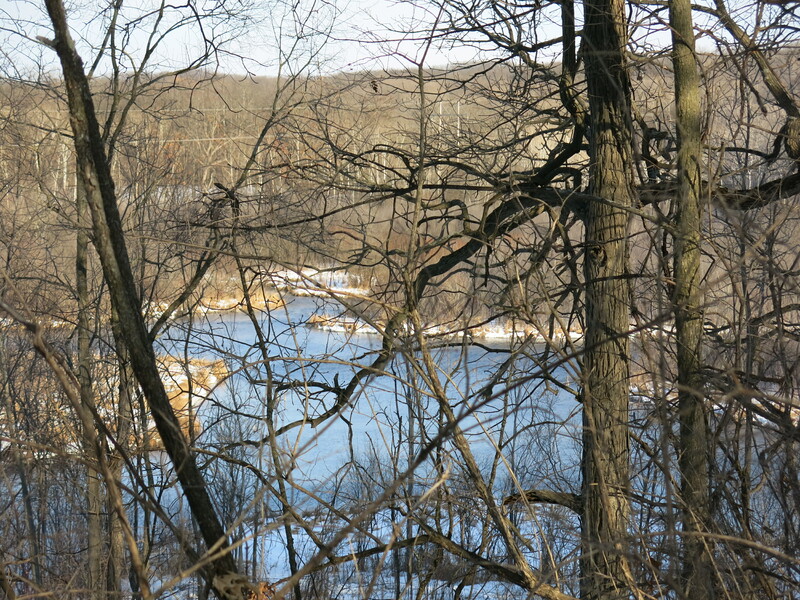 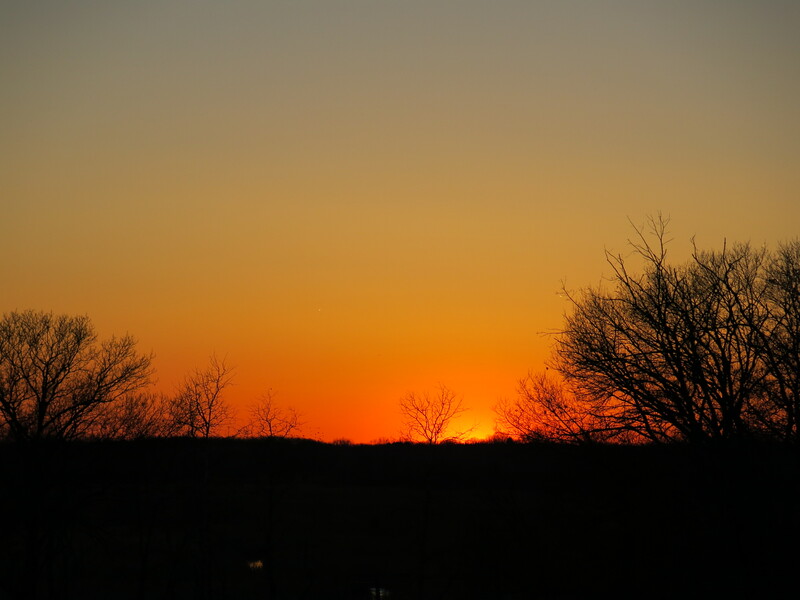 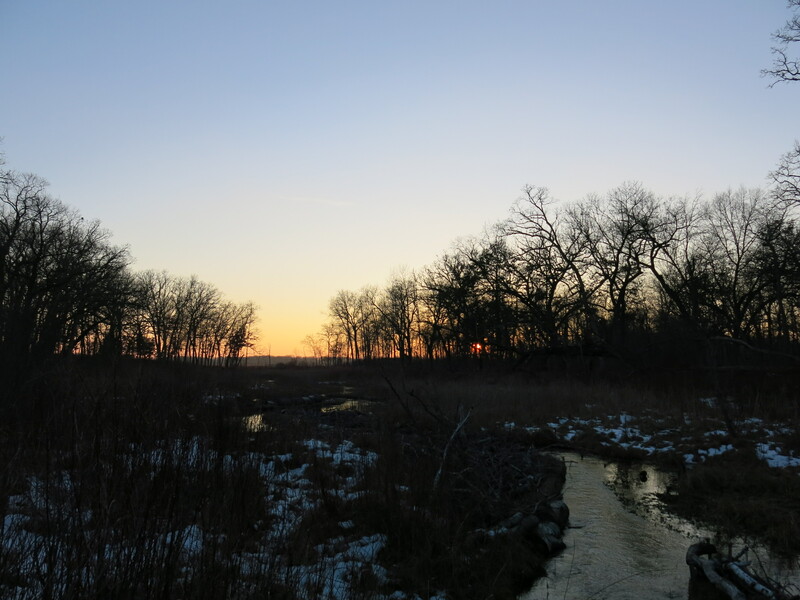 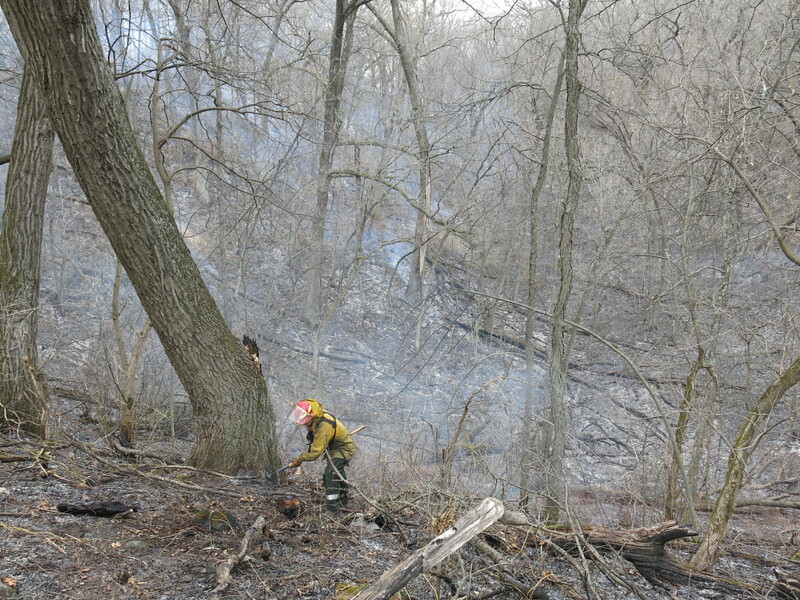 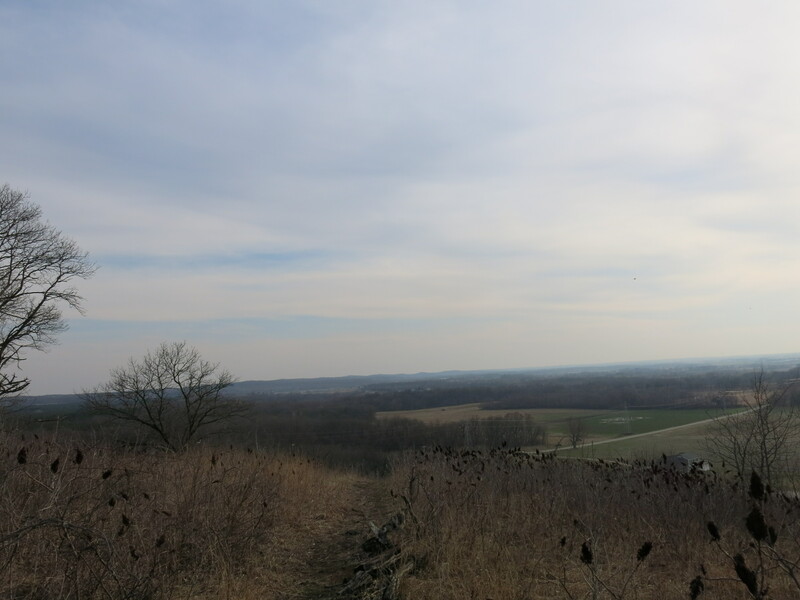 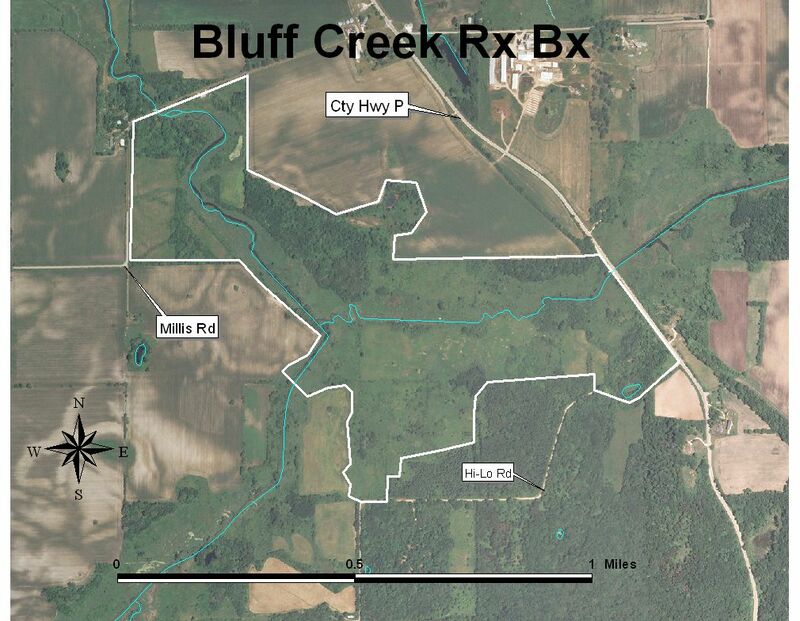 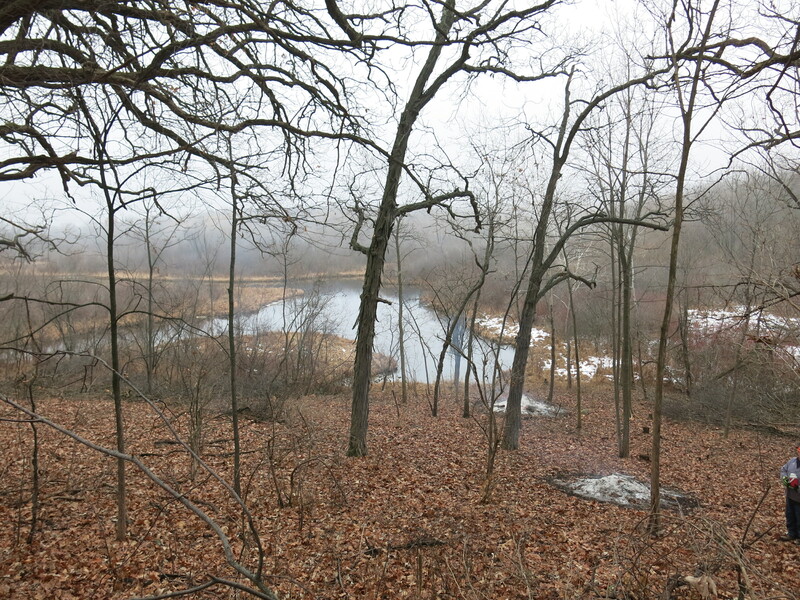 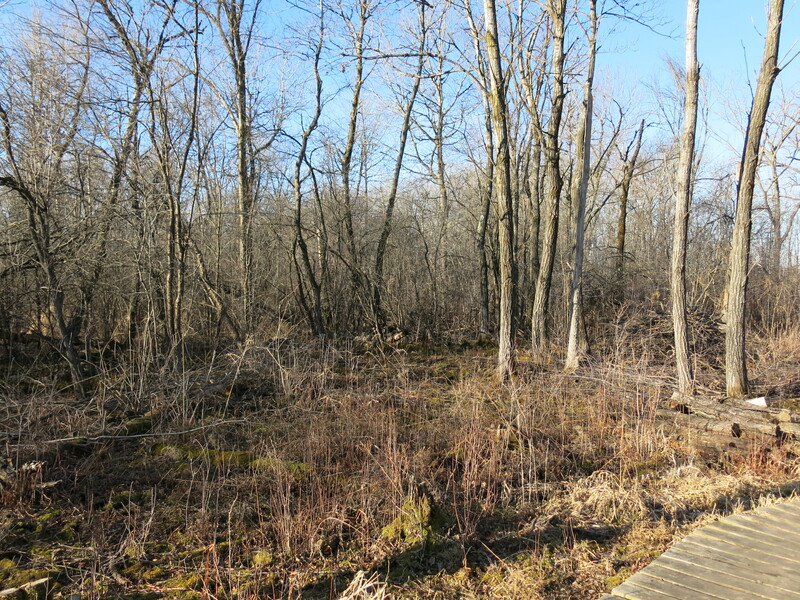 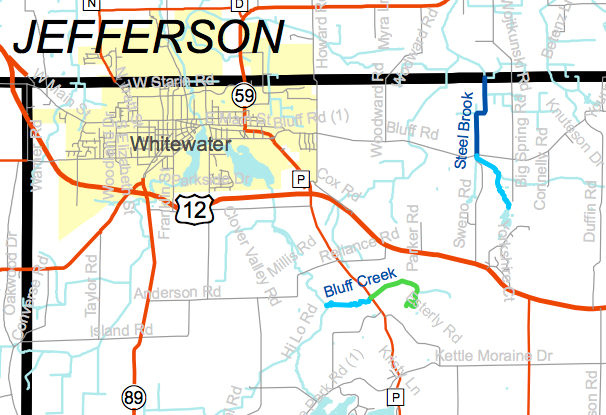 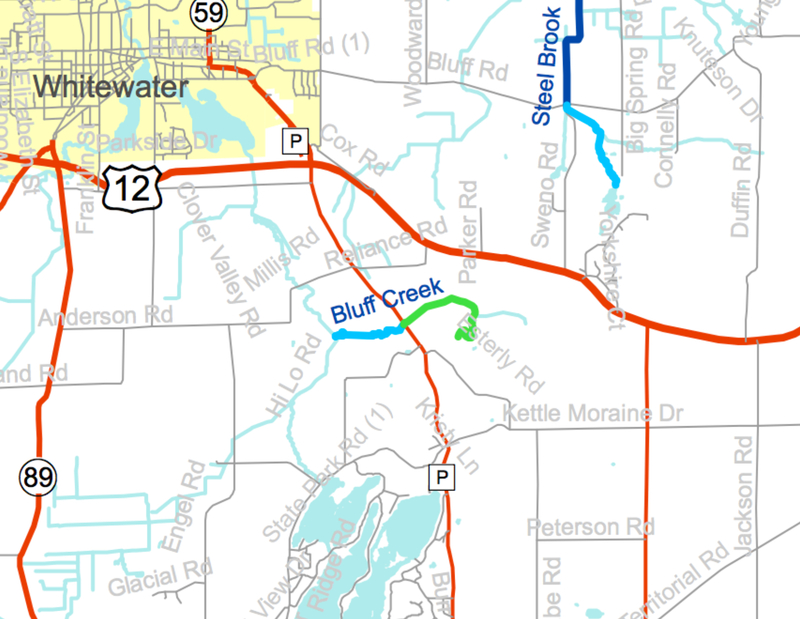 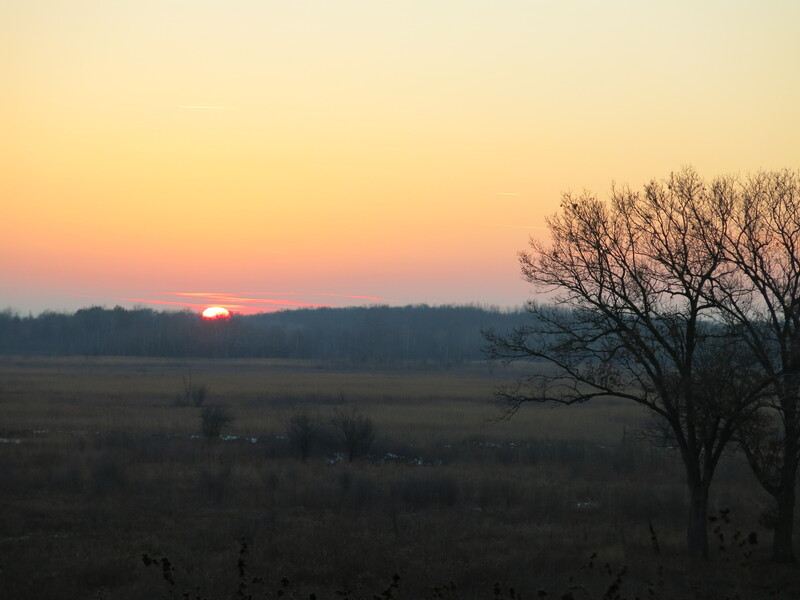 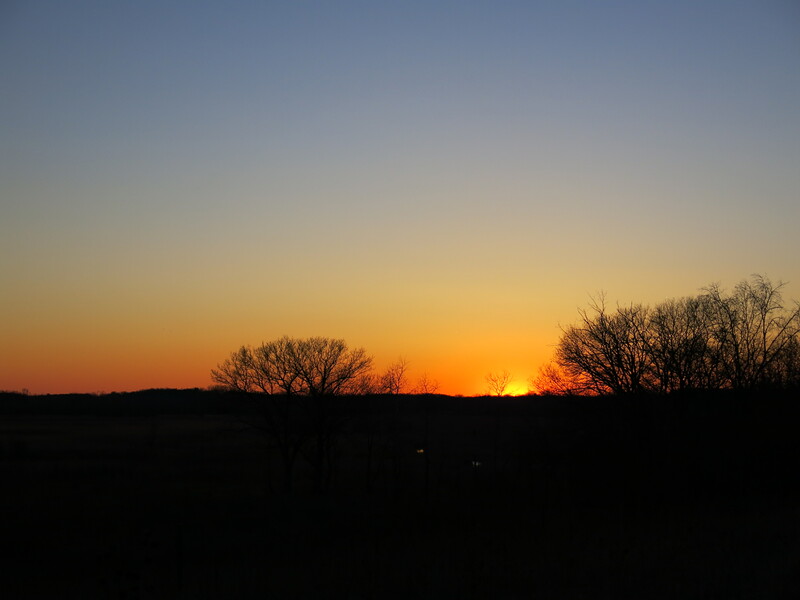 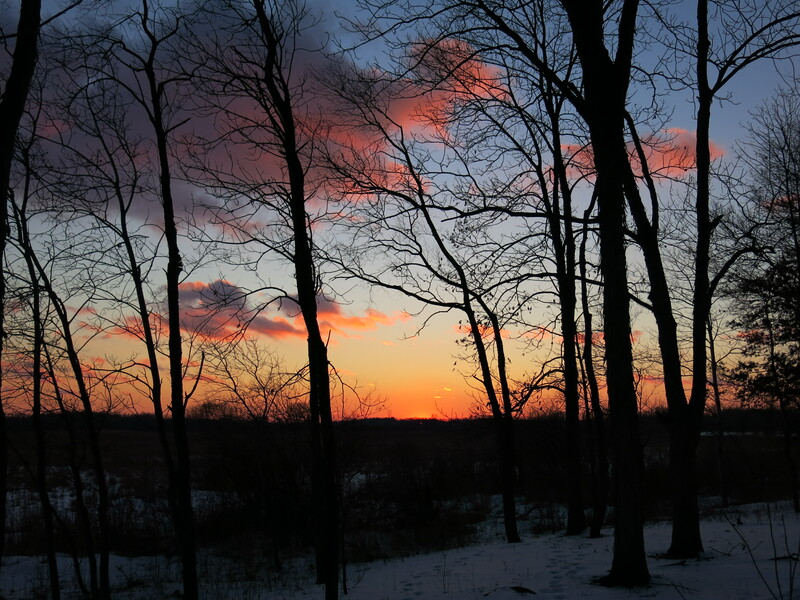 That is how I was introduced to the Bluff Creek SNA, which features one of the largest spring complexes in the Southern Kettle Moraine, and the scenic Lone Tree Bluff Nature Trail. 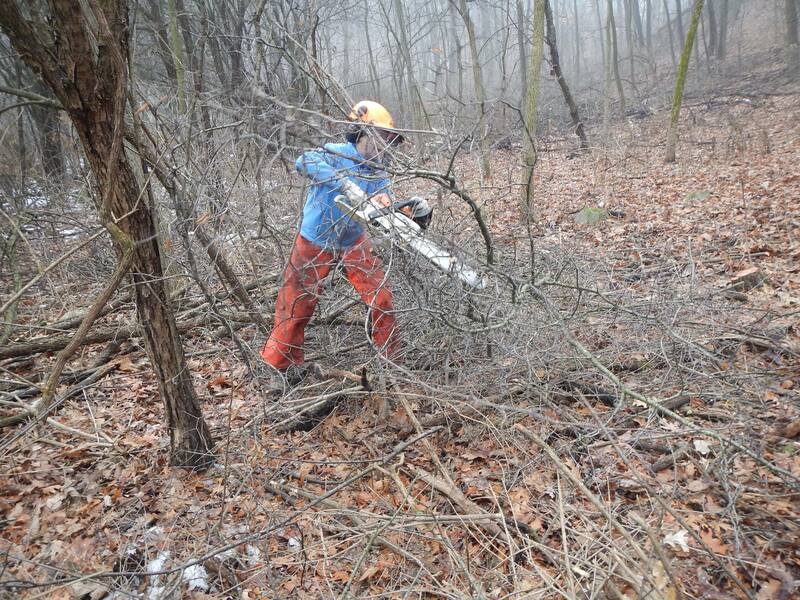 I will cut to the chase: I am an anarchist seeking a voluntary society. 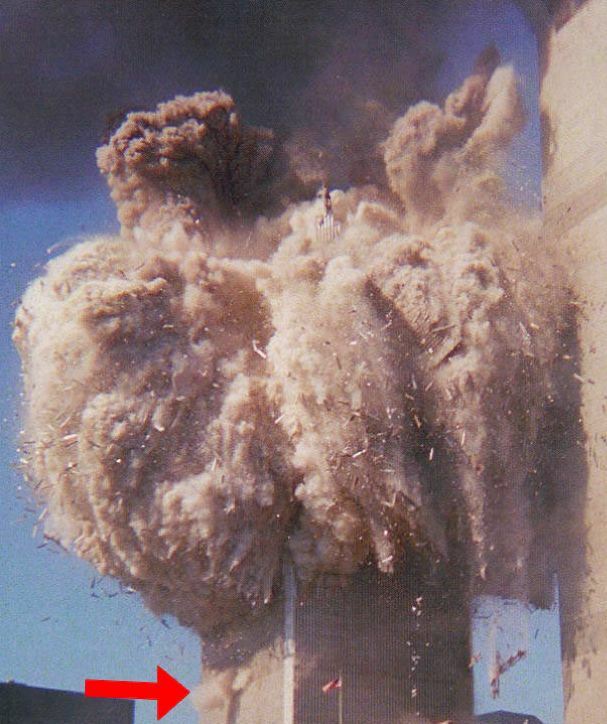 I don’t think the powers assumed by the “State” are legitimately based, especially the use of coercion to tax us. 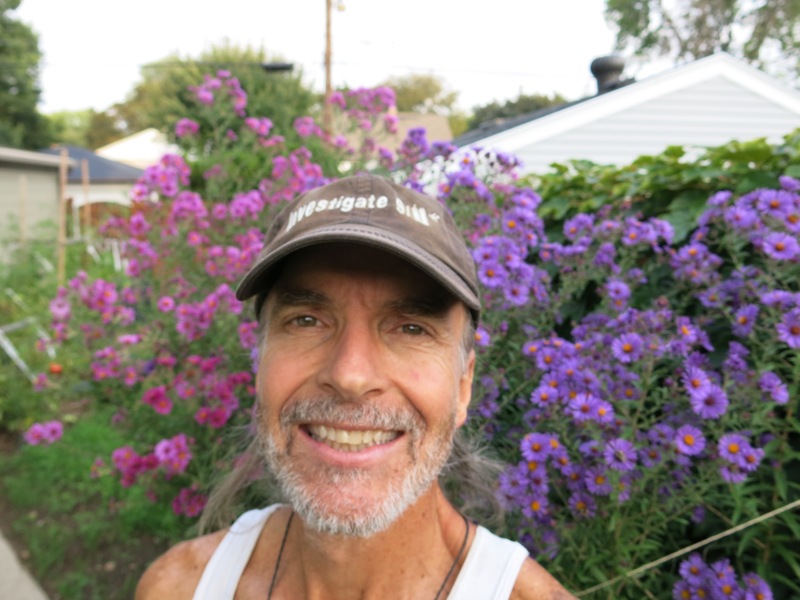 Under Natural Law, 1, 2, 10, 1,000 or 1,000,000 people do not have the right to delegate powers — that none of them possess individually — to an association they call government. 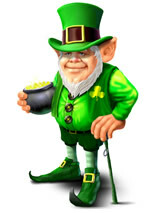 Do I have the right to demand that you give me 20% of your earnings? 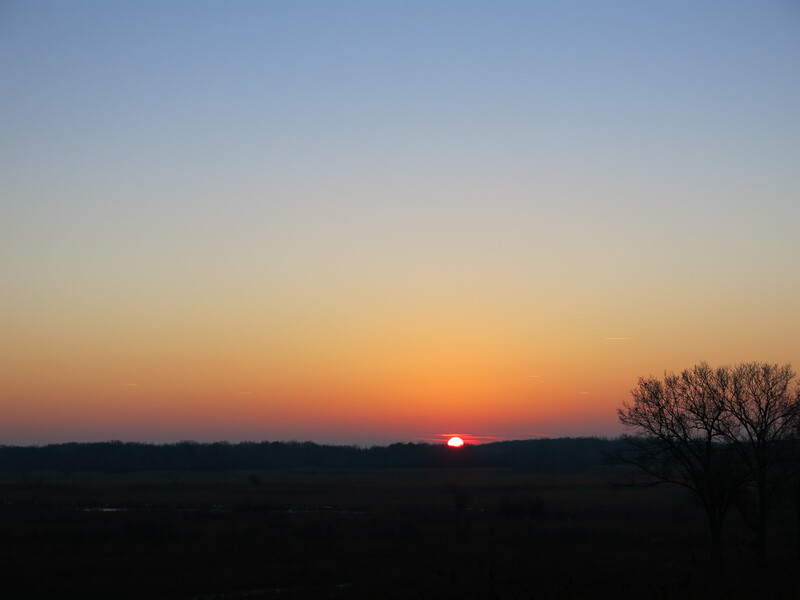 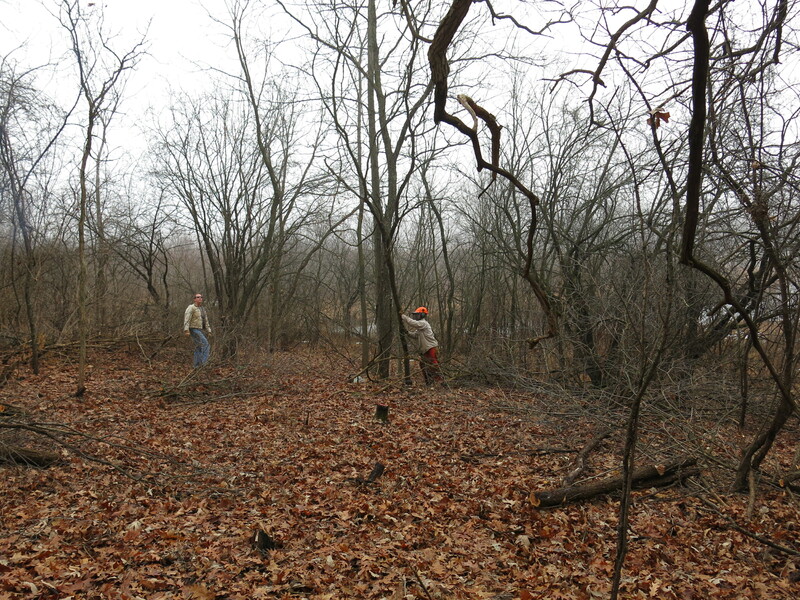 Land stewardship is guided by principles of ecosystem management. 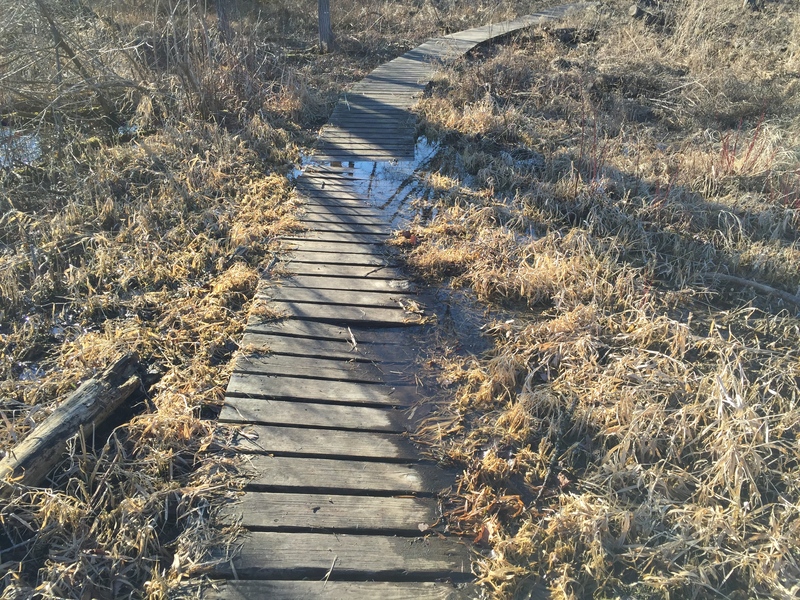 For some SNAs, the best management prescription is to “let nature take its course” and allow natural processes and their subsequent effects, to proceed without constraint. 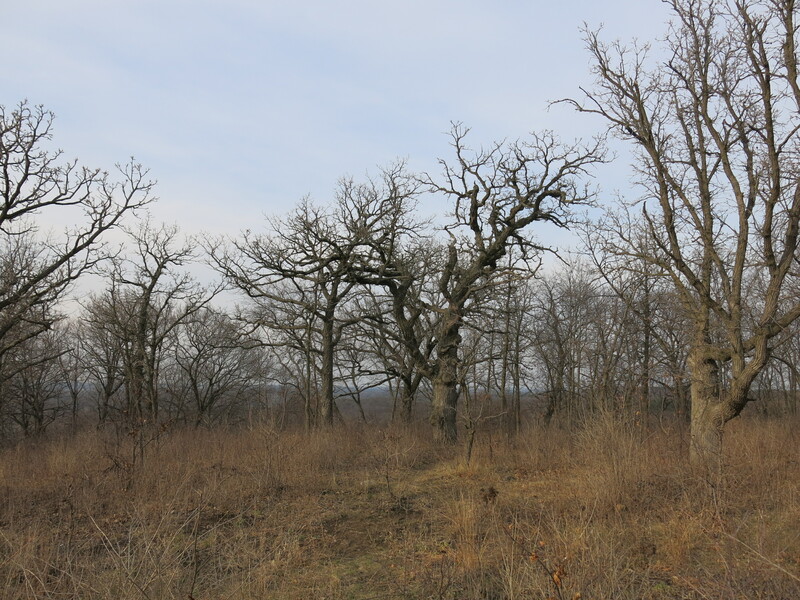 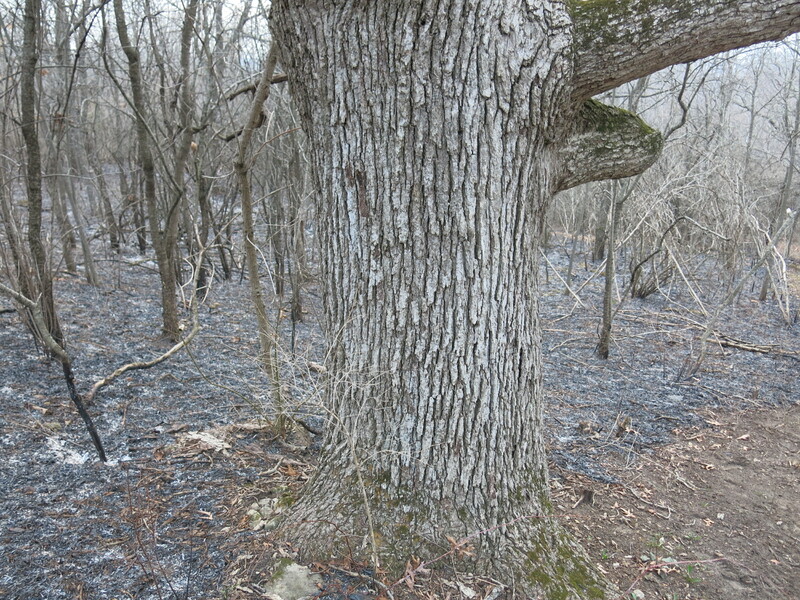 However, some processes, such as the encroachment of woody vegetation and the spread of invasive and exotic plant species, threaten the biological integrity of many SNAs. 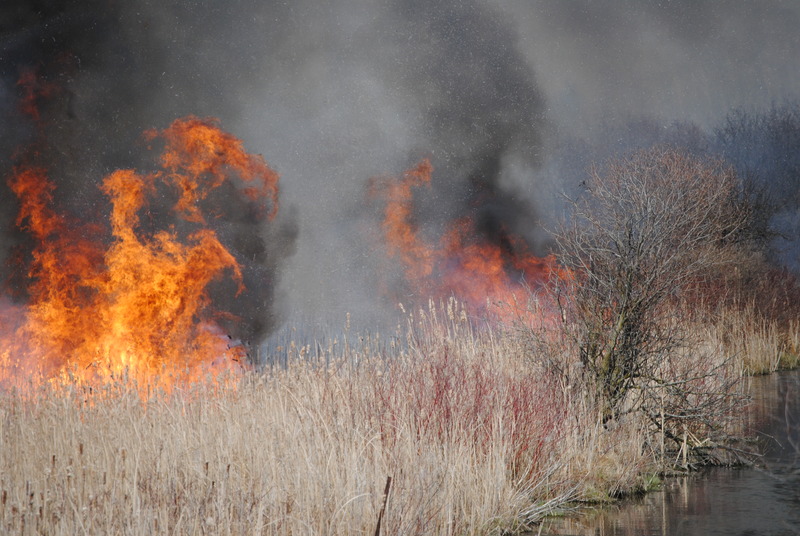 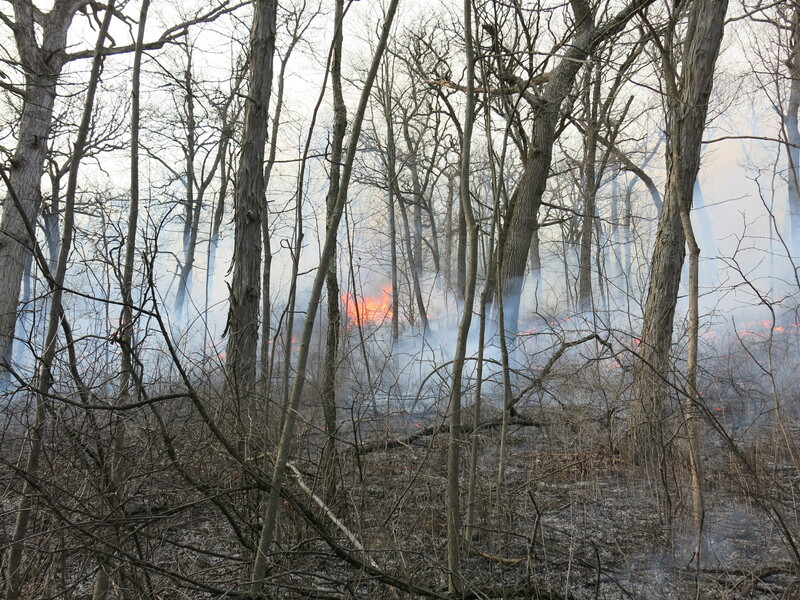 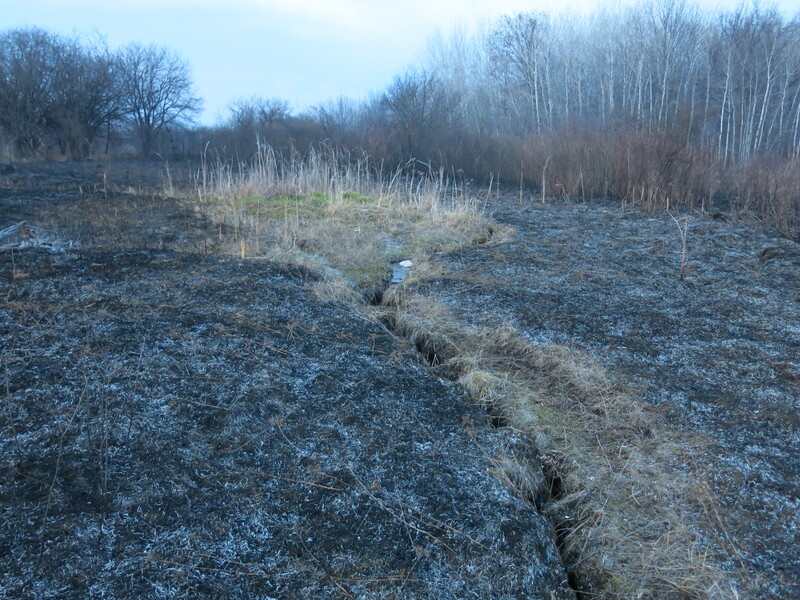 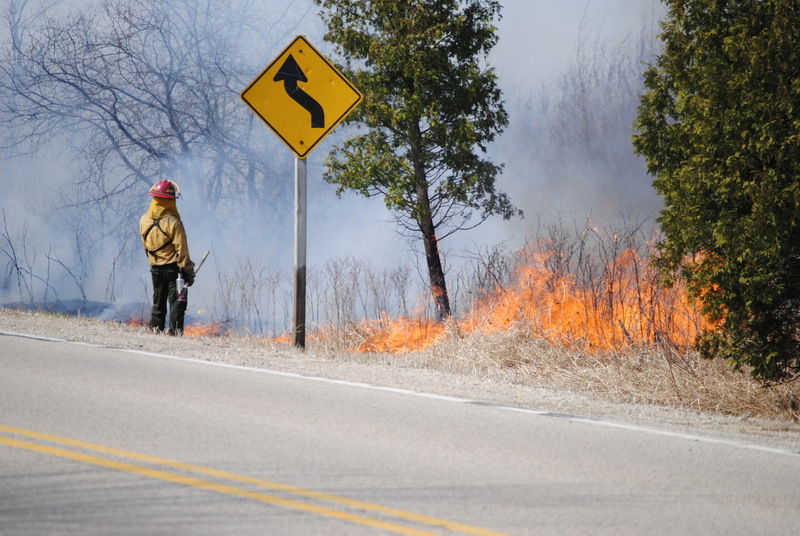 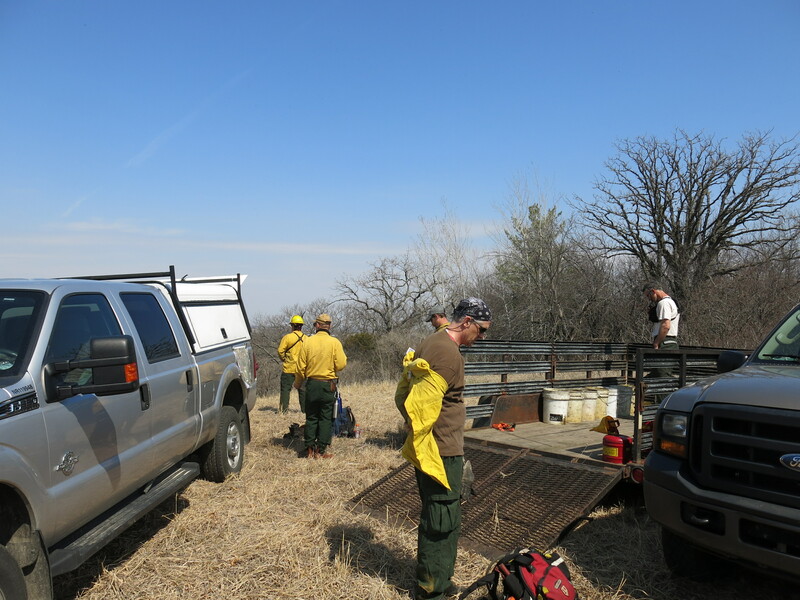 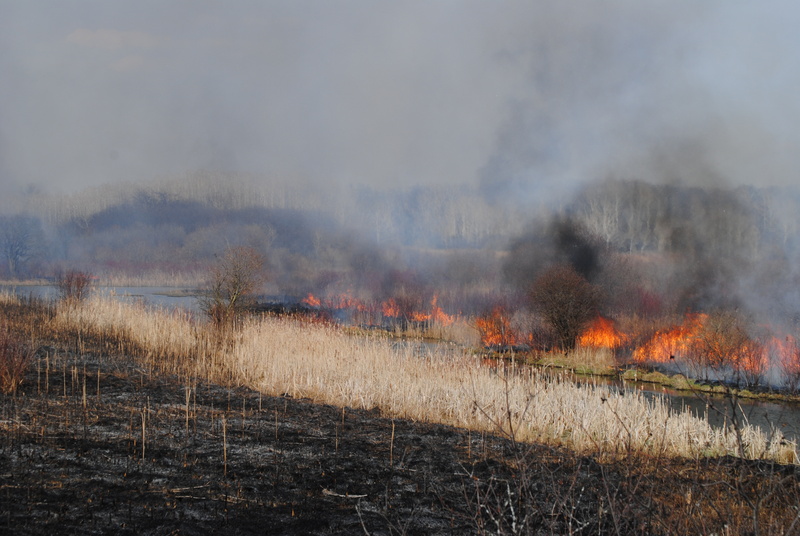 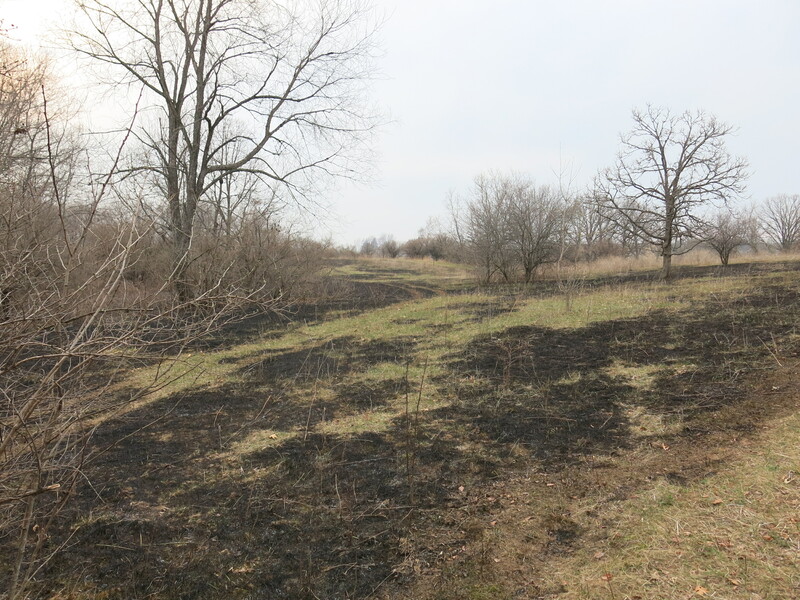 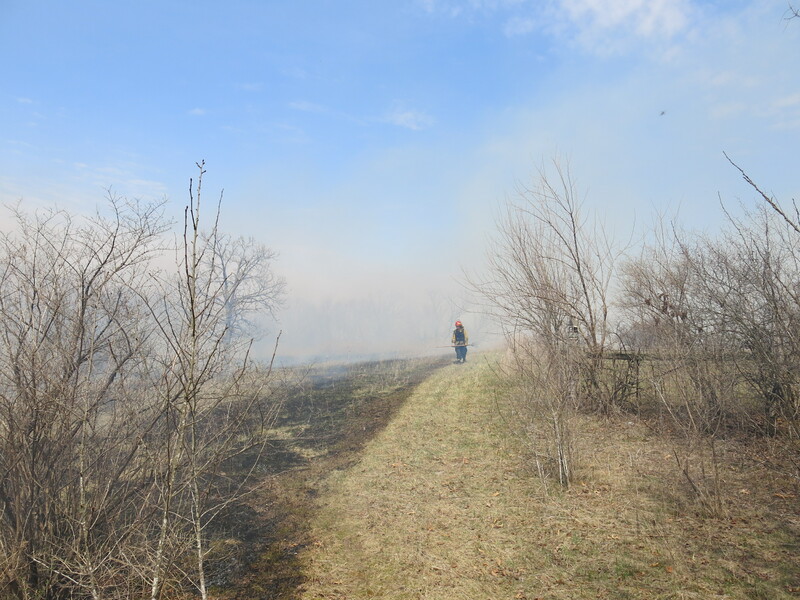 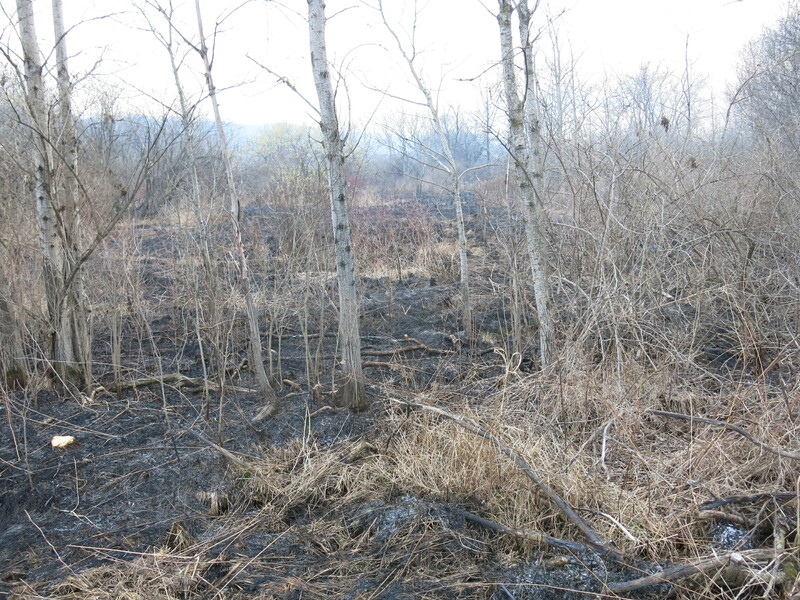 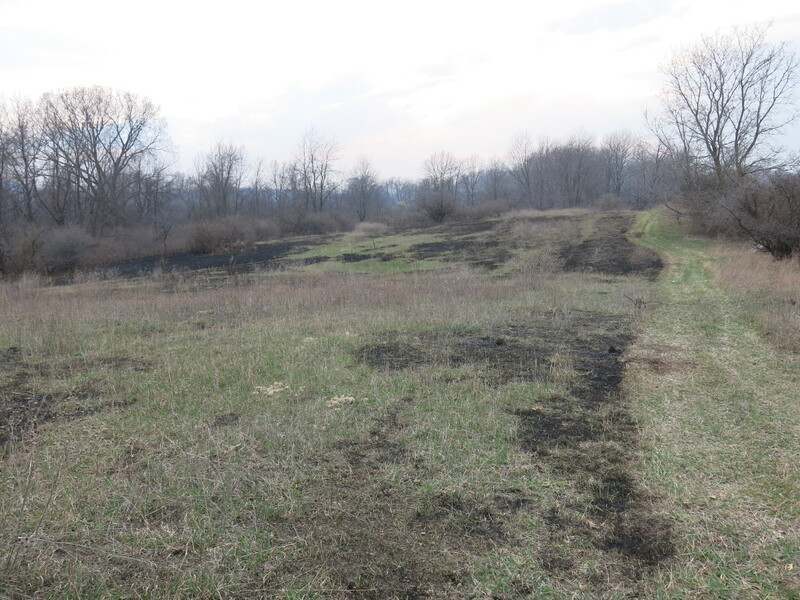 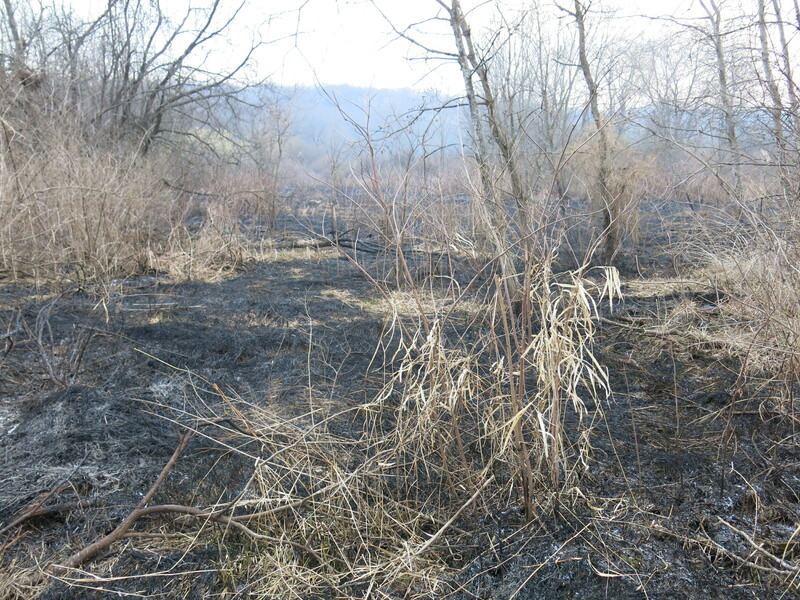 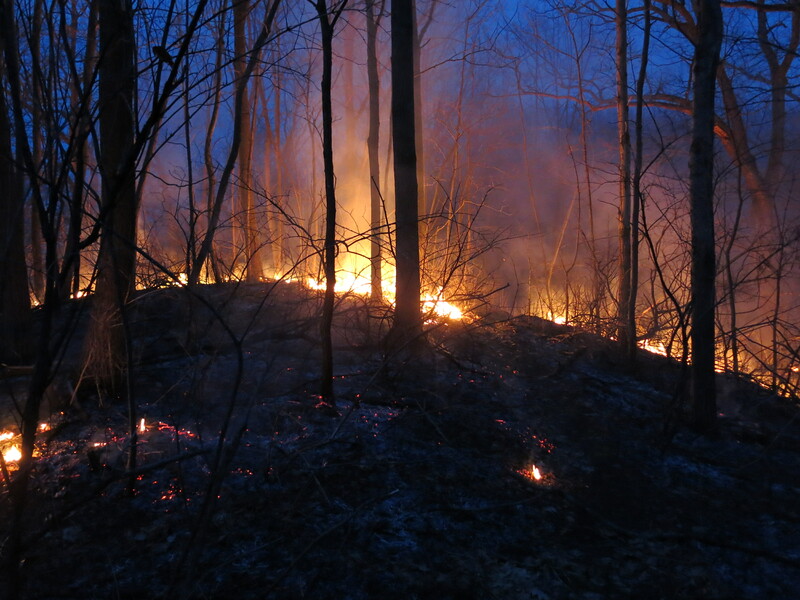 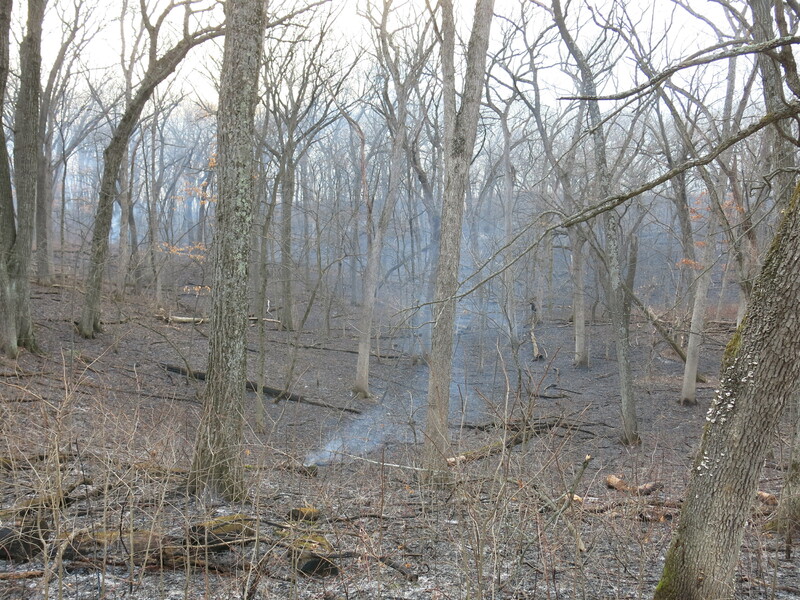 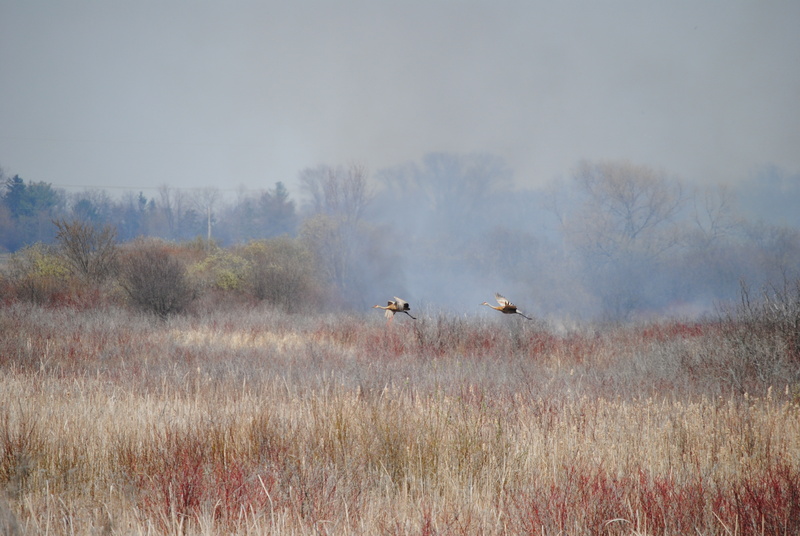 These sites require hands-on management and, in some cases, the reintroduction of natural functions — such as prairie fire — that are essentially absent from the landscape. 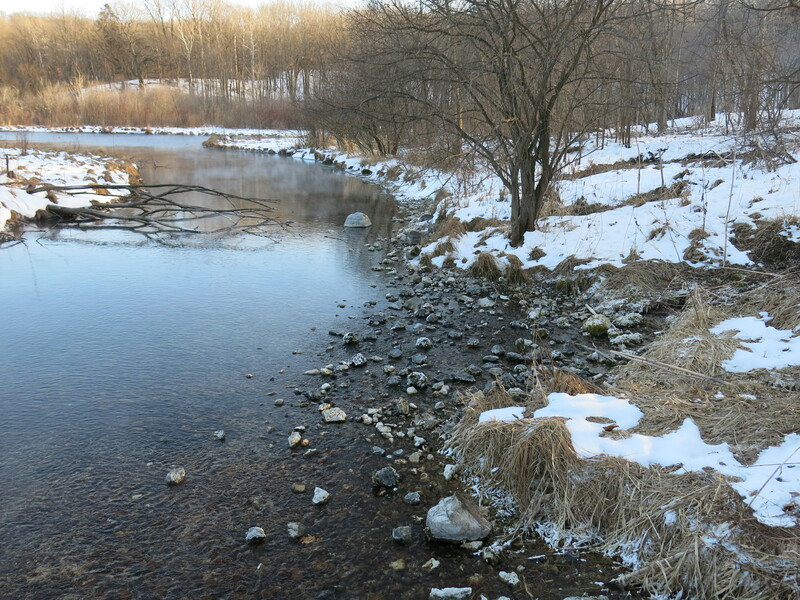 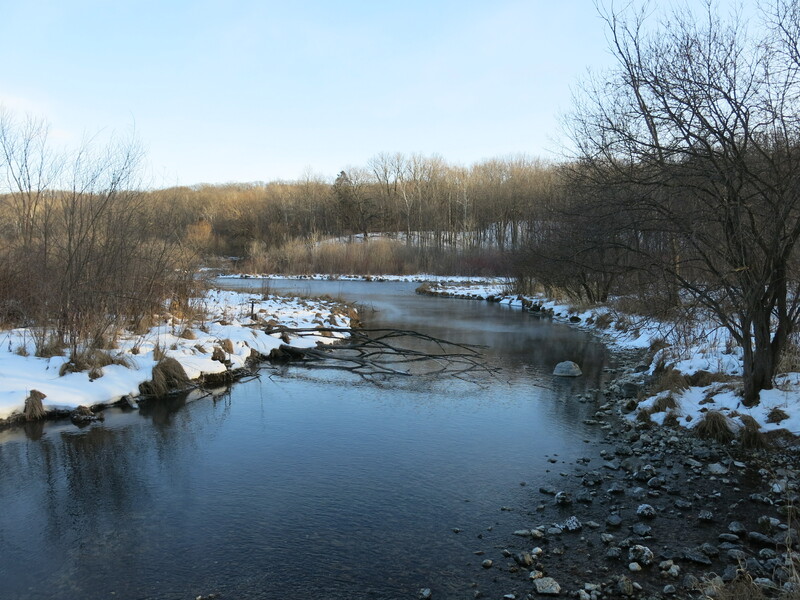 The headwaters of Bluff Creek is one of the few Class I trout streams in southeast Wisconsin. 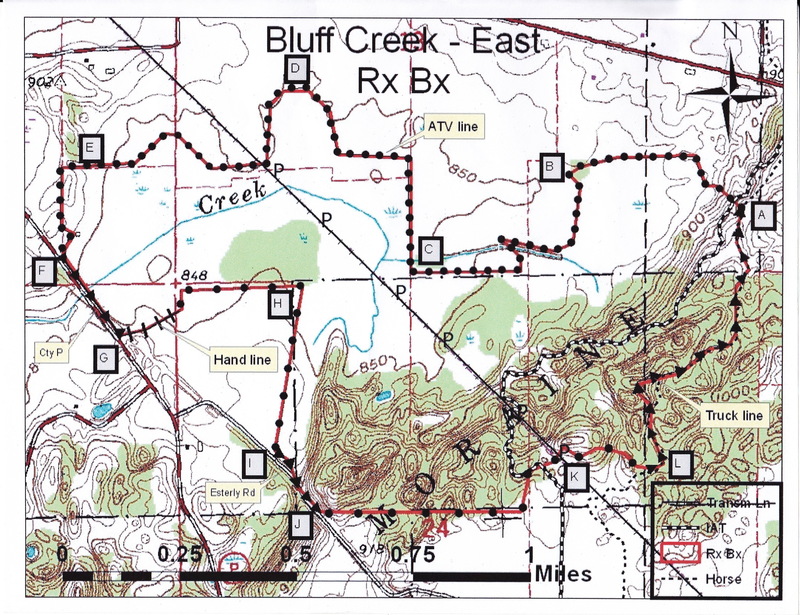 Pati and I visited the Bluff Creek Springs complex after the November SNA workday and I gave her a tour. 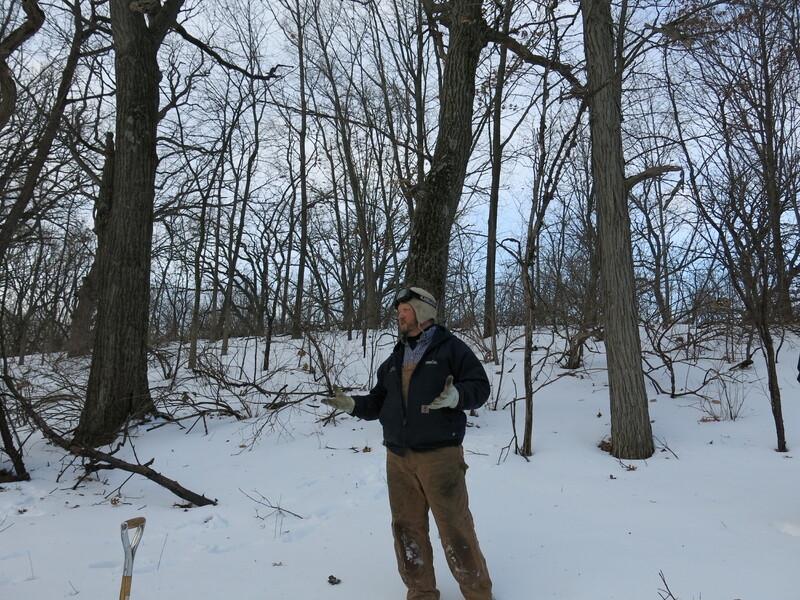 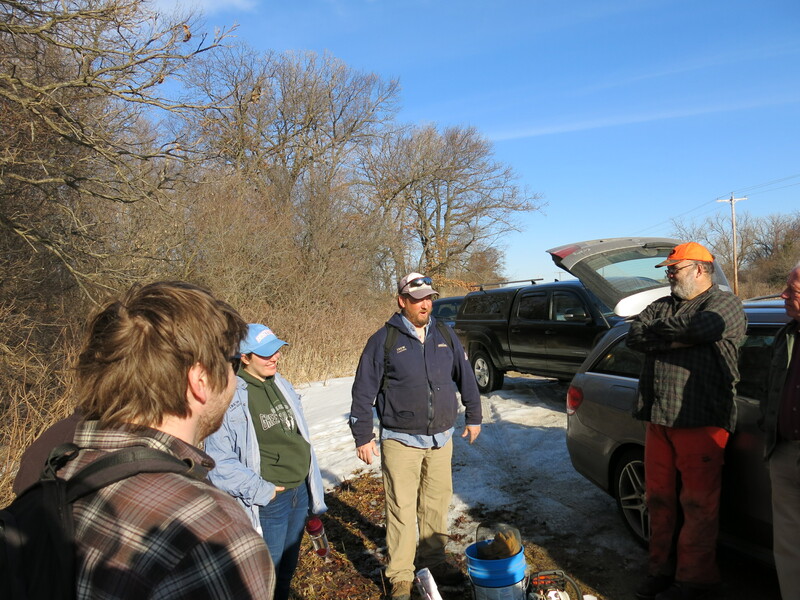 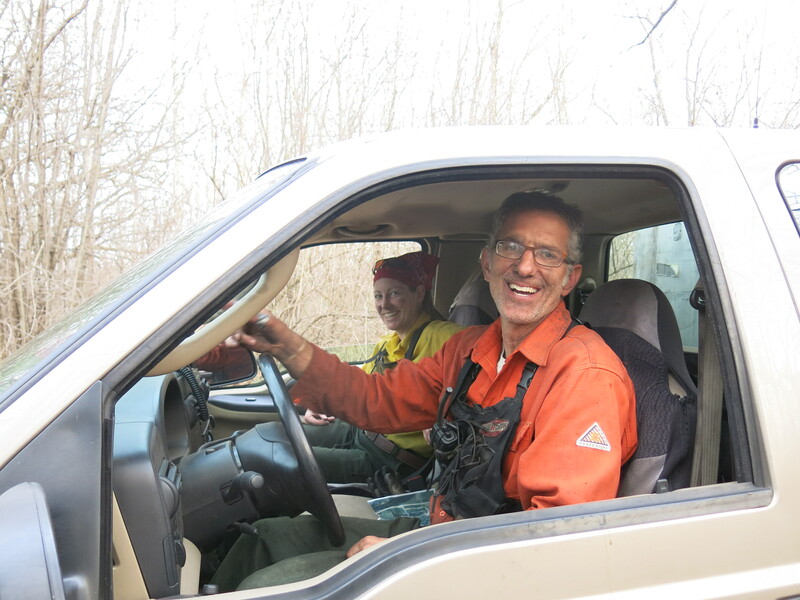 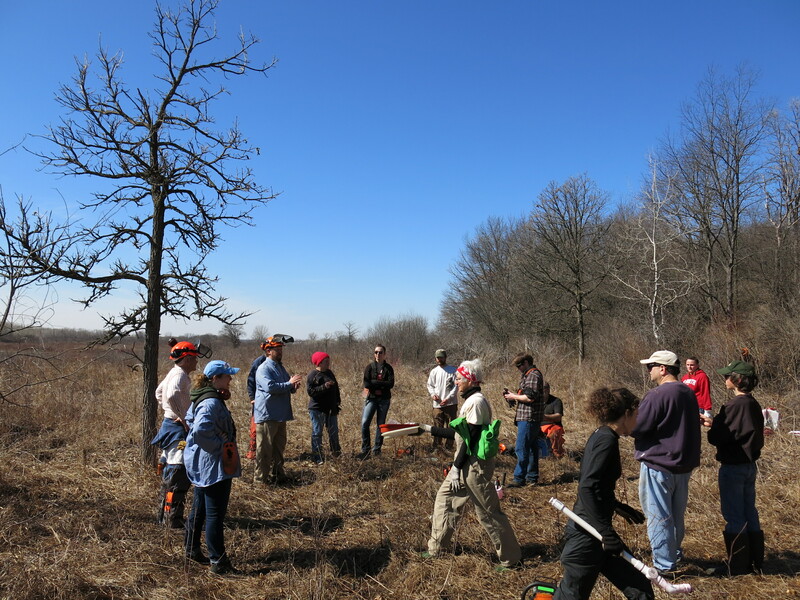 I mentioned in the video how excited I was to return for the SNA workday in December and I was not disappointed (visit the Southern Kettle Moraine SNA Volunteers on Facebook). 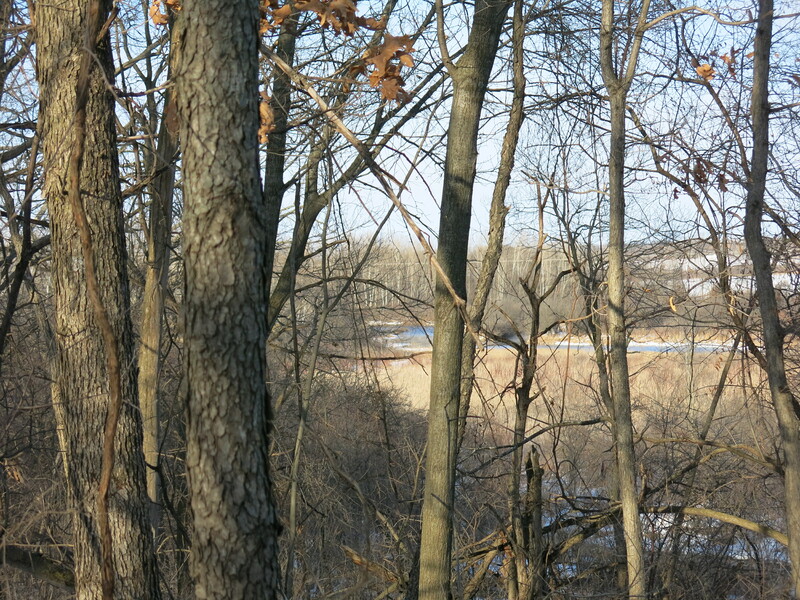 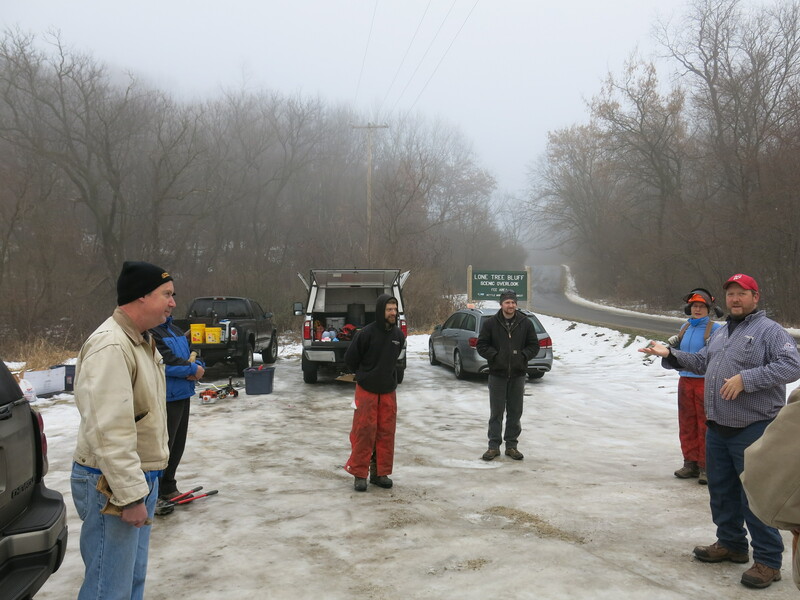 We gathered yesterday morning on the ice covered parking lot at the Lone Tree Bluff trailhead on Esterly Road. 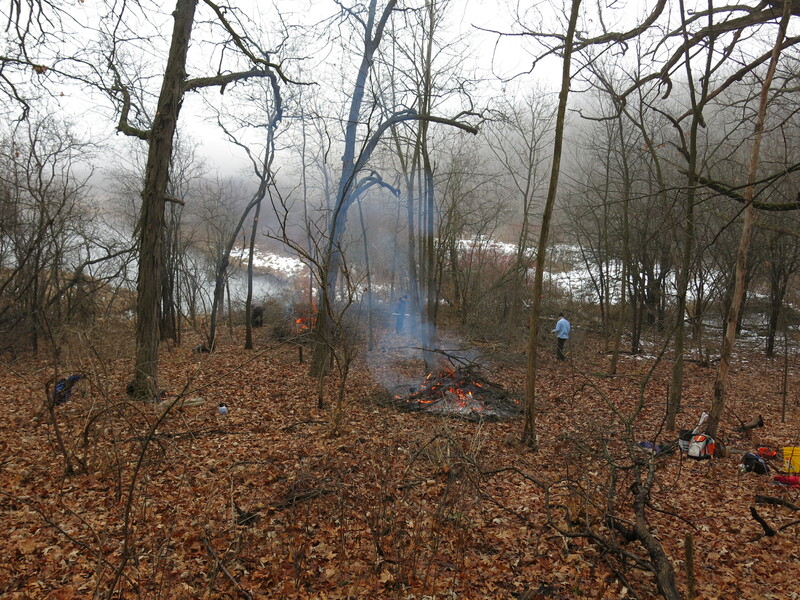 Zach Kastern introduced us to the day’s project. 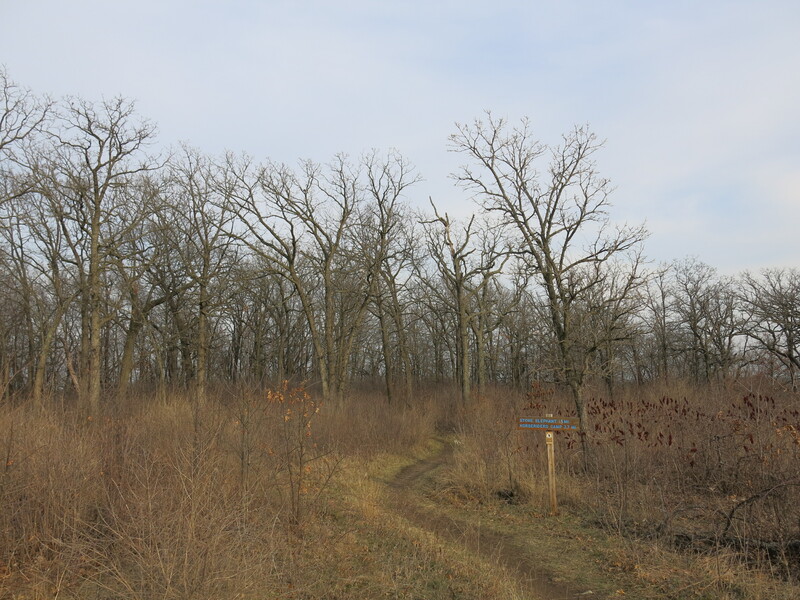 At the trailhead, you take the left-hand, unmarked path towards the springs rather than follow the steps straight up to Lone Tree Bluff. 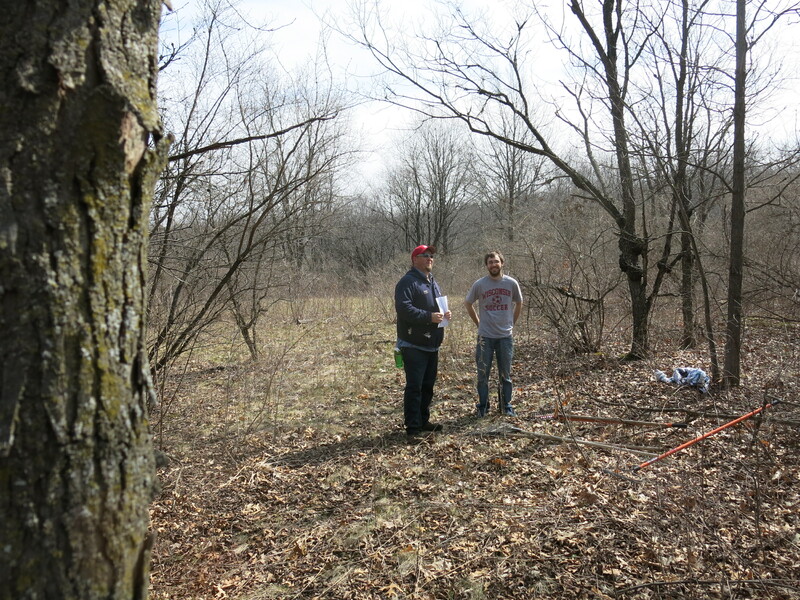 This is not an official trail, but it will definitely become more obvious as we continue working there. 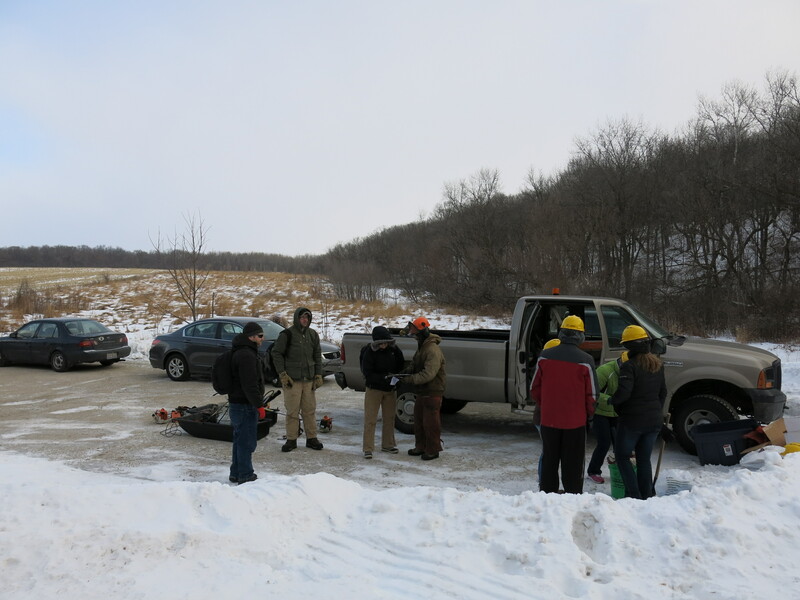 When we got to the work site, Zach gave more specific instructions and we all introduced ourselves. 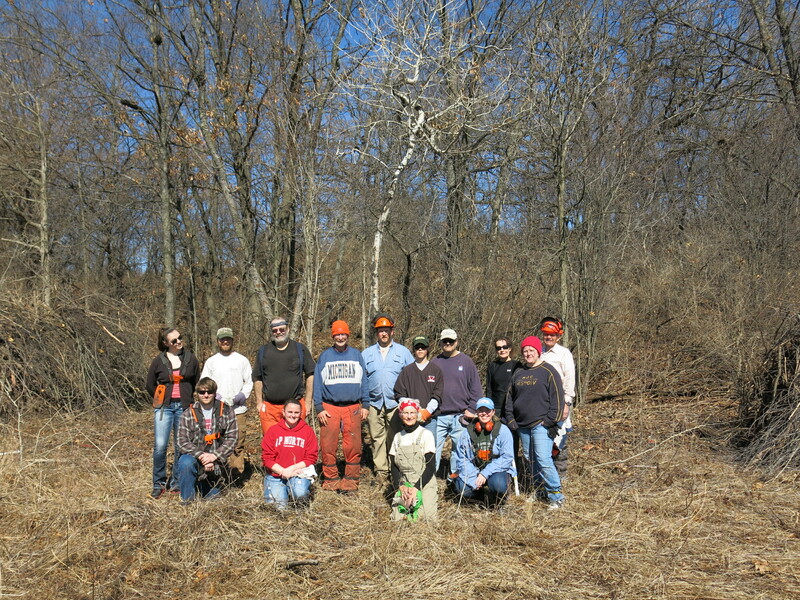 It was a great crew to be with! 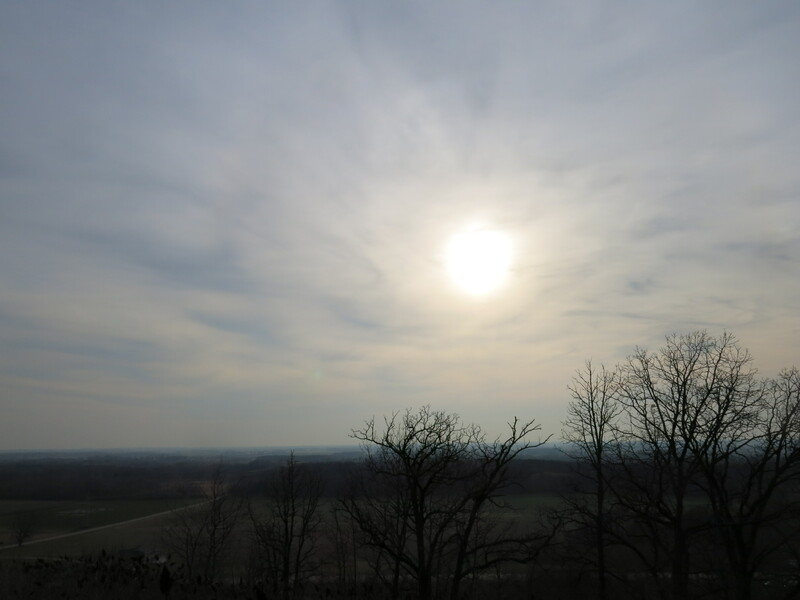 I was in heaven and thoroughly enjoyed the day. 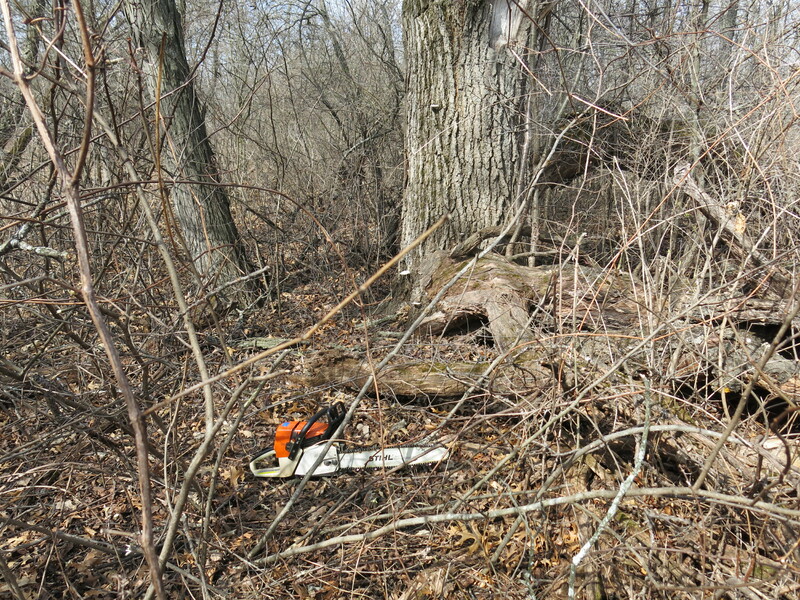 I grabbed these images while taking a break to gas up the saw. 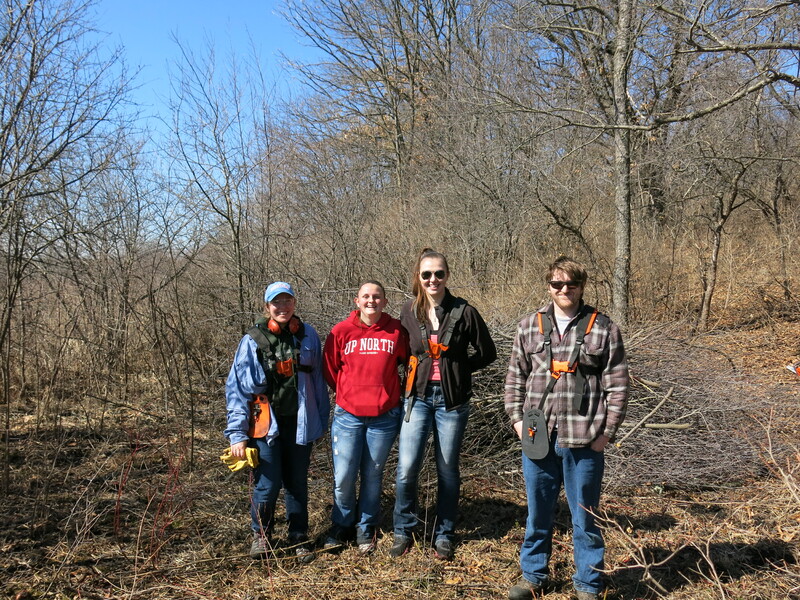 Jared Urban coordinates volunteers at the SNA’s in the southern part of the state. 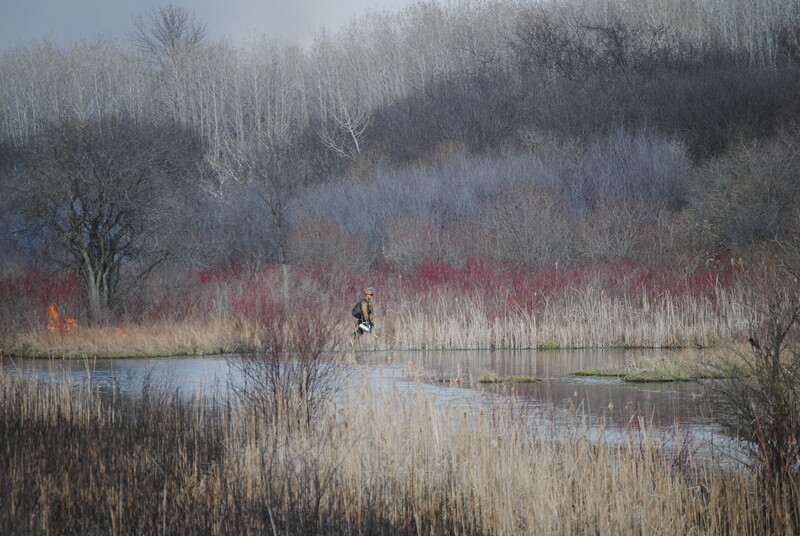 The next 5 action shots are courtesy of Jared. 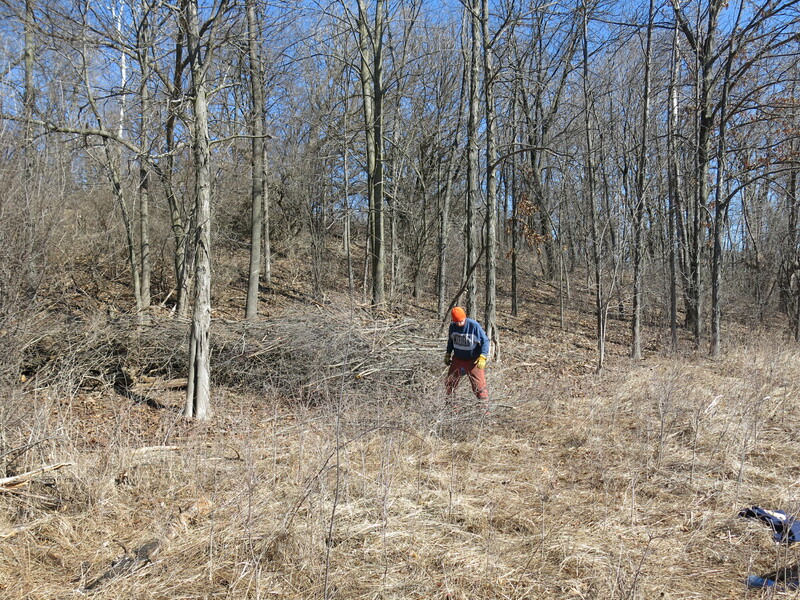 Kyungmann in the thick of it. 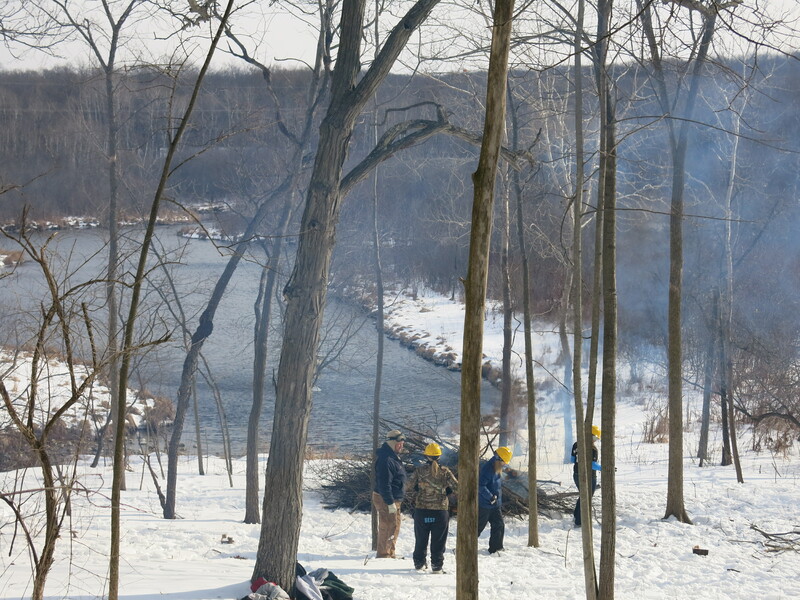 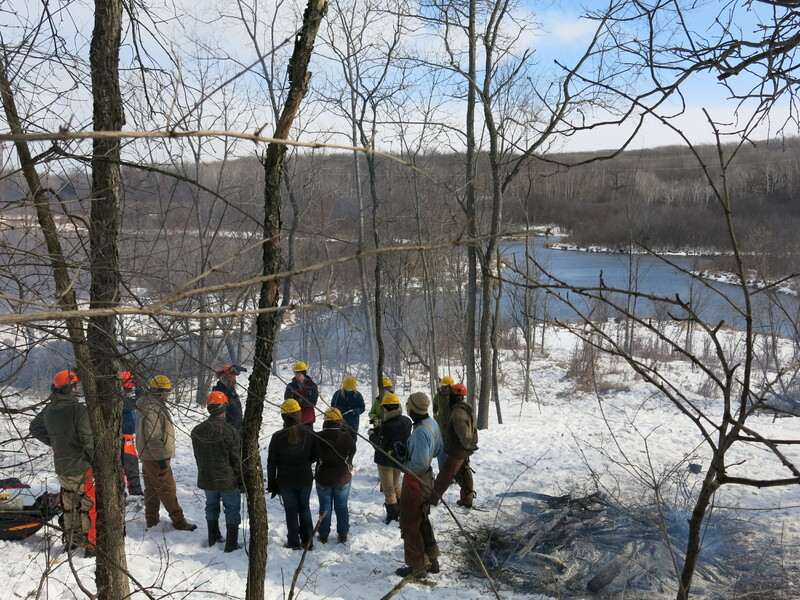 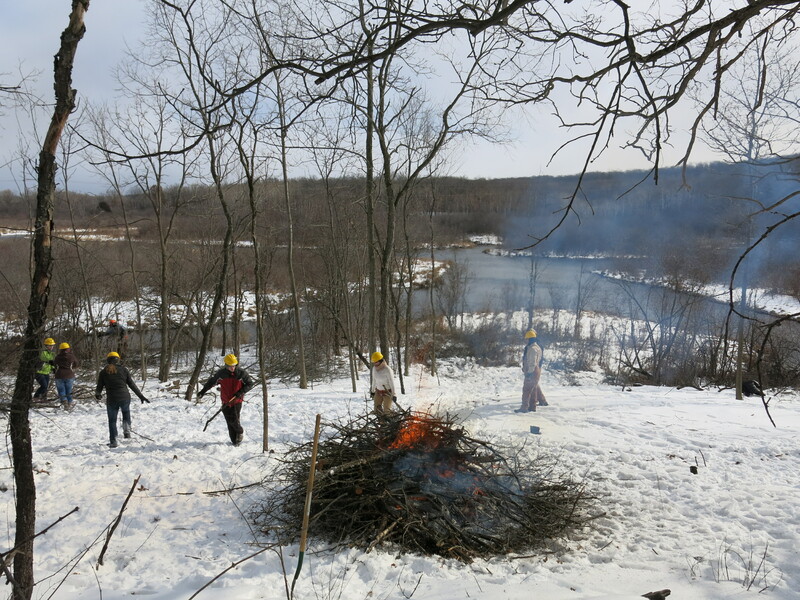 The official workday ended at noon but a few of us hung out to talk and share lunch by the fire. 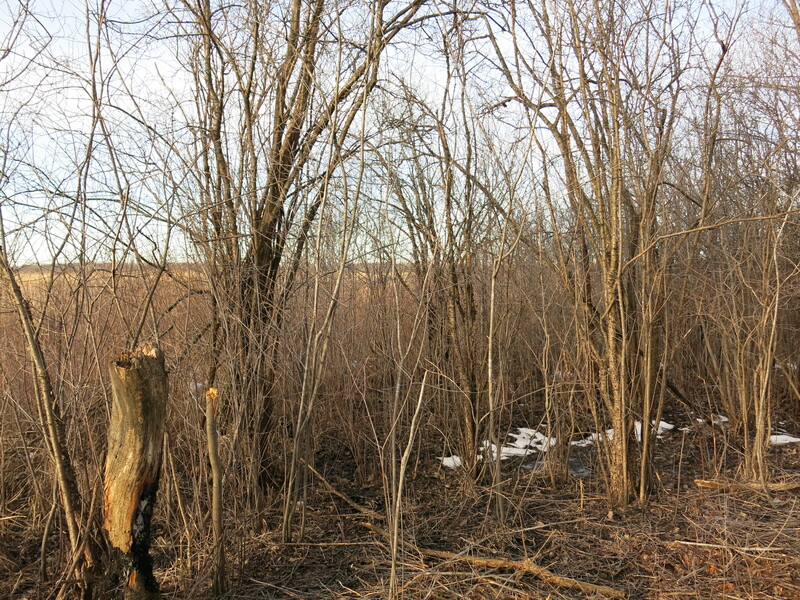 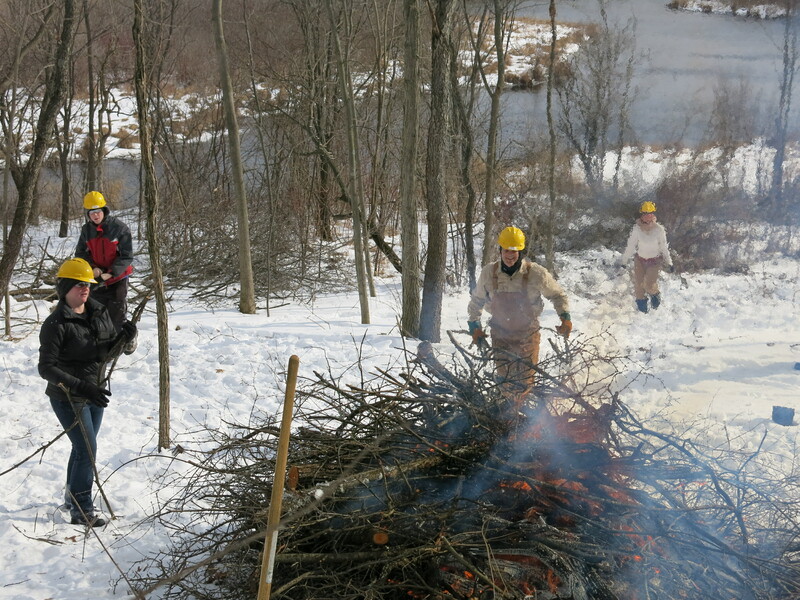 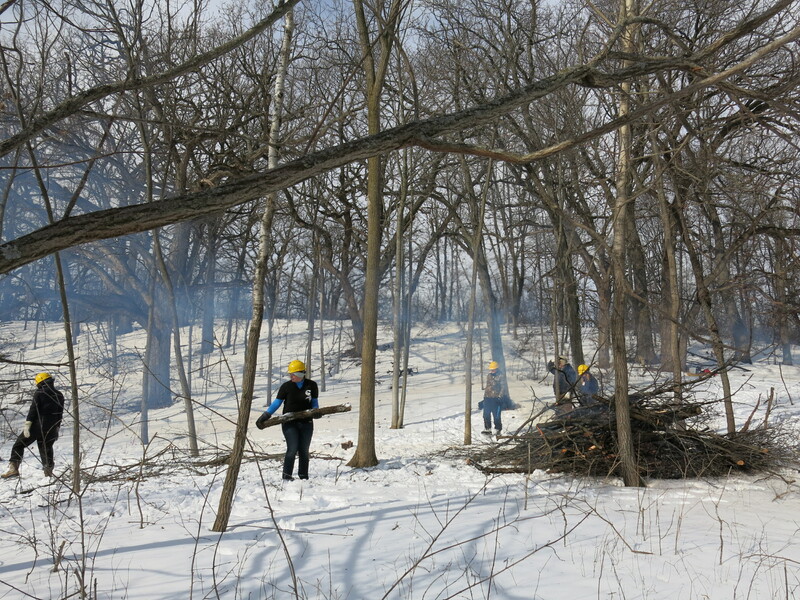 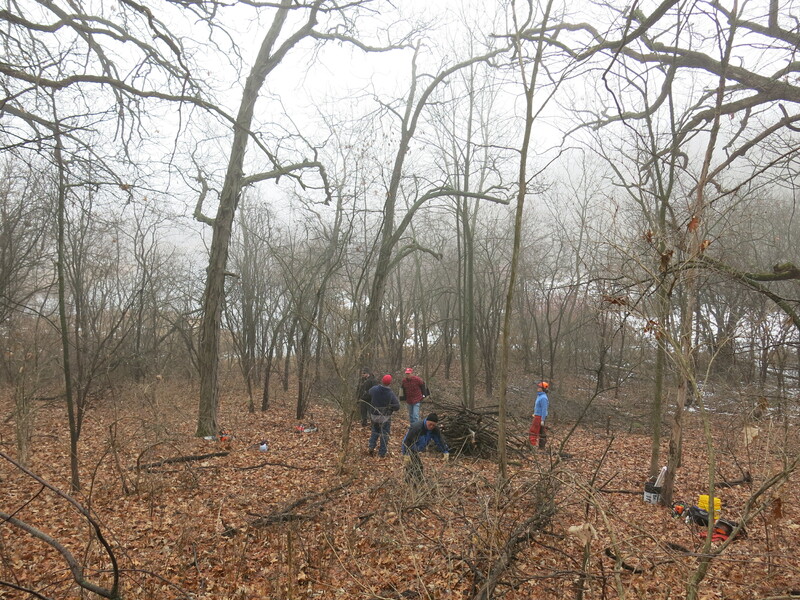 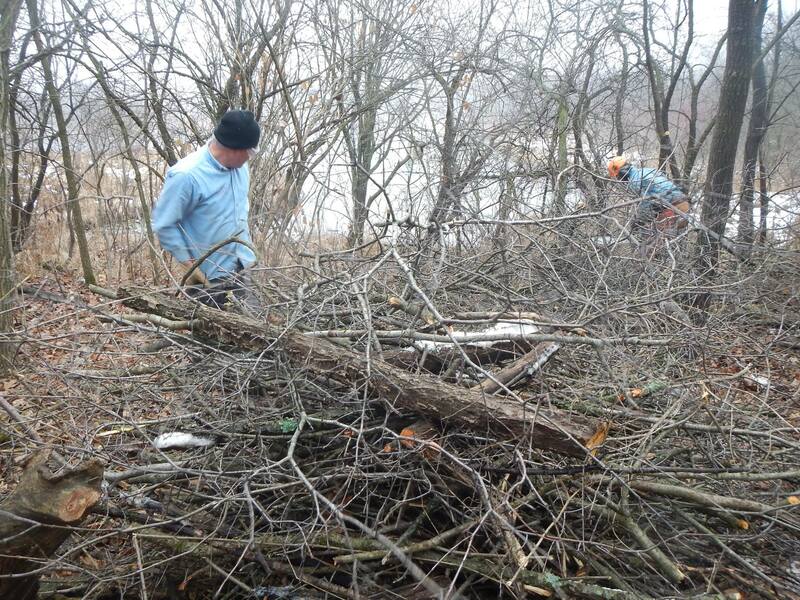 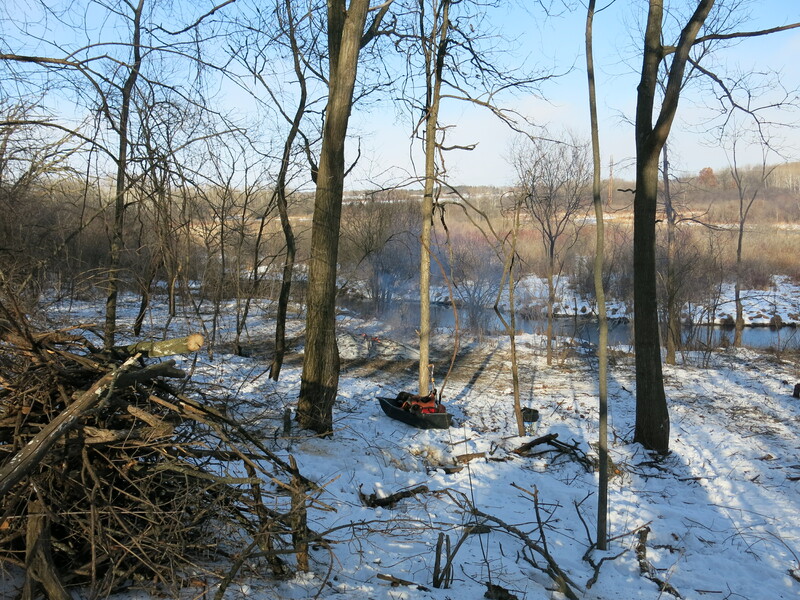 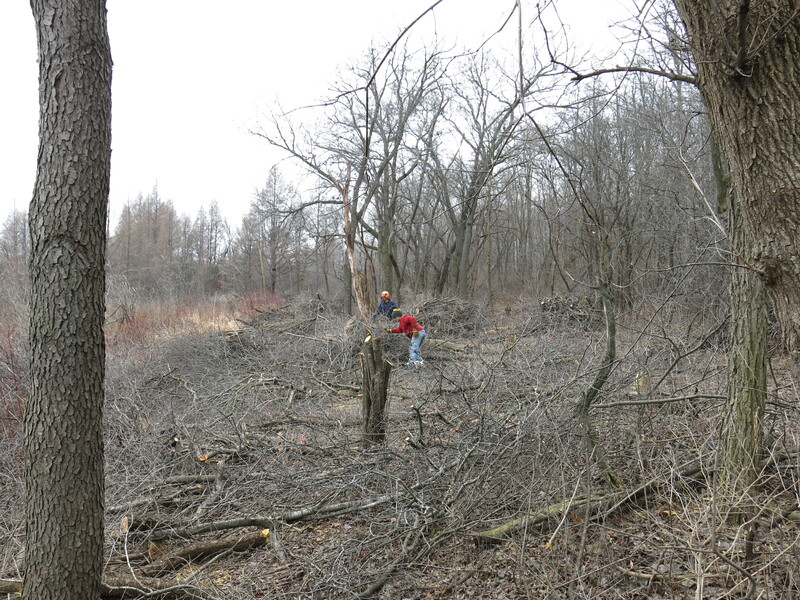 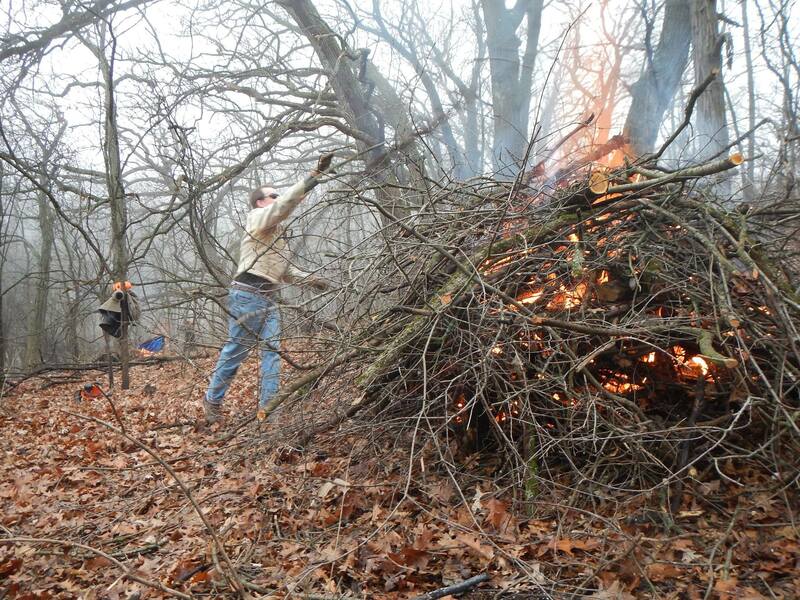 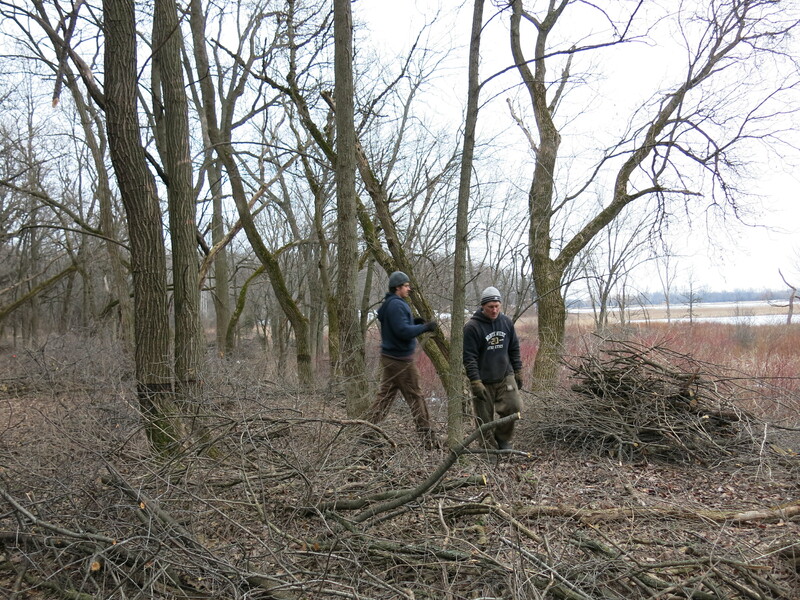 I cut buckthorn all afternoon and Zach and Scott fed the brush piles. 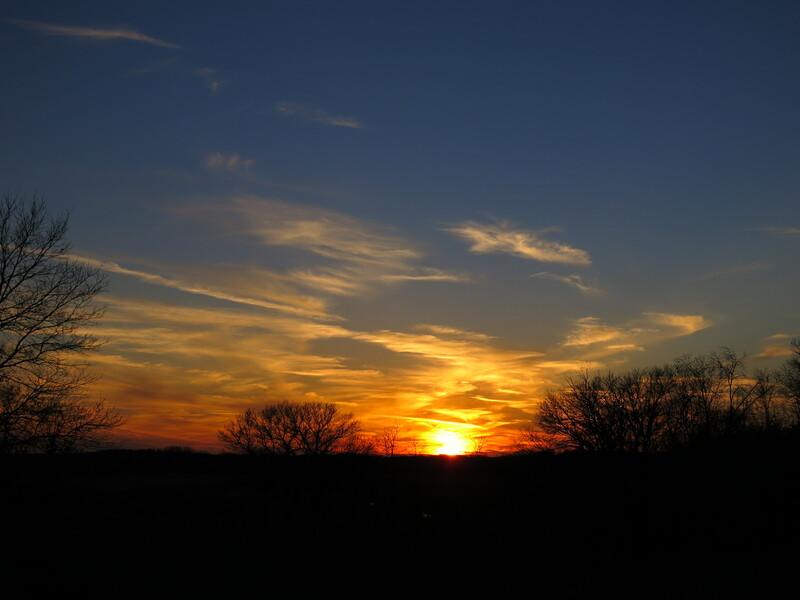 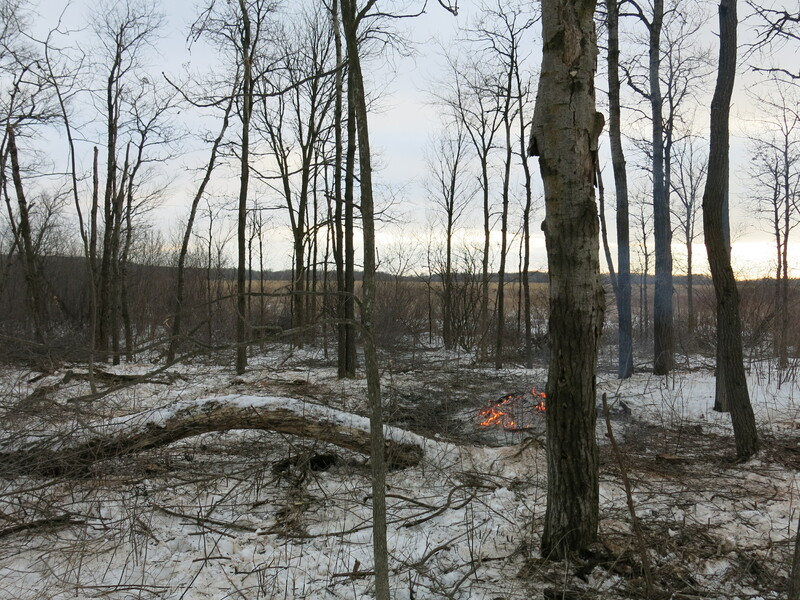 Here is how it looked at the end of the day. 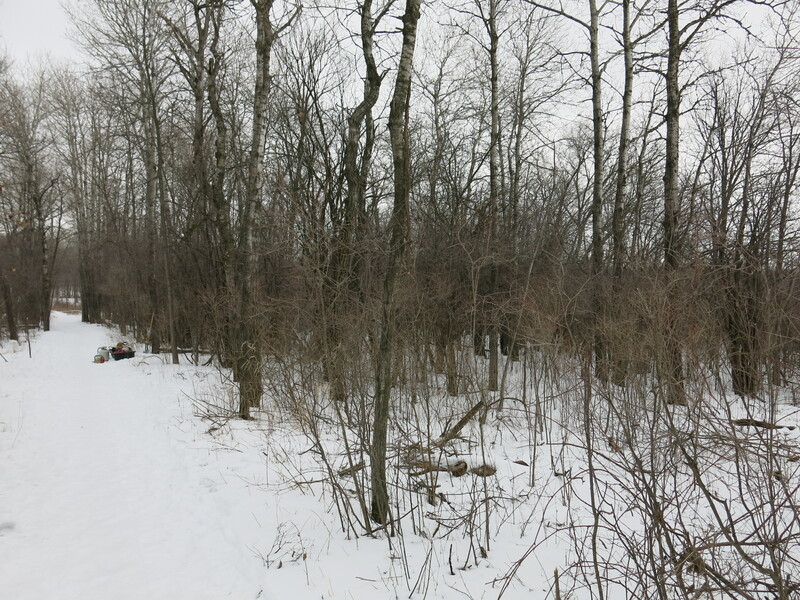 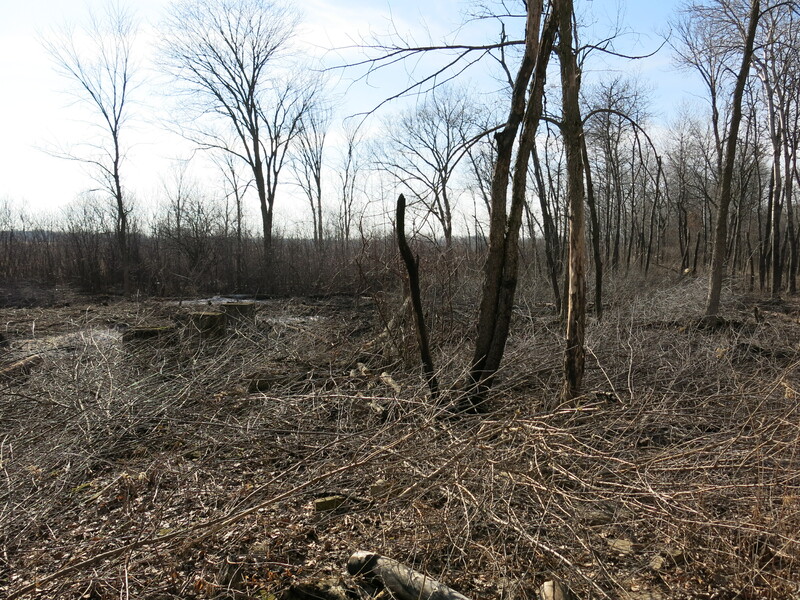 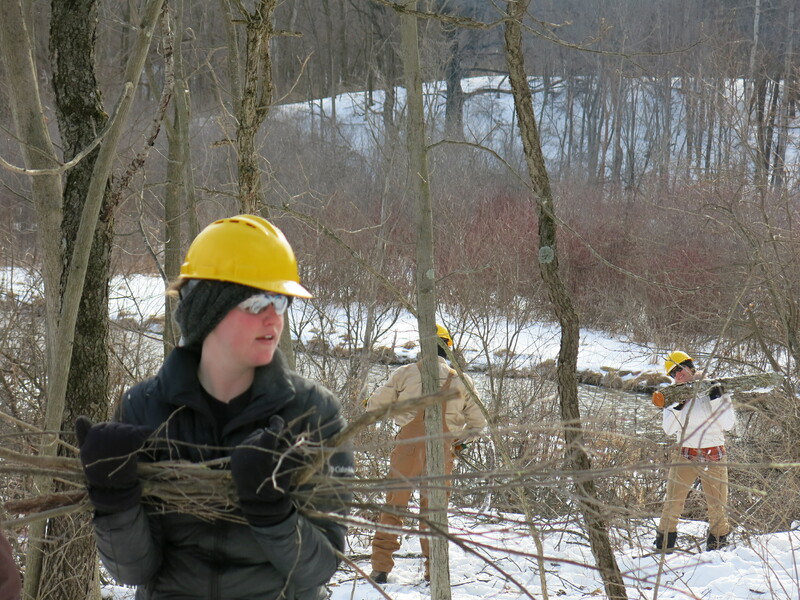 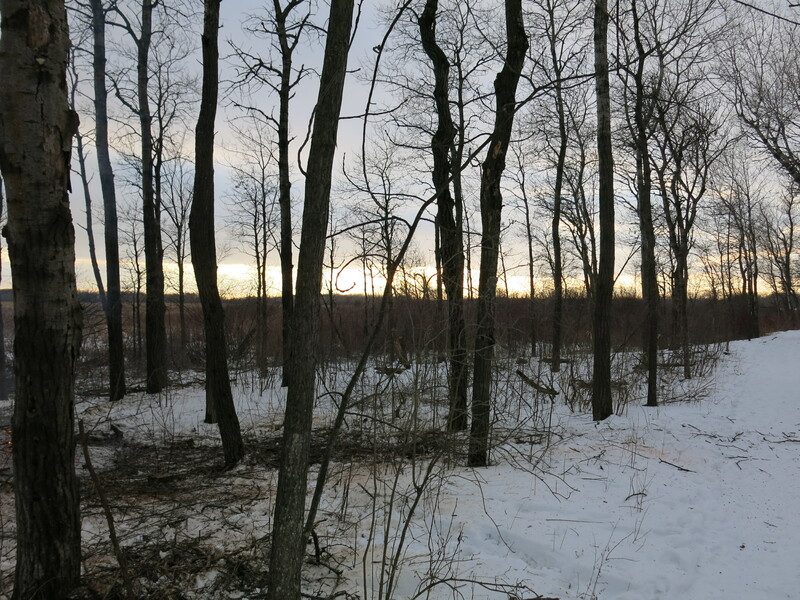 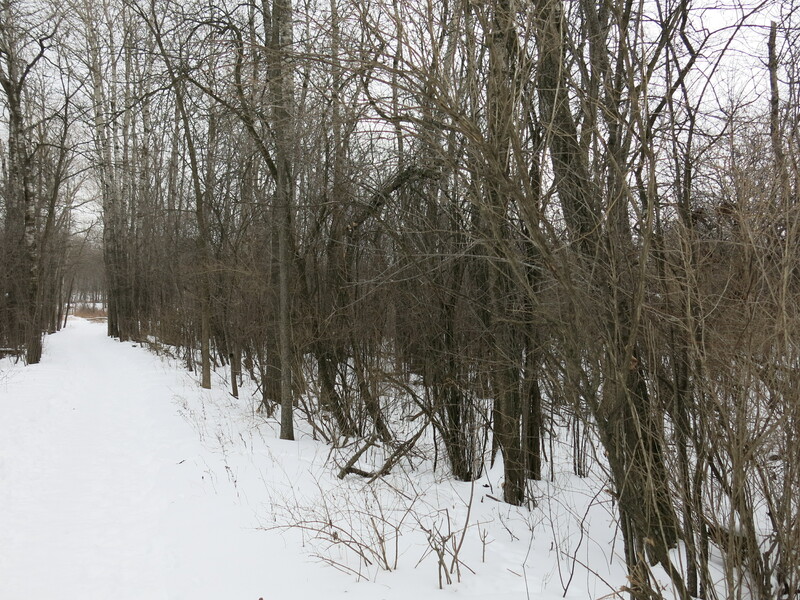 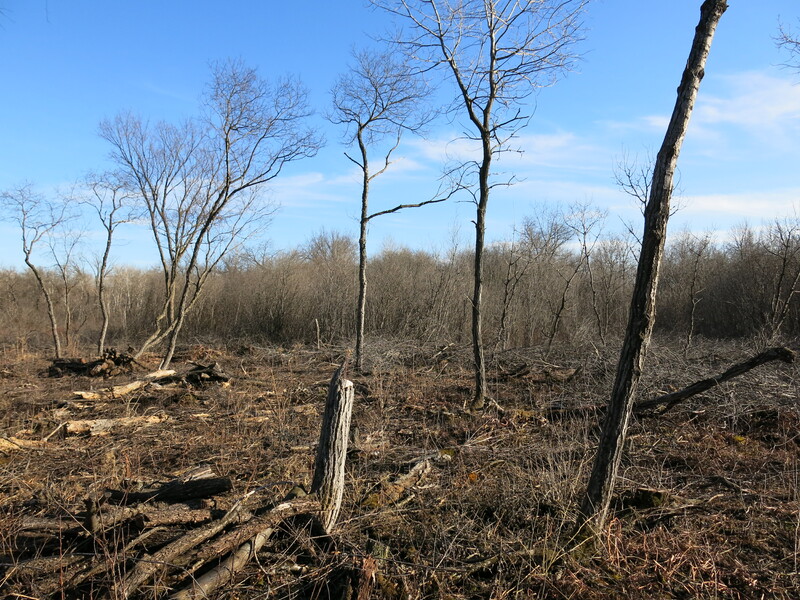 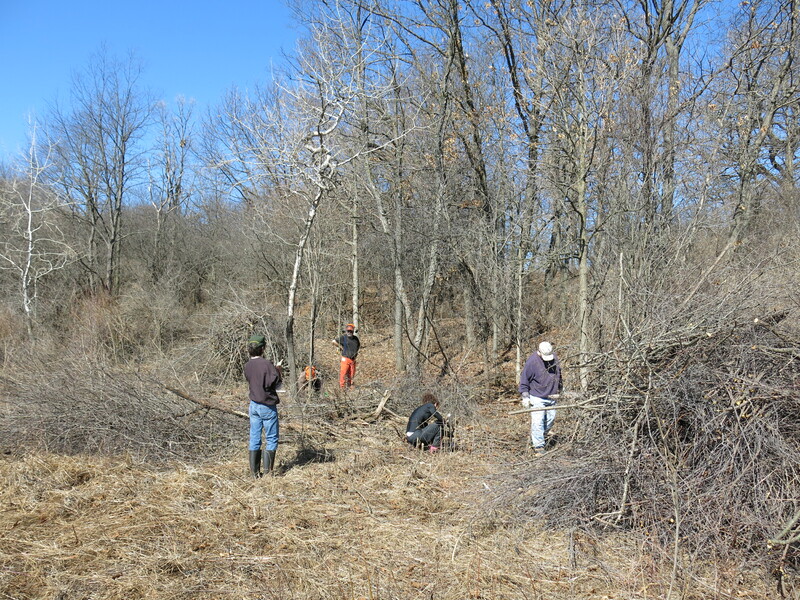 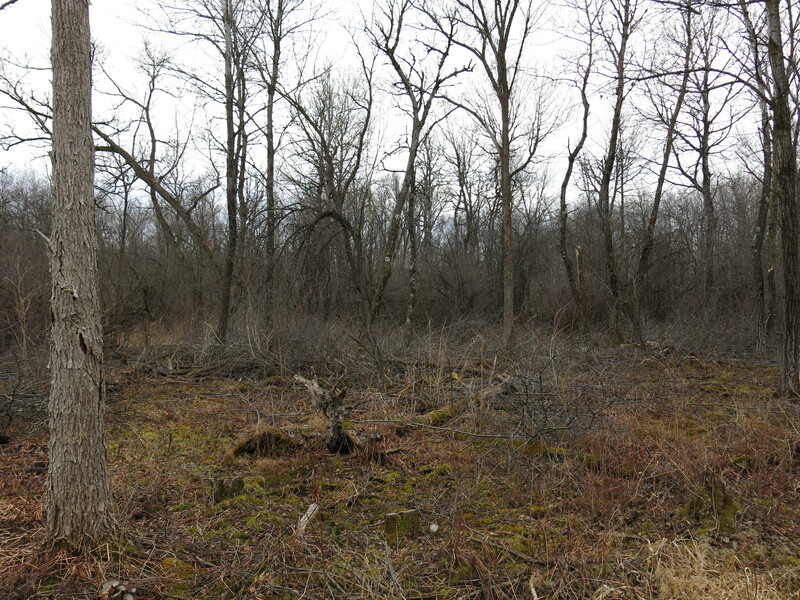 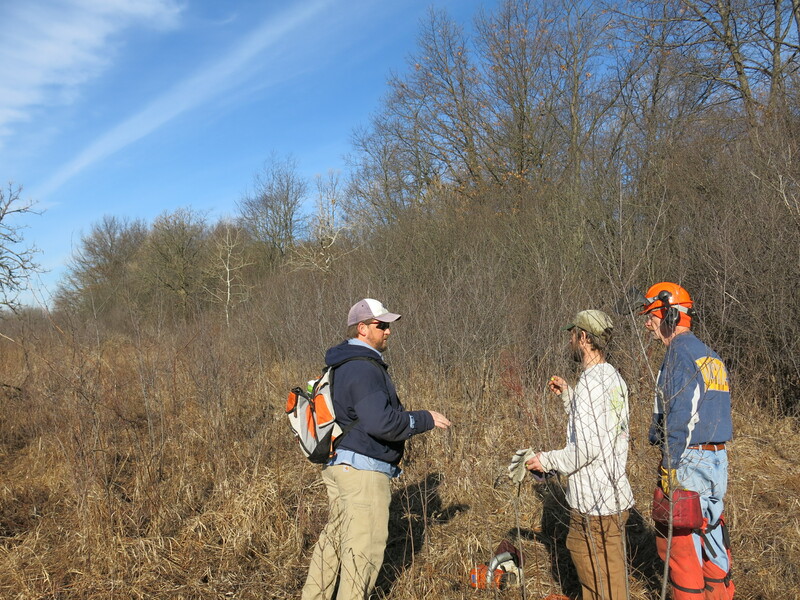 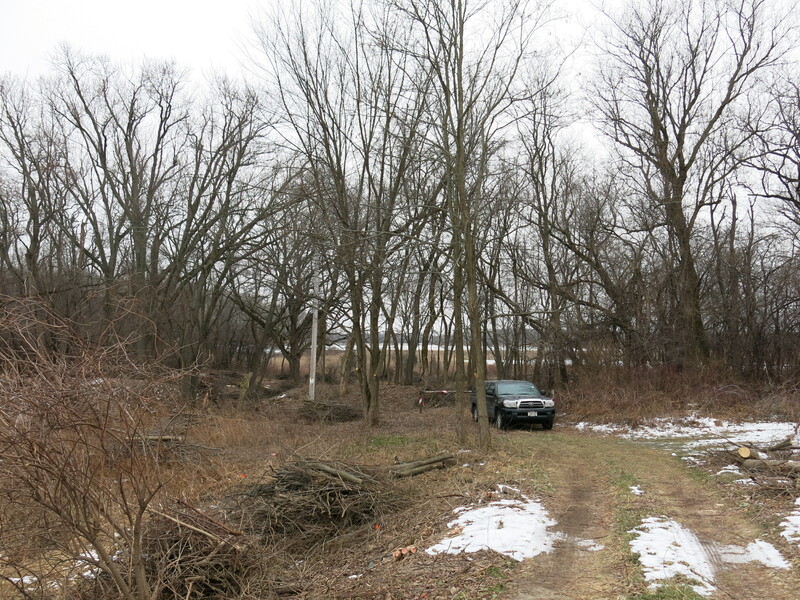 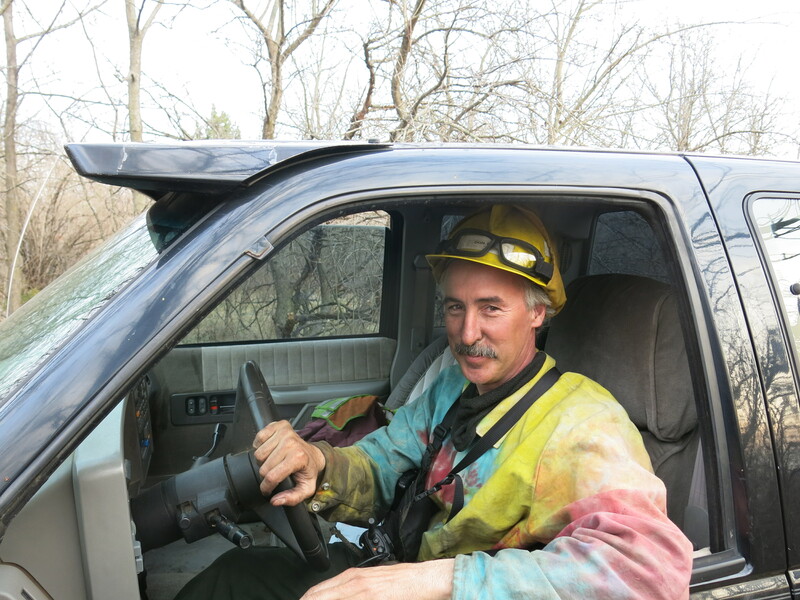 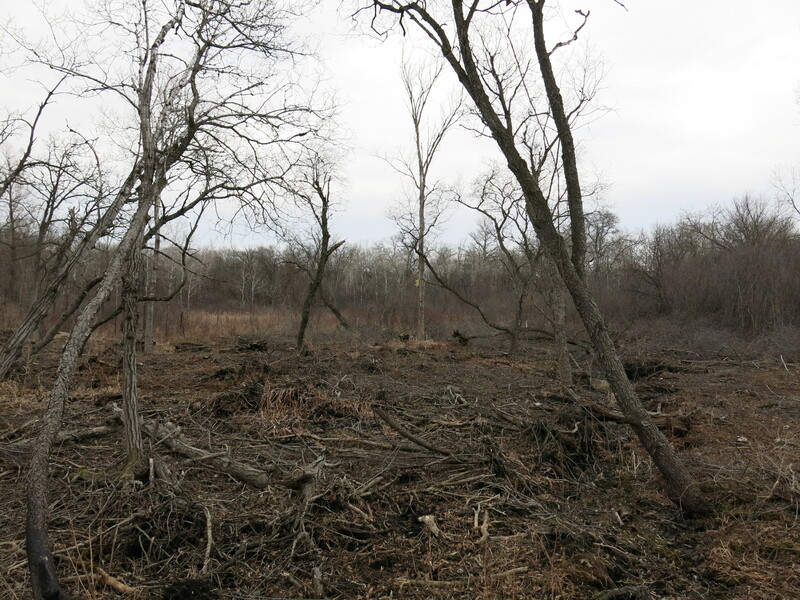 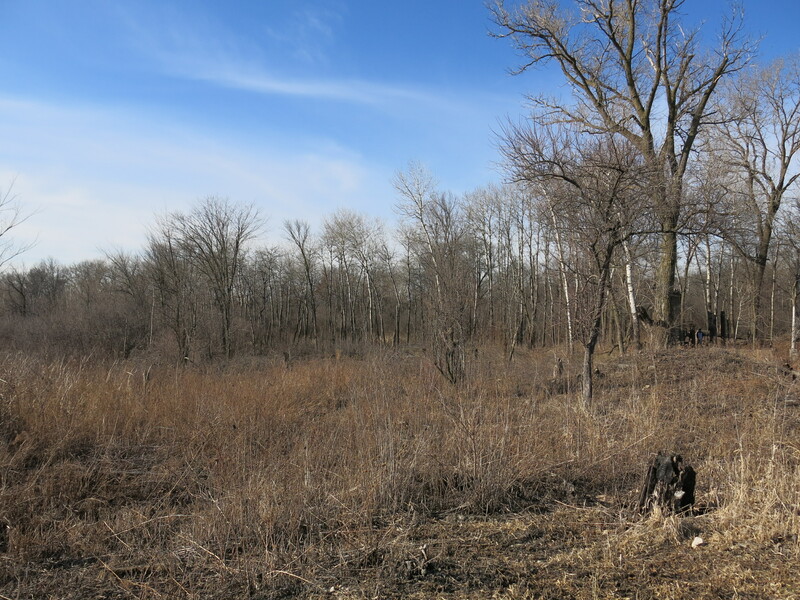 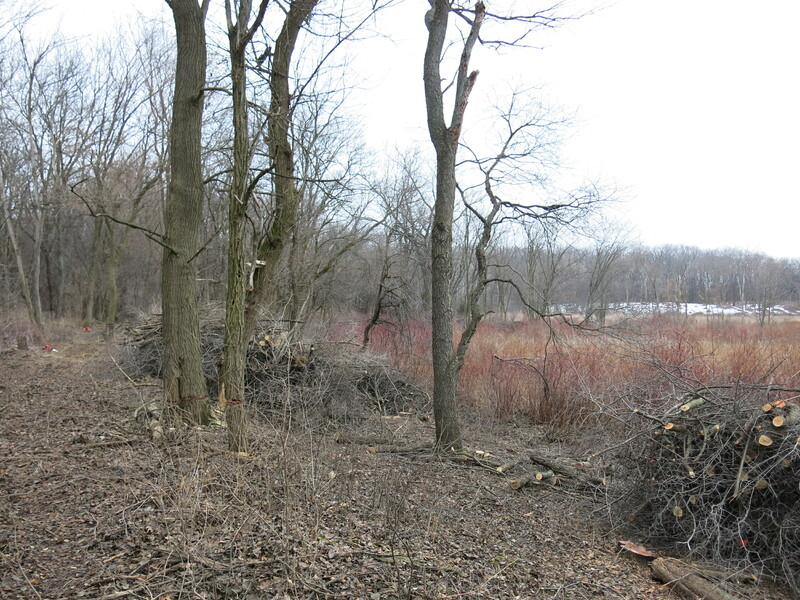 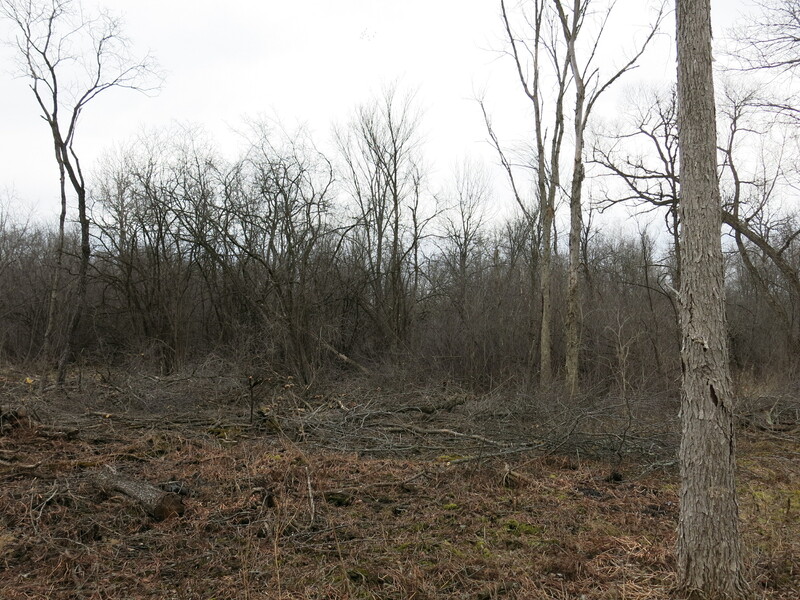 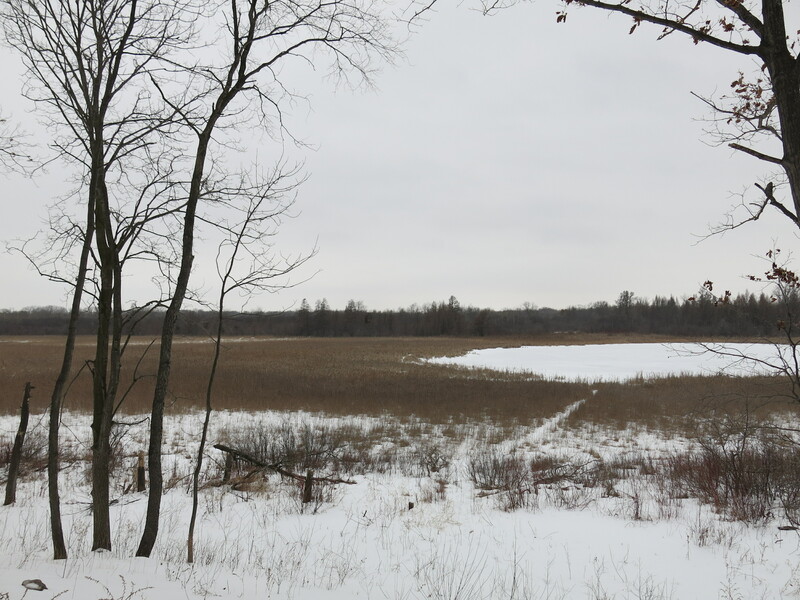 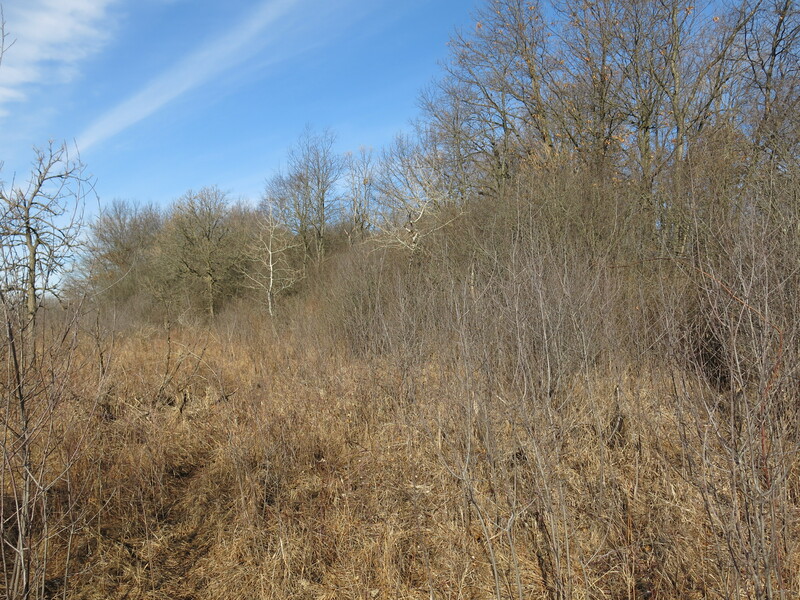 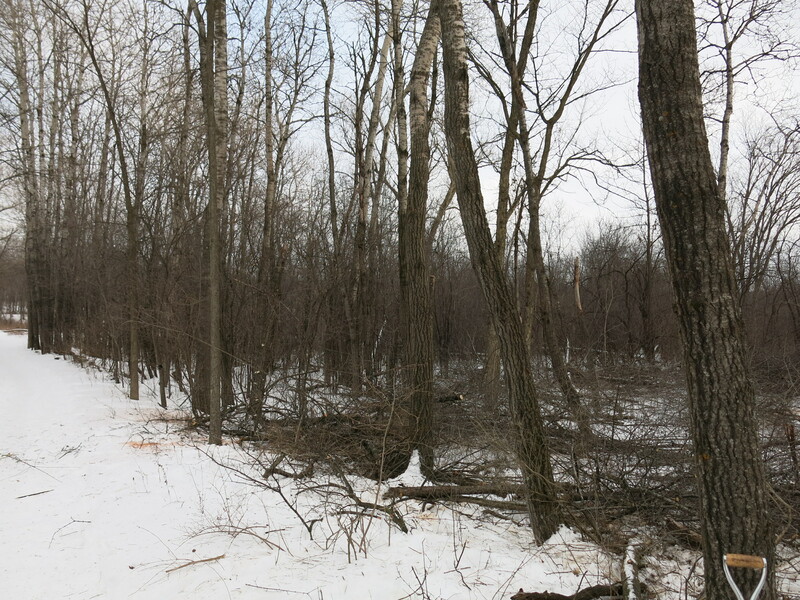 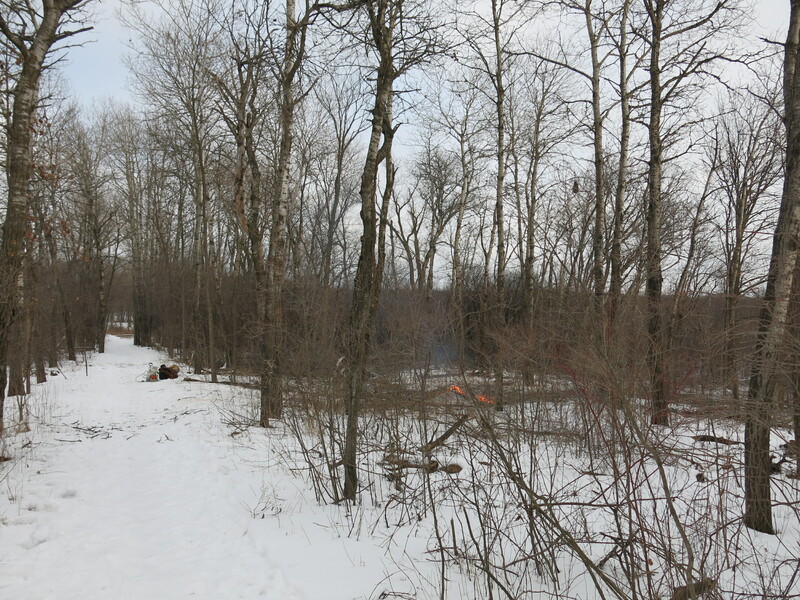 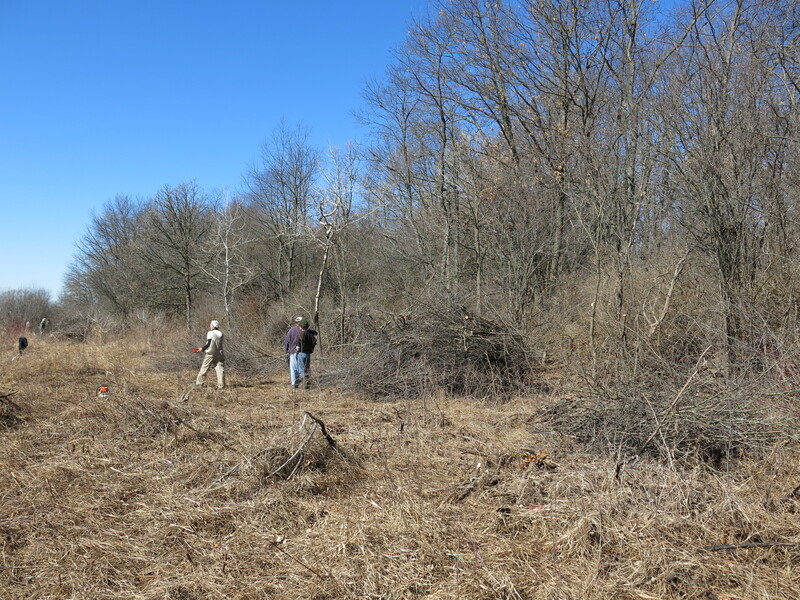 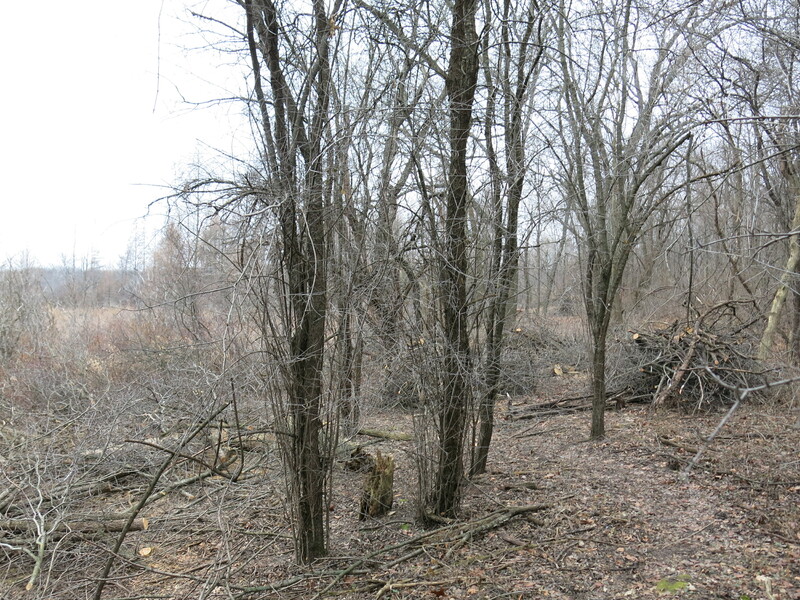 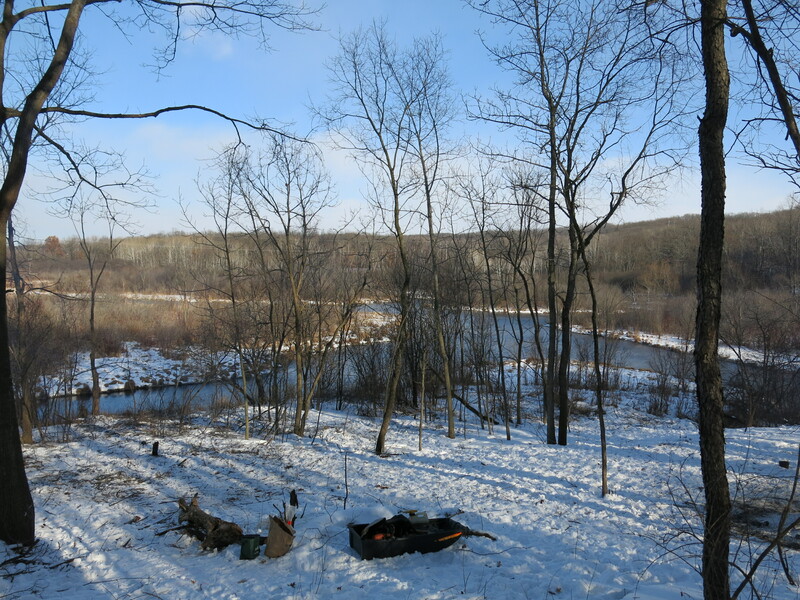 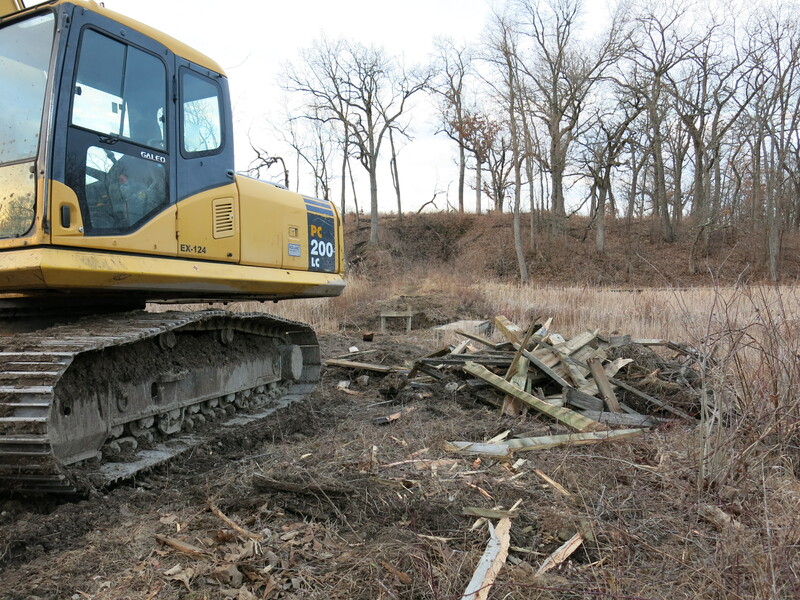 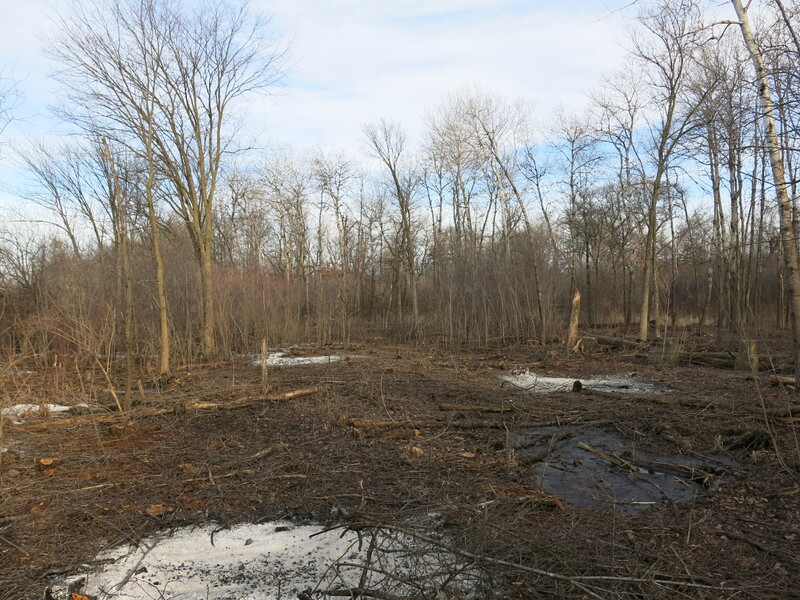 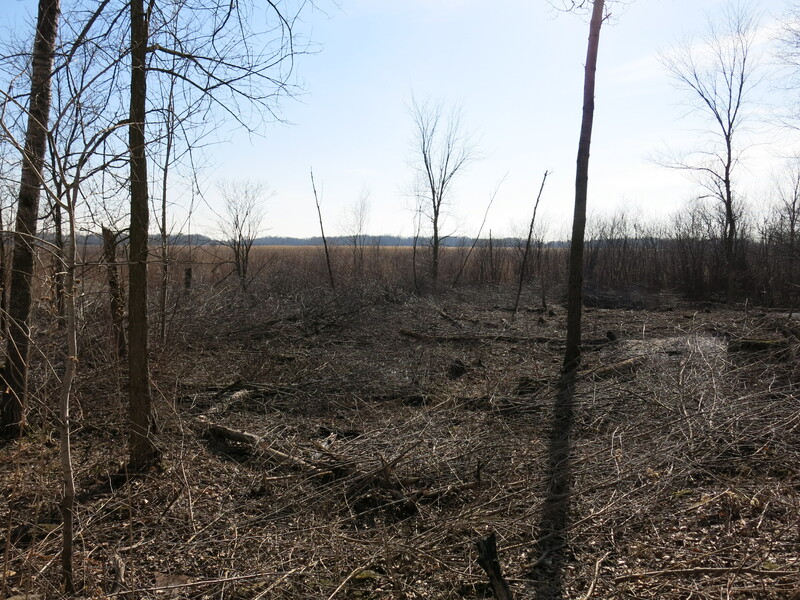 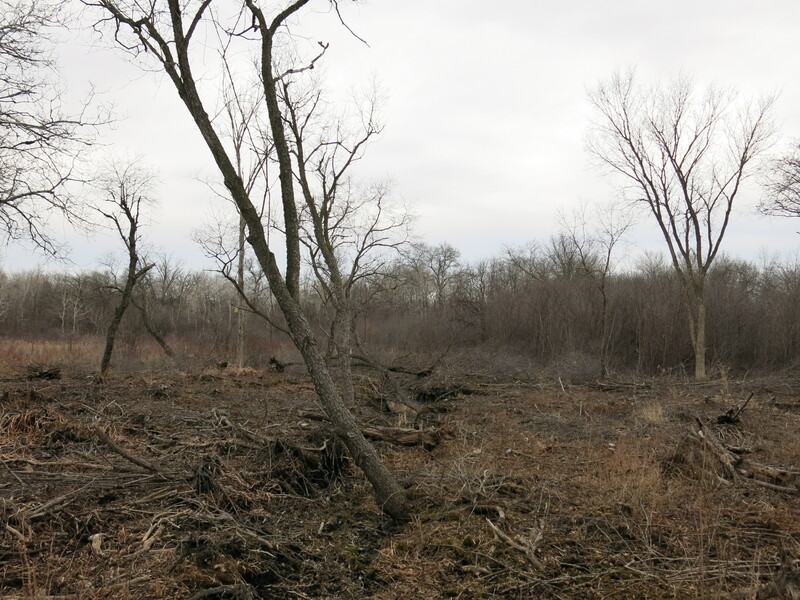 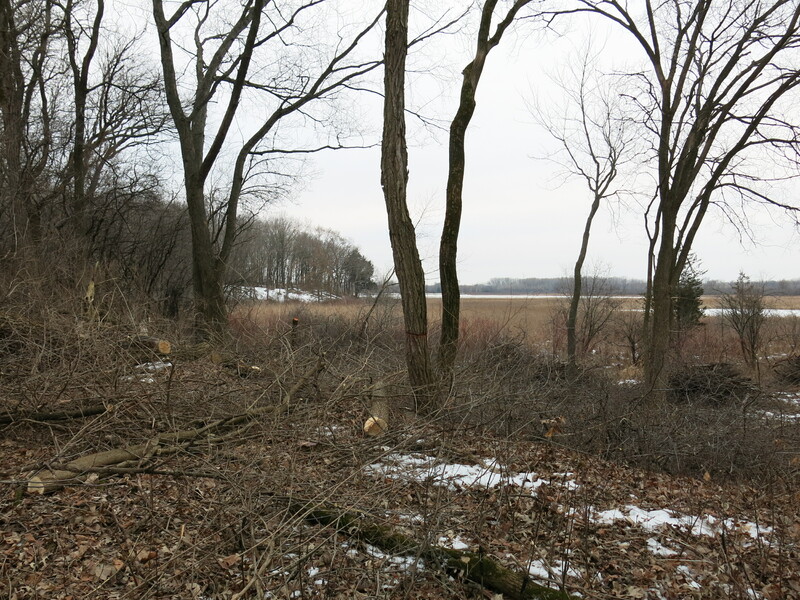 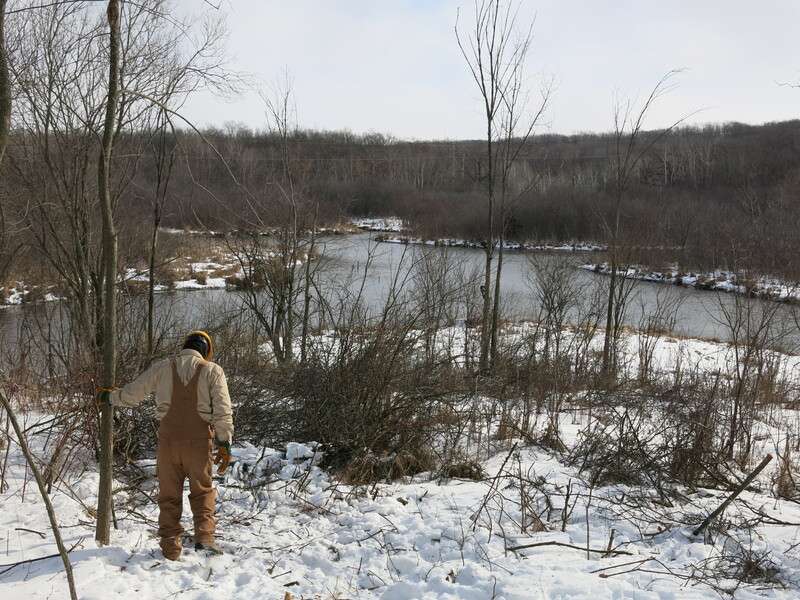 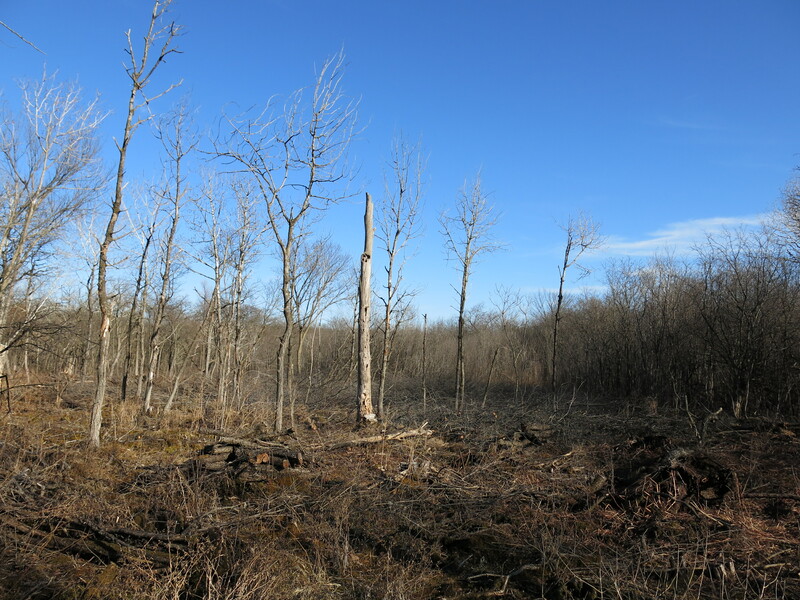 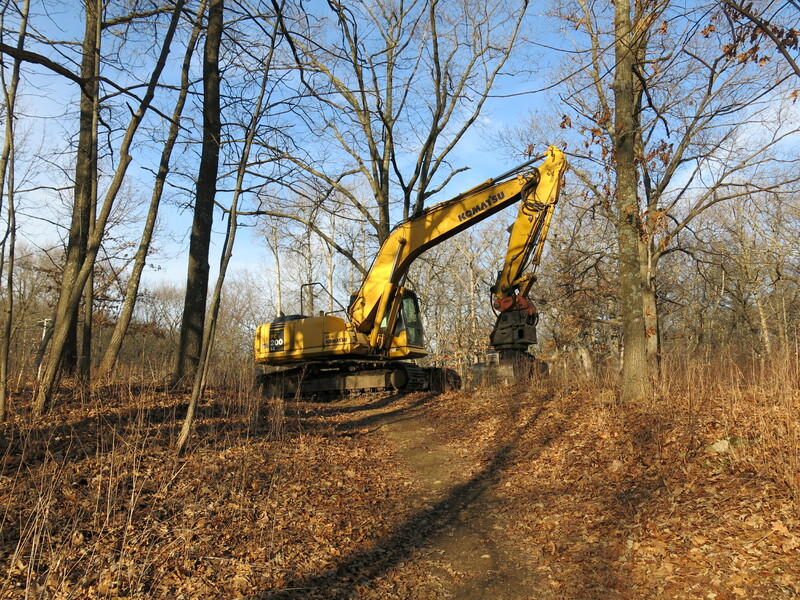 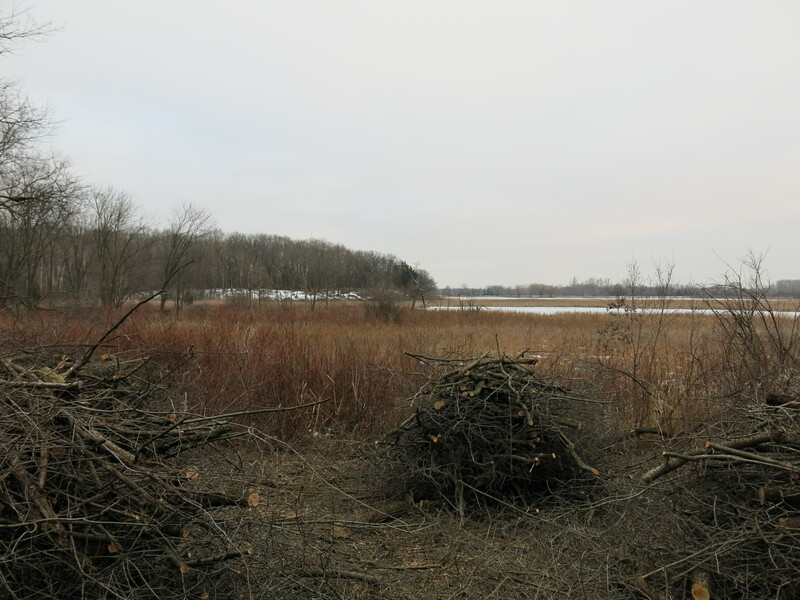 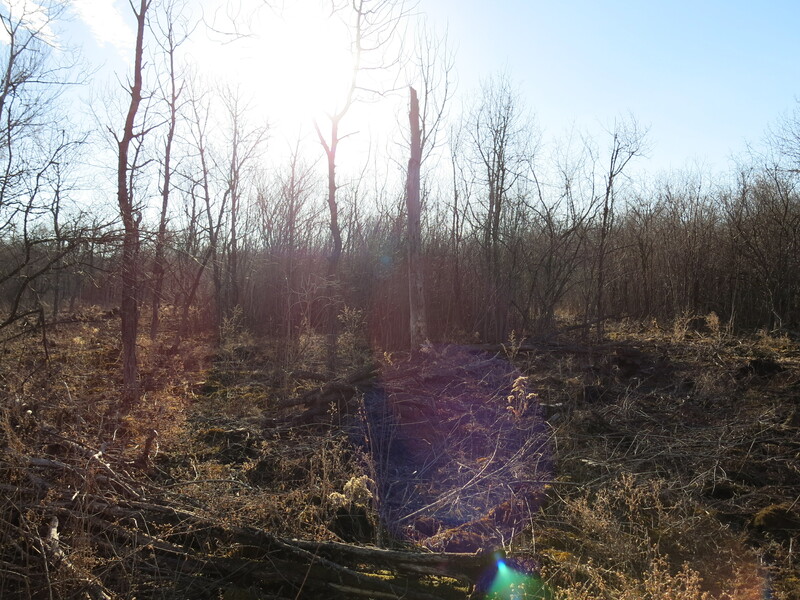 Back on Wednesday, December 10th, I was joined by Chris Mann, Austin Avellone and Andy Buchta as we continued our brush clearing and piling efforts on the north side of the Ottawa Lake Fen SNA. 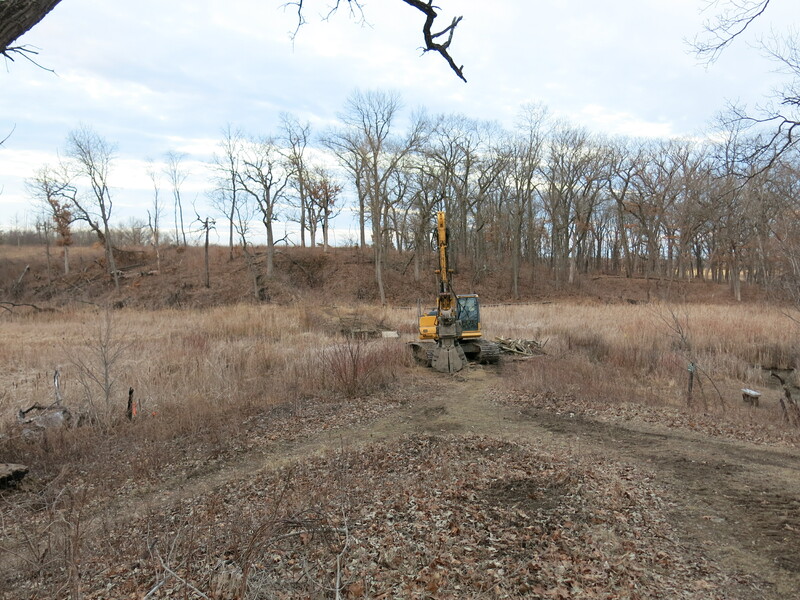 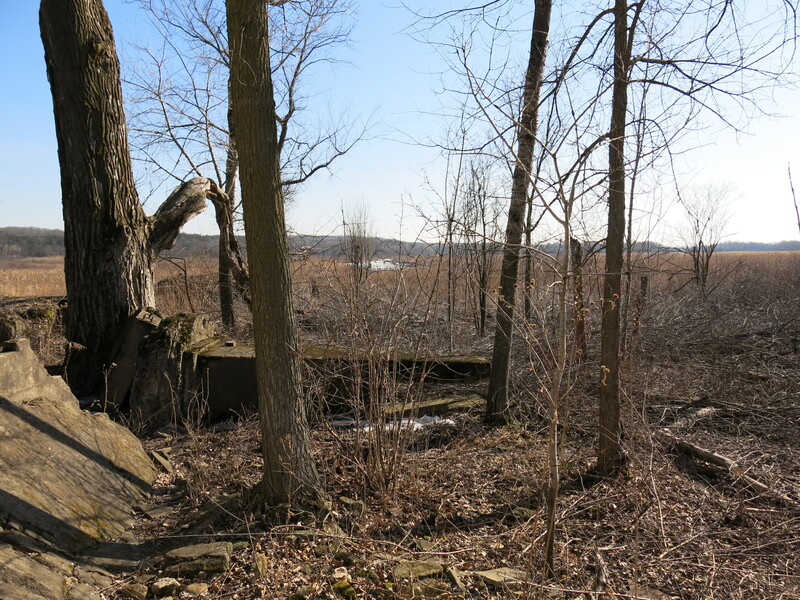 Here are a couple views of the site before we got started. 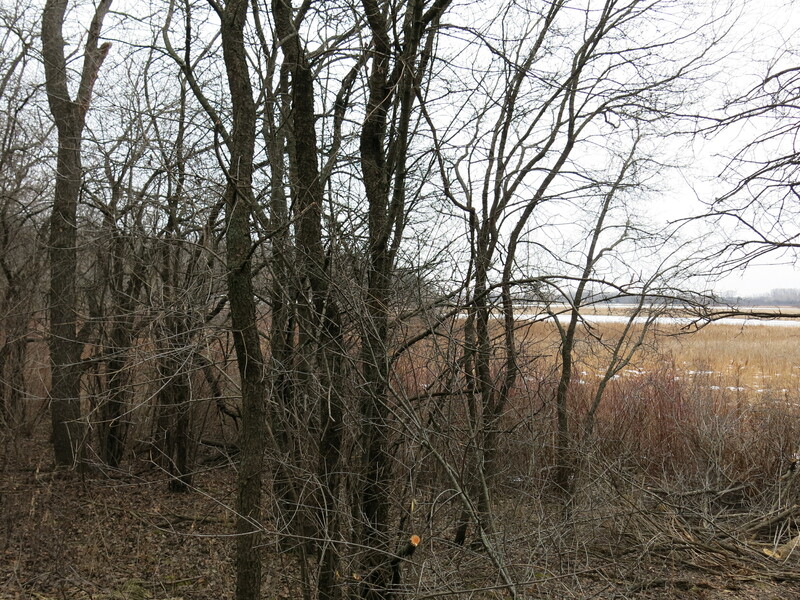 Looking north from the channel of the spring that flows into the fen. 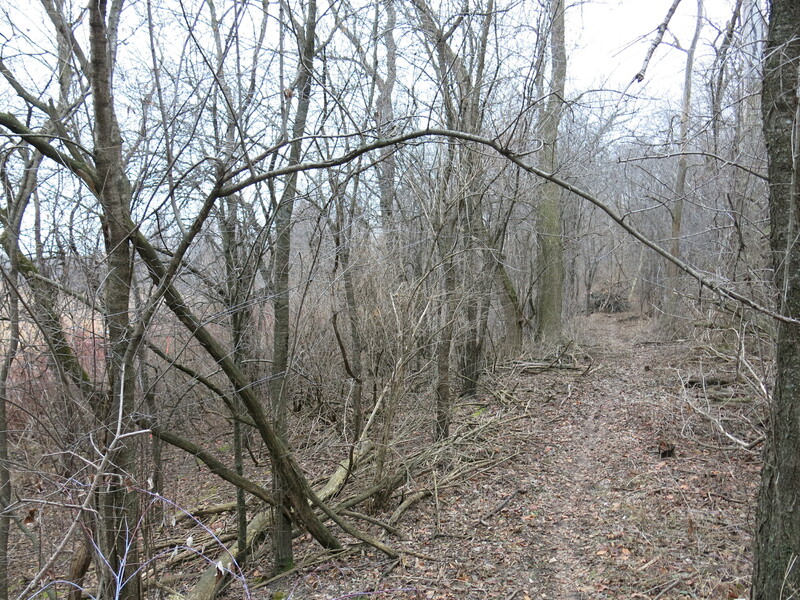 Looking down the trail towards where we left off last time. 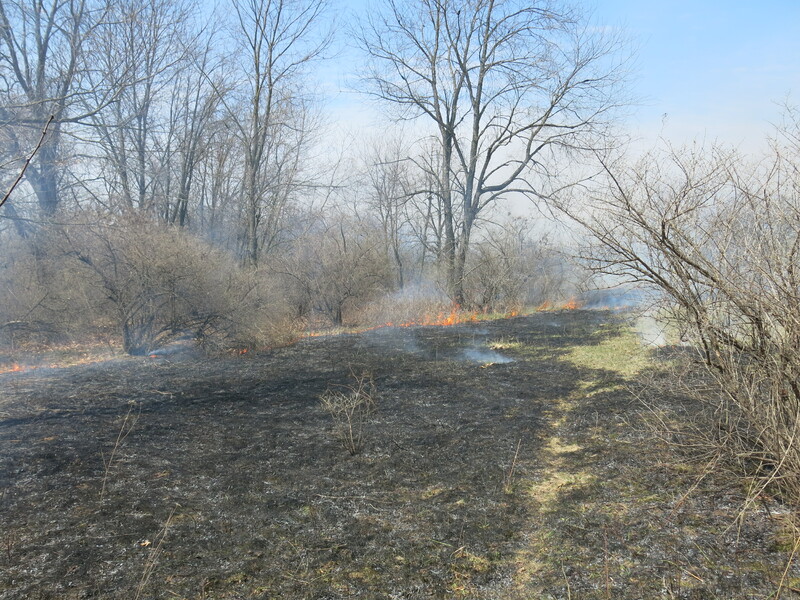 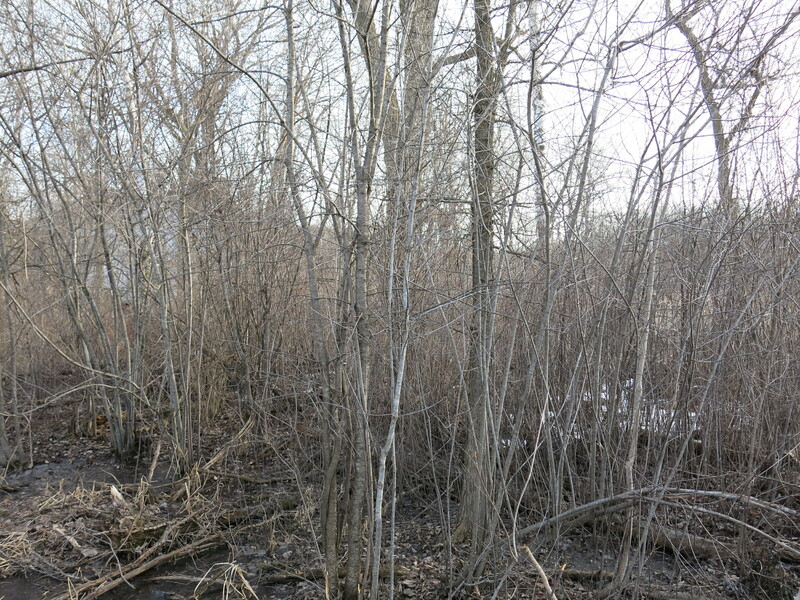 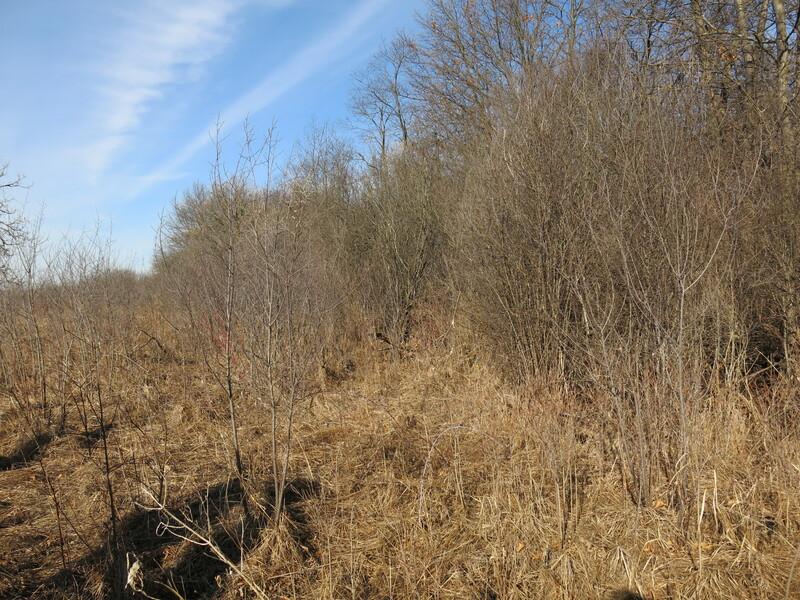 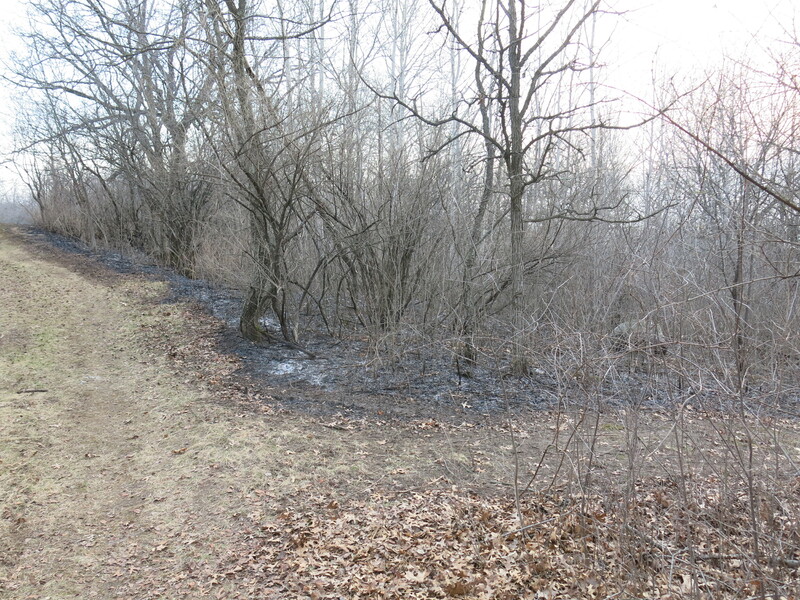 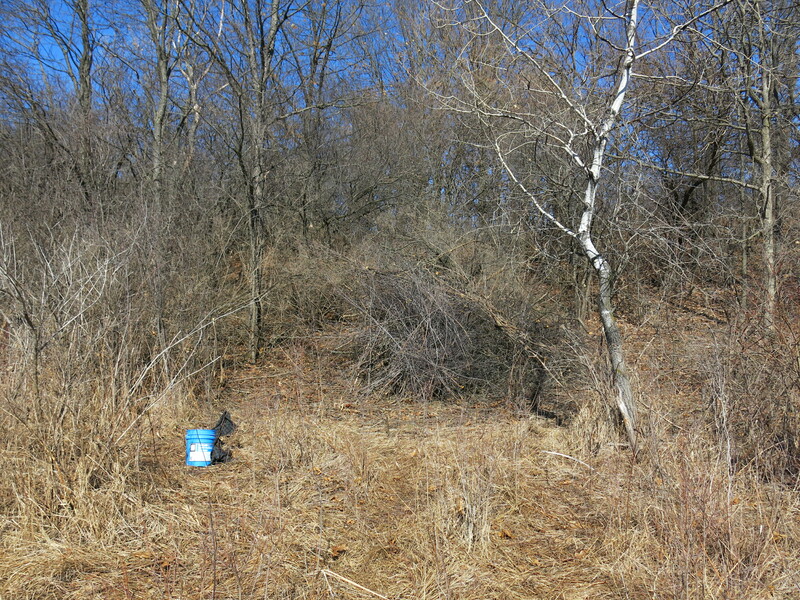 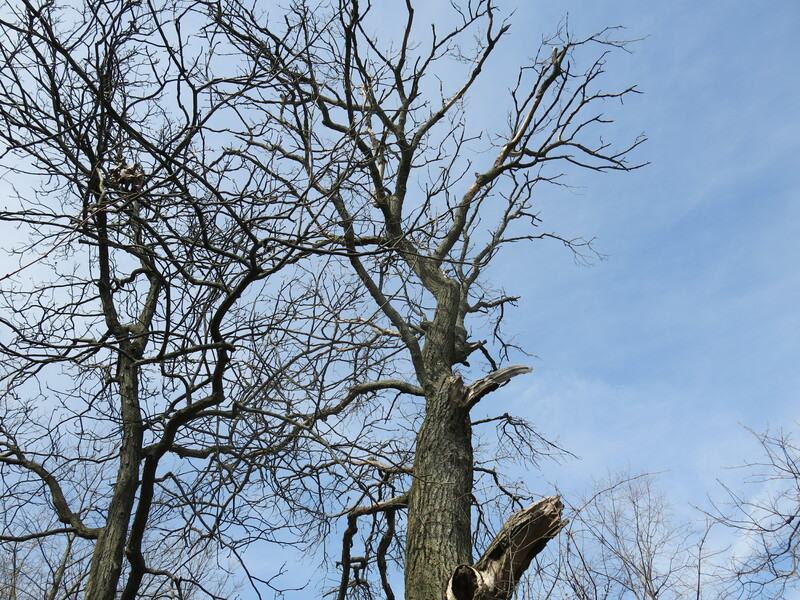 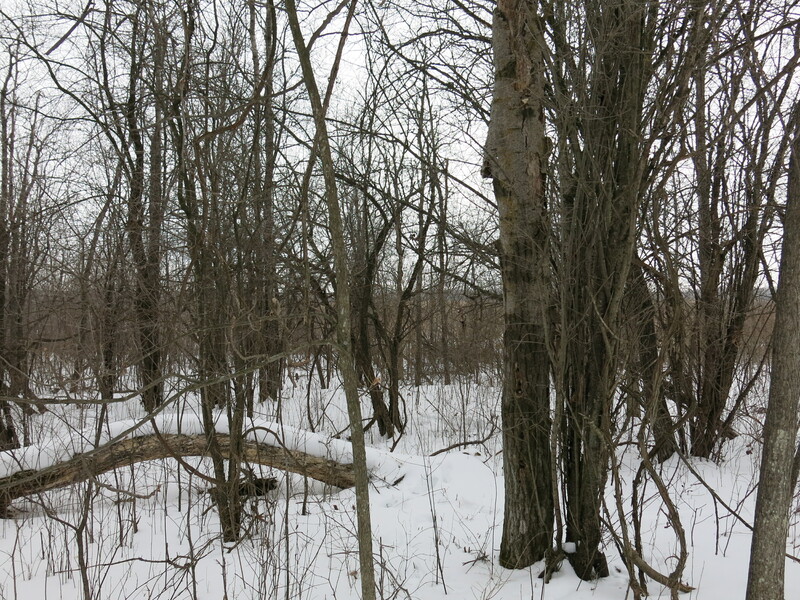 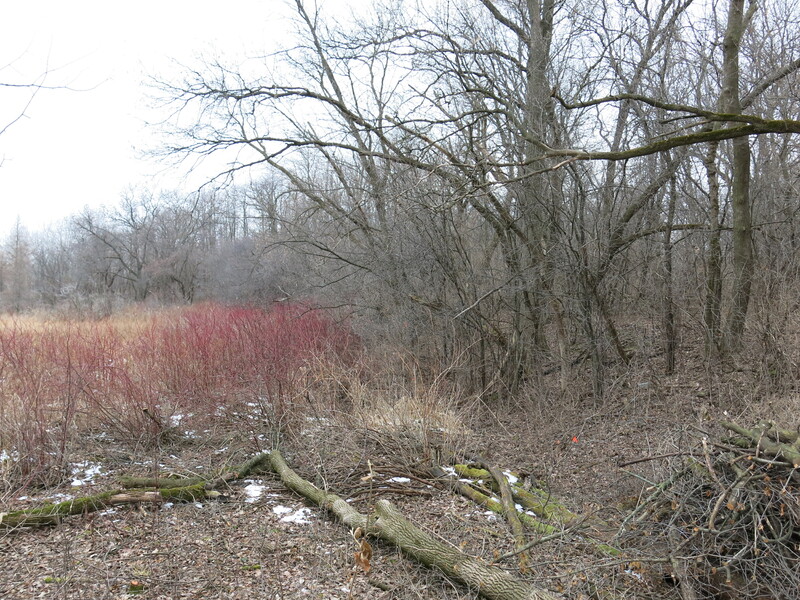 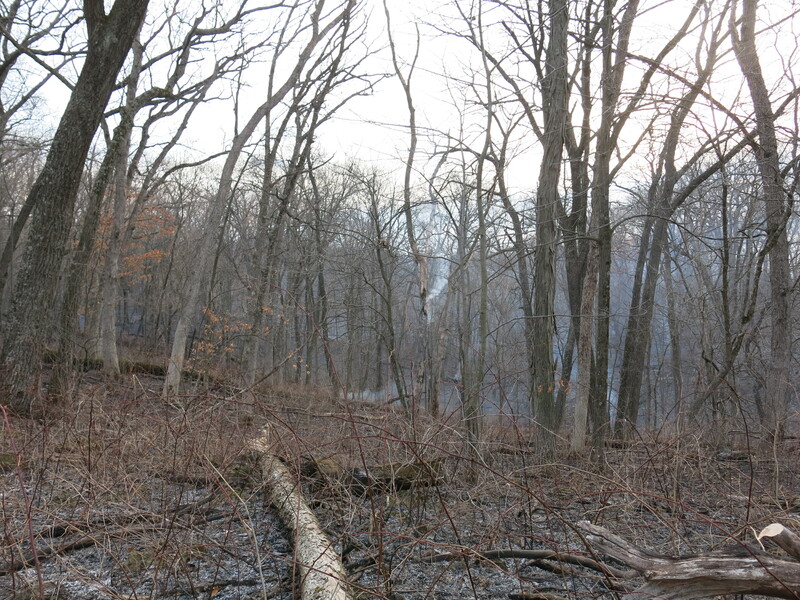 The buckthorn on the left is doomed. 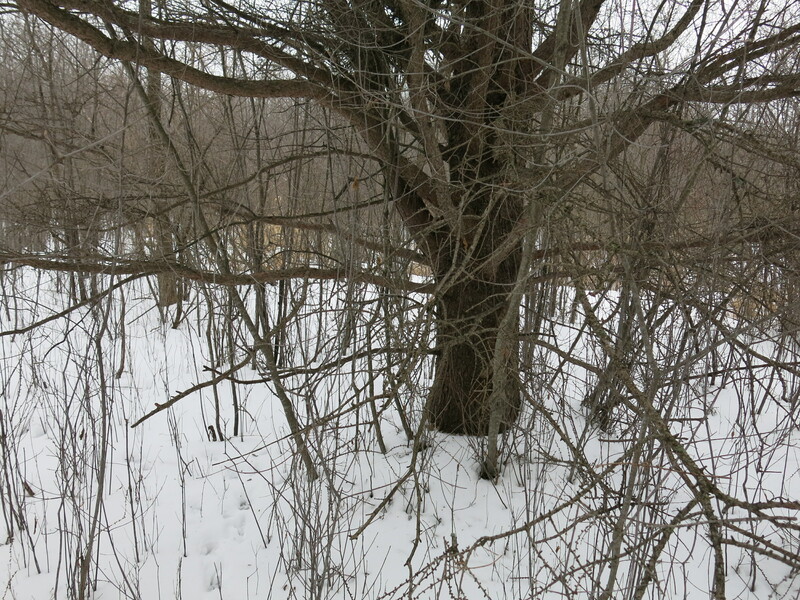 Below looking right and left from where Chris Mann left off the previous Monday. 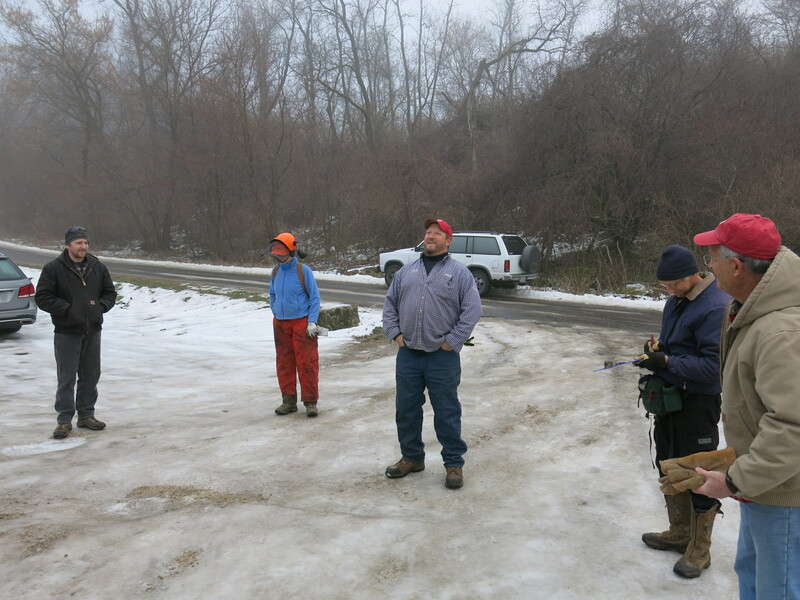 I was soon joined by Chris, Austin and, much to my delight, Andy Buchta and we got after it. 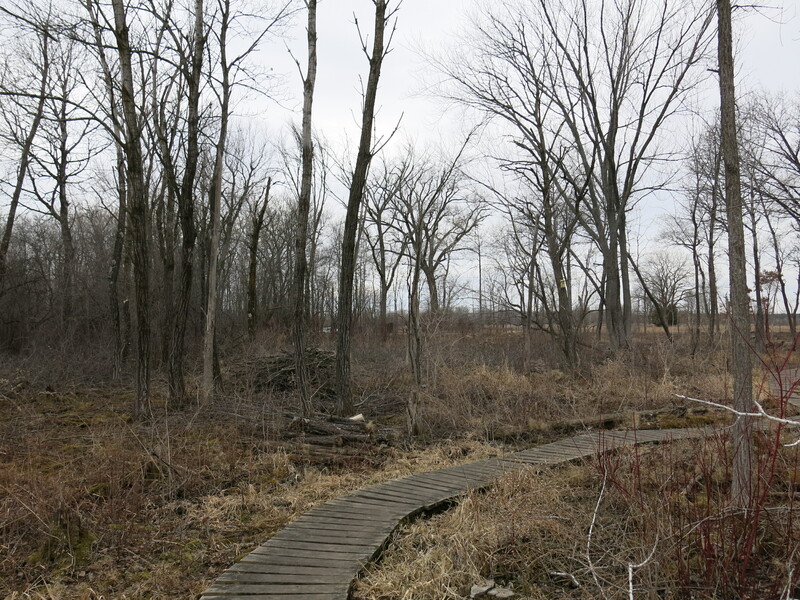 We had an excellent day and finished the fen-side of the trail all the way north to the tamarack grove; and even got a few licks in on the south side of the spring channel that flows into the fen, working along the trail that leads to the Ottawa Lake campground. 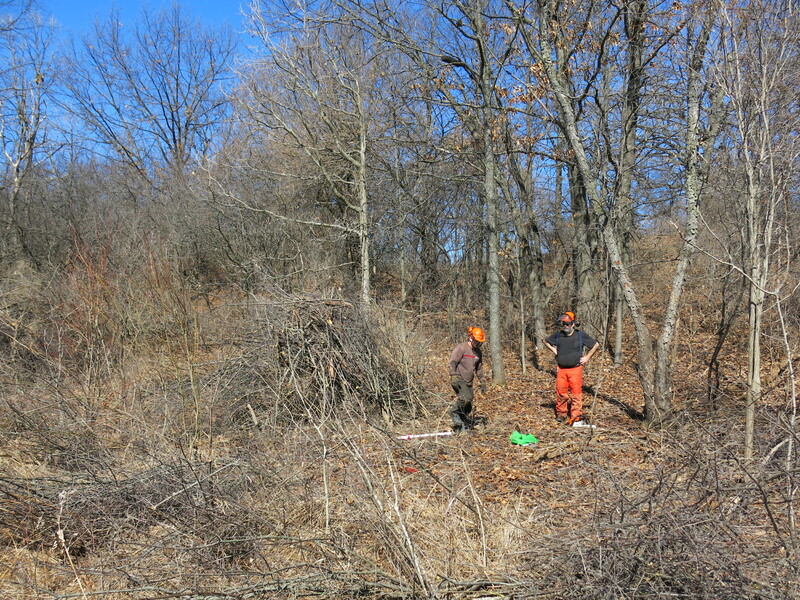 When we finished I took a walk from the point where we stopped, shown above, heading back across the channel to where Chris and Austin were still piling brush. 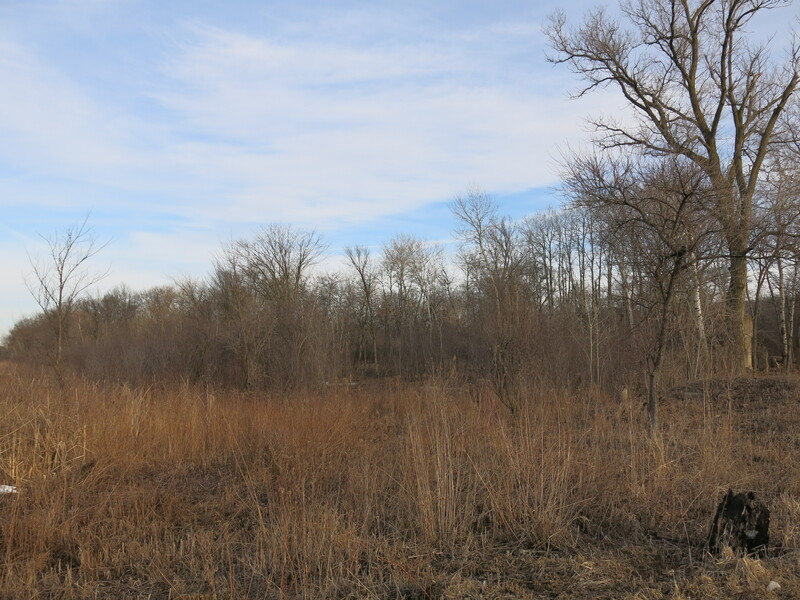 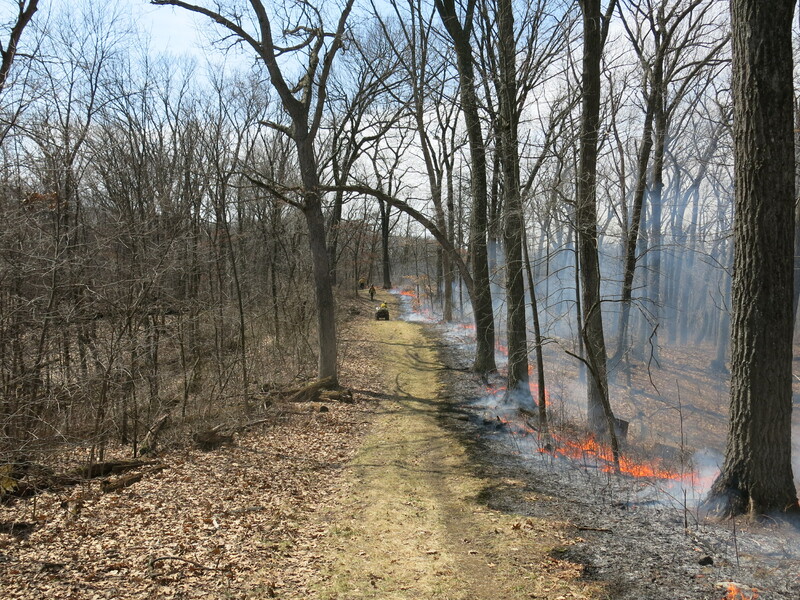 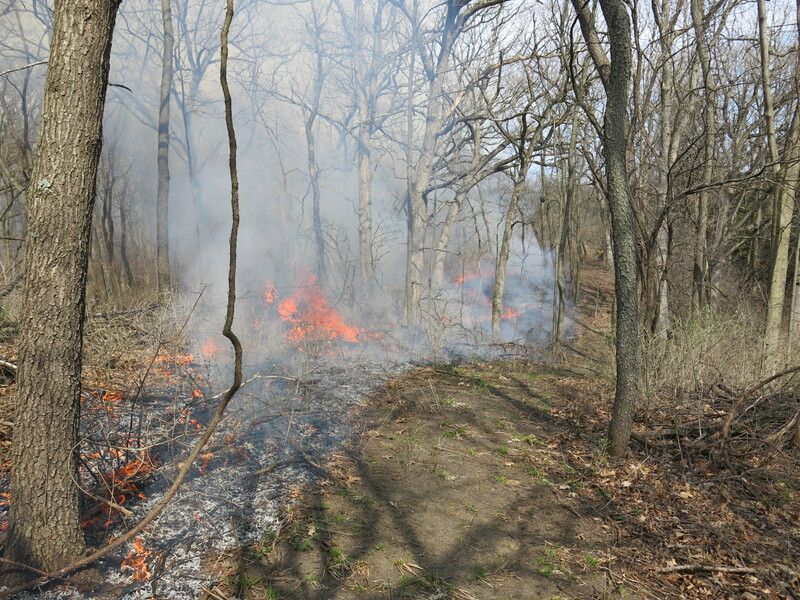 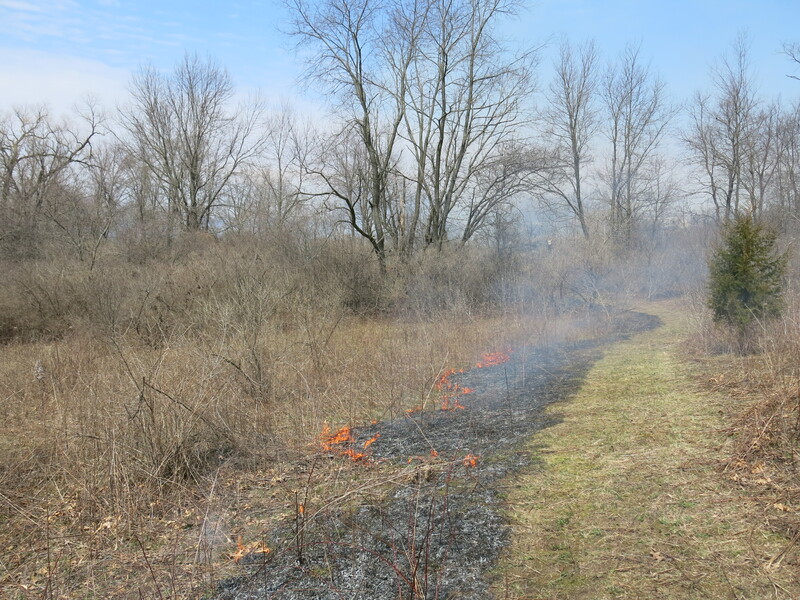 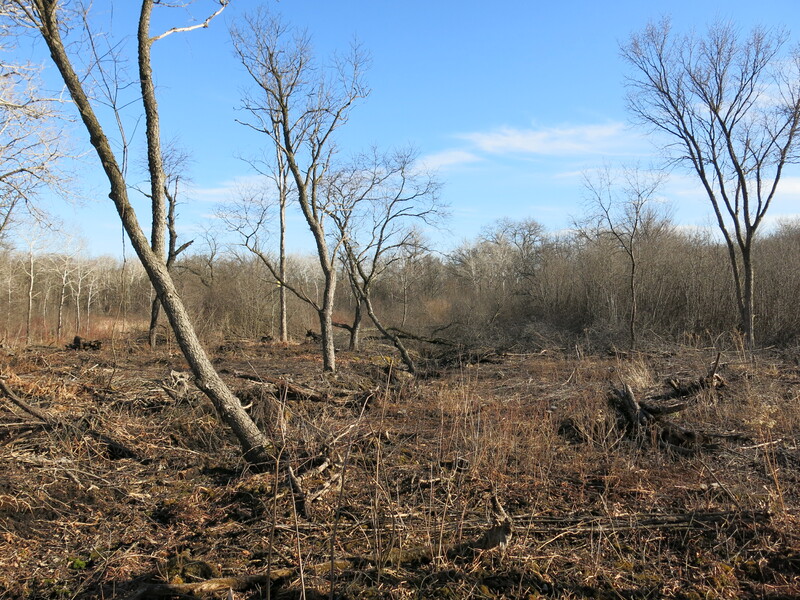 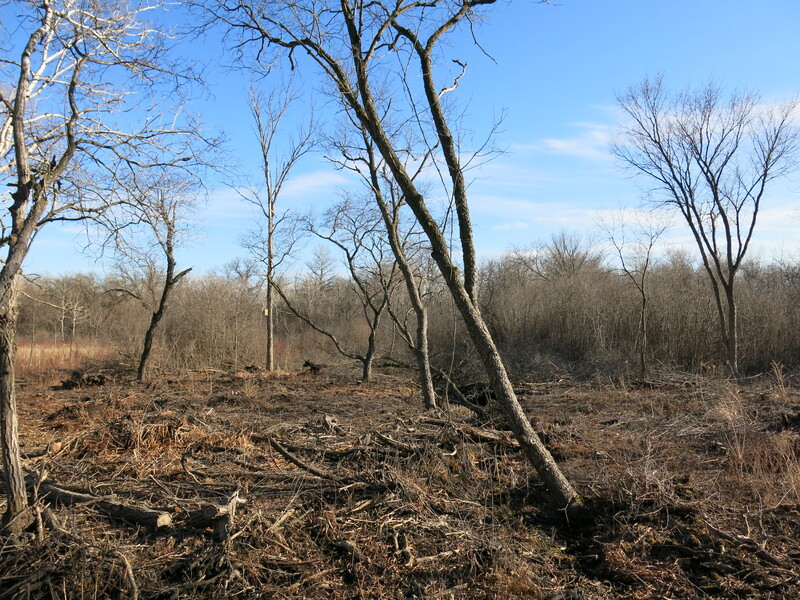 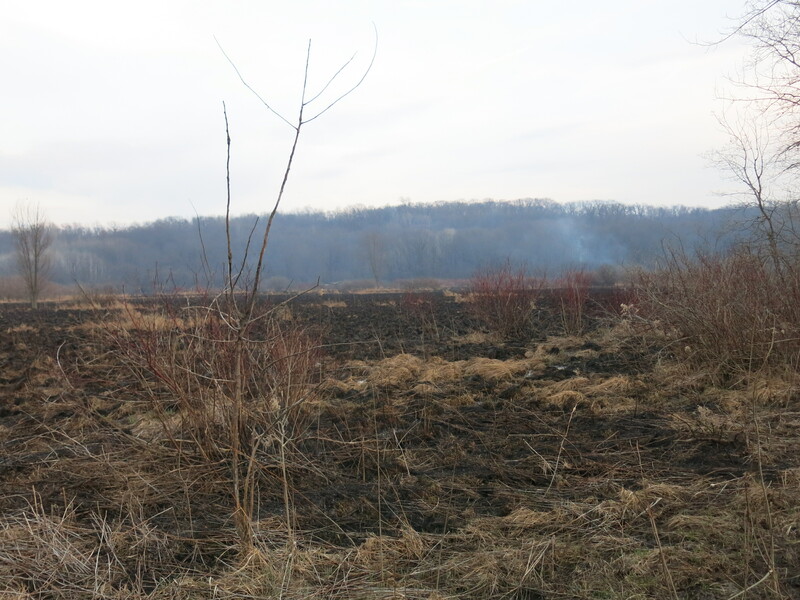 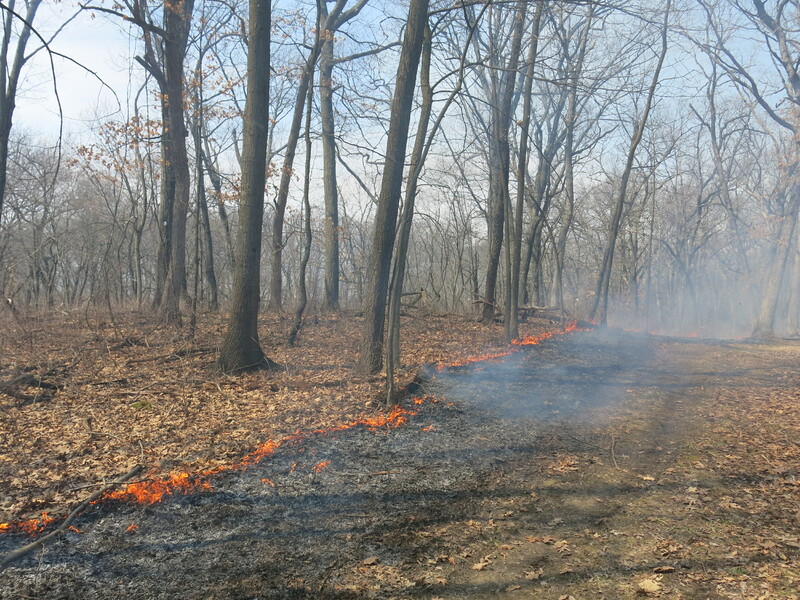 I had a mellow day last Thursday brush cutting and poisoning the scrub red oak, cherry and buckthorn on the sand prairie. 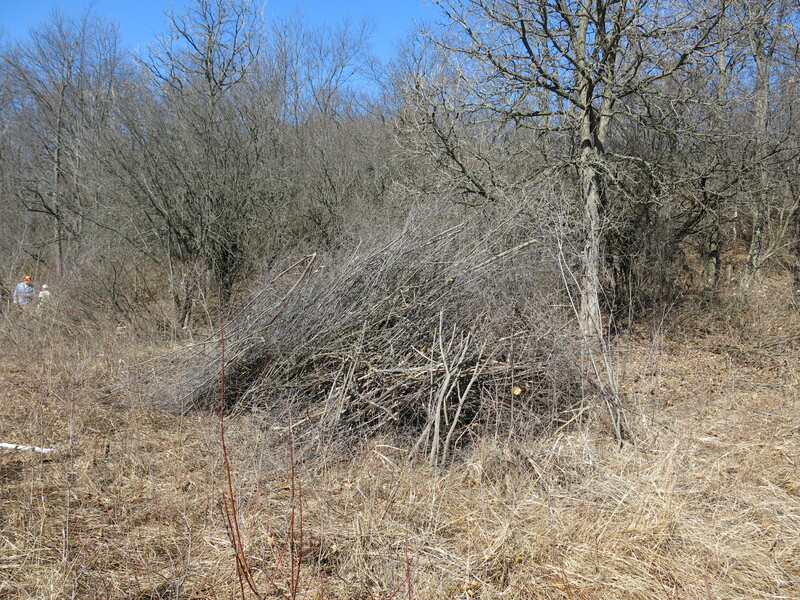 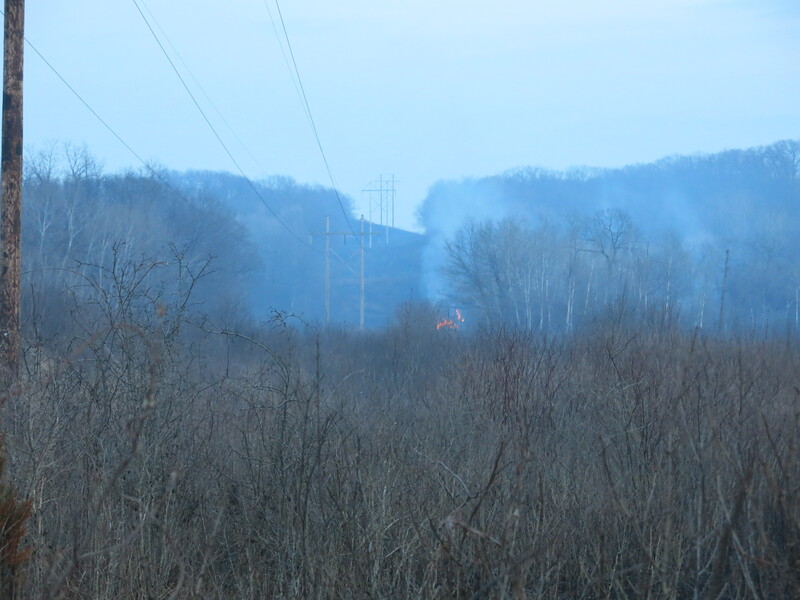 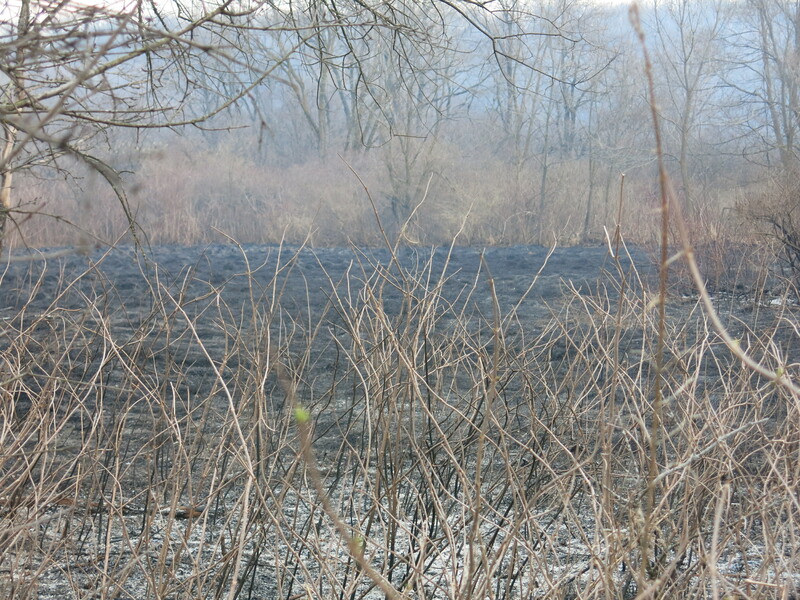 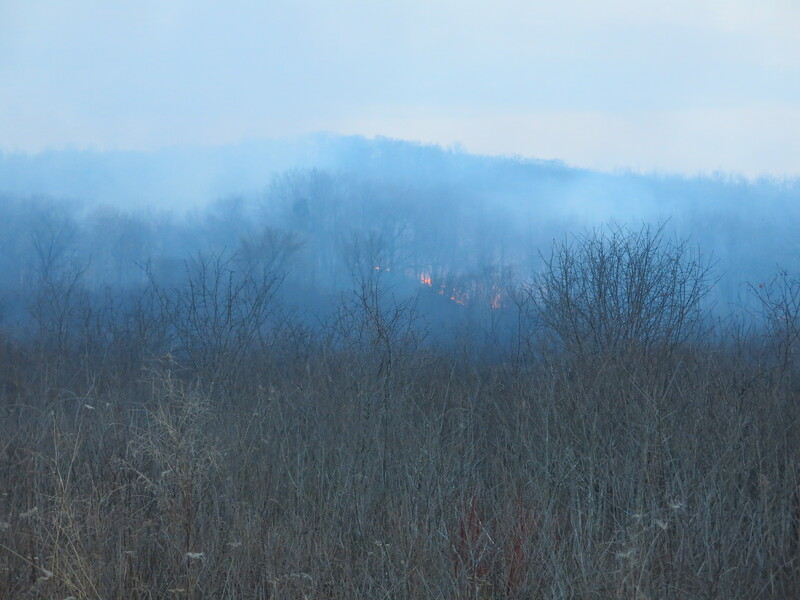 I think it’s time to start burning brush piles.